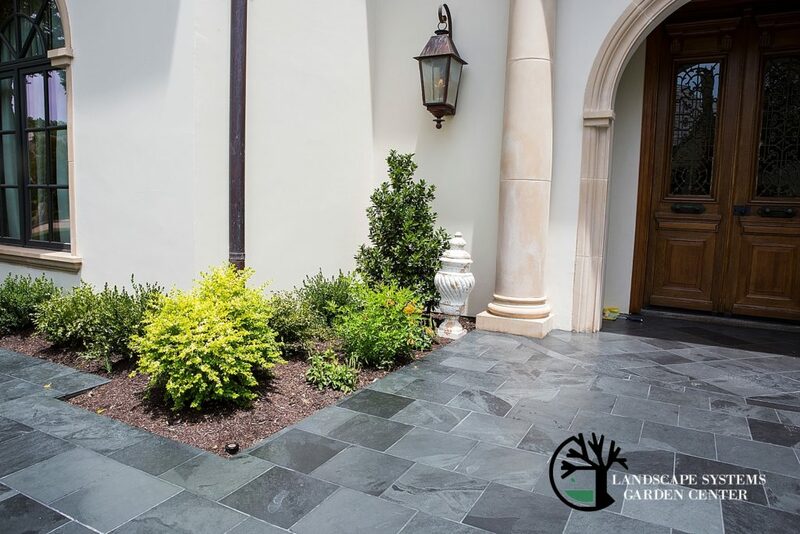 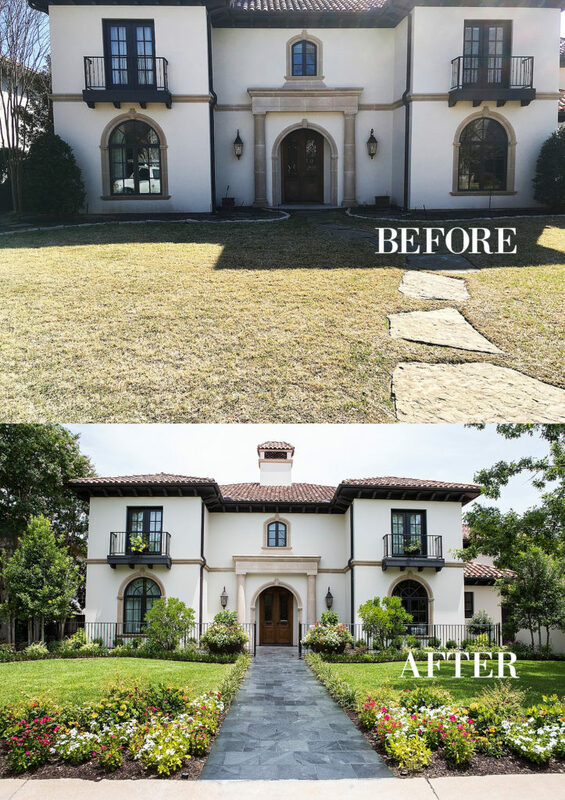 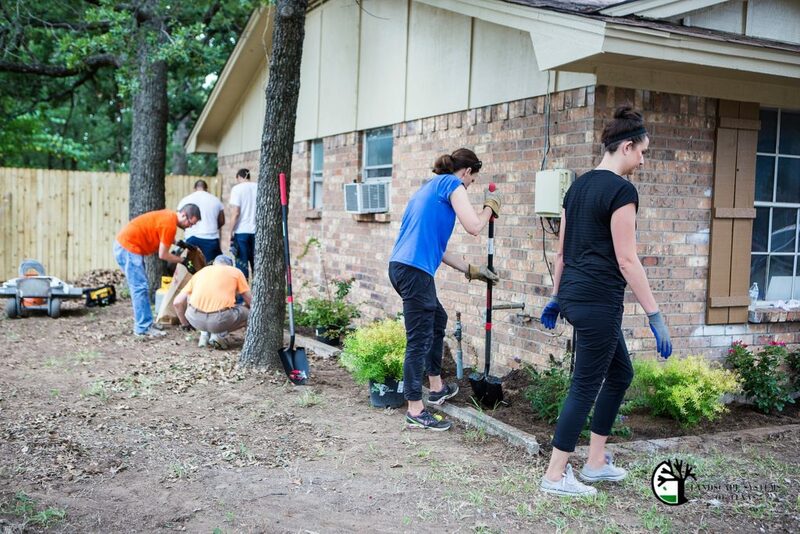 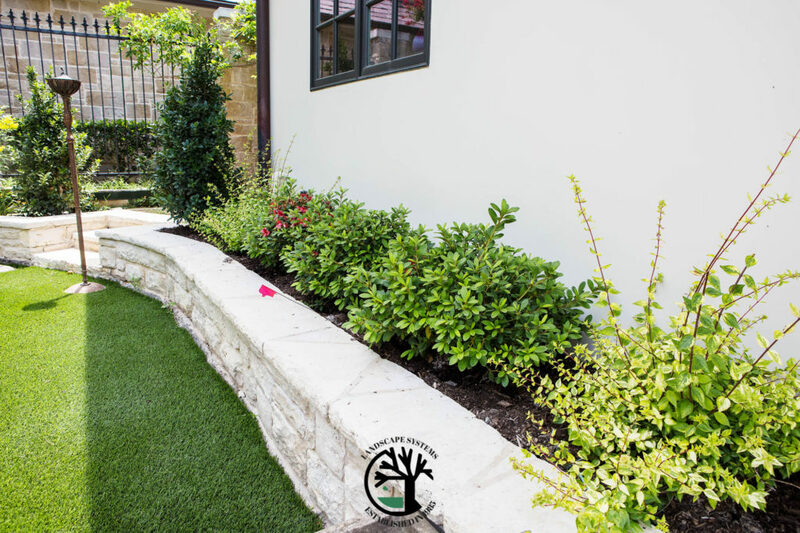 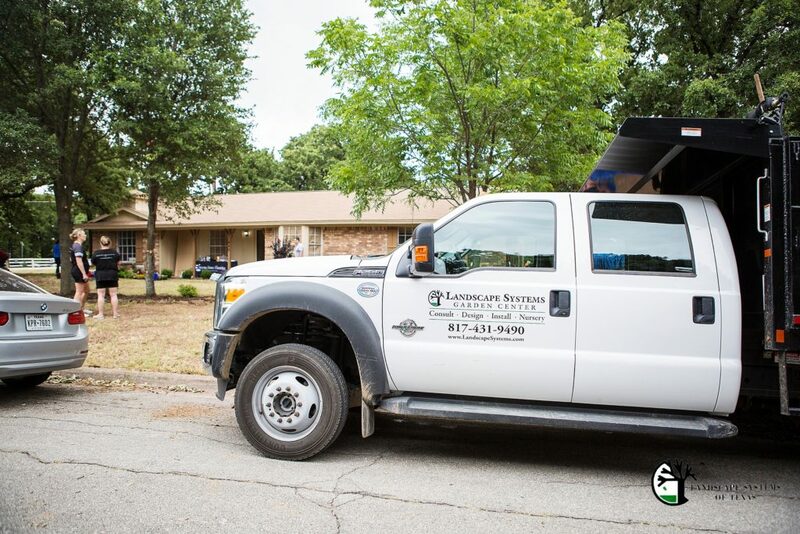 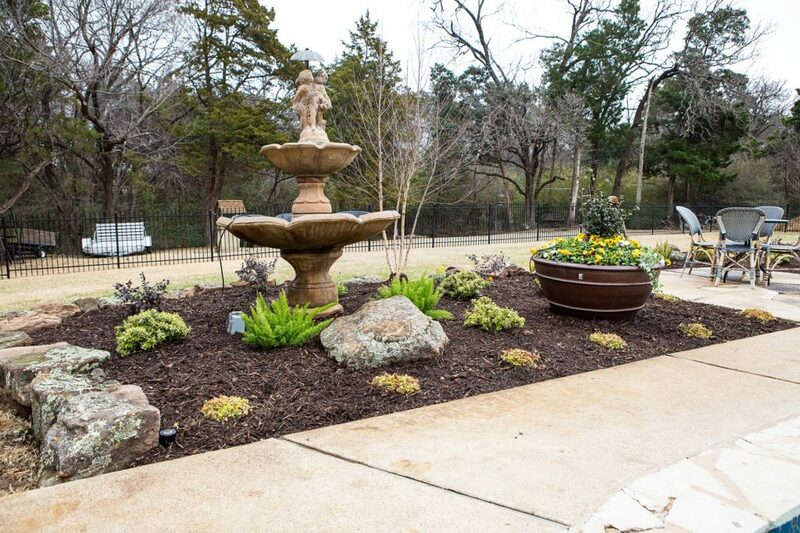 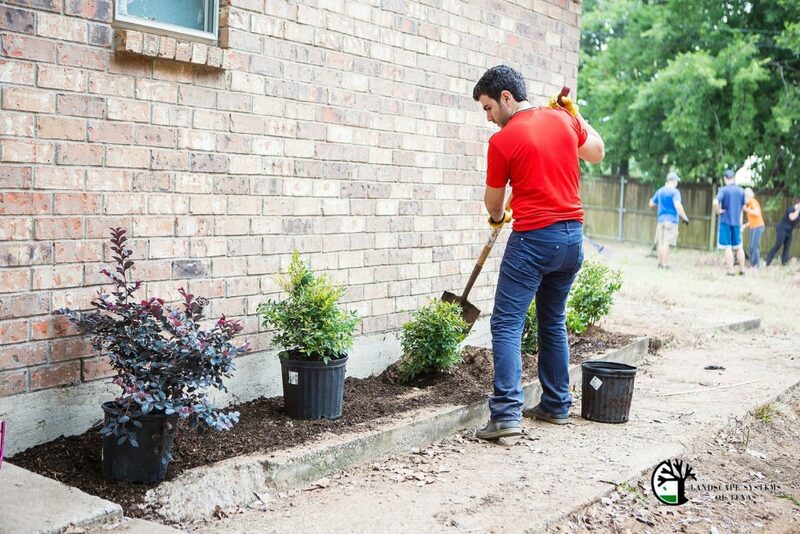 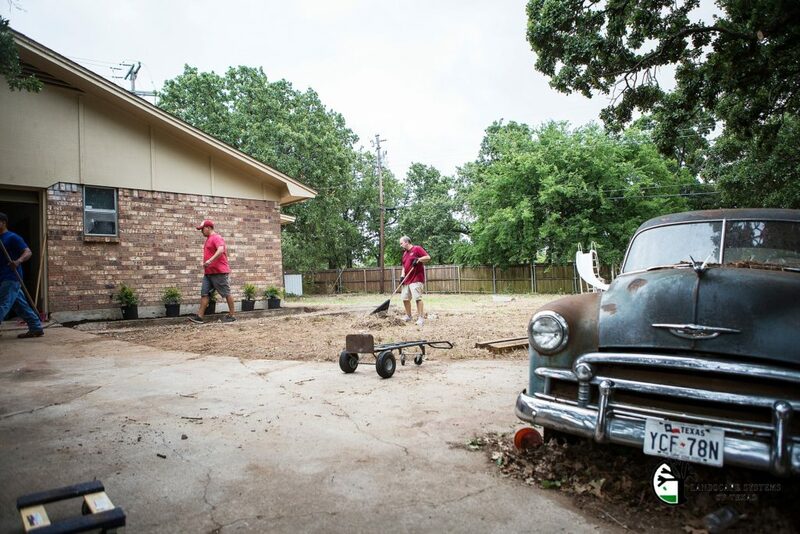 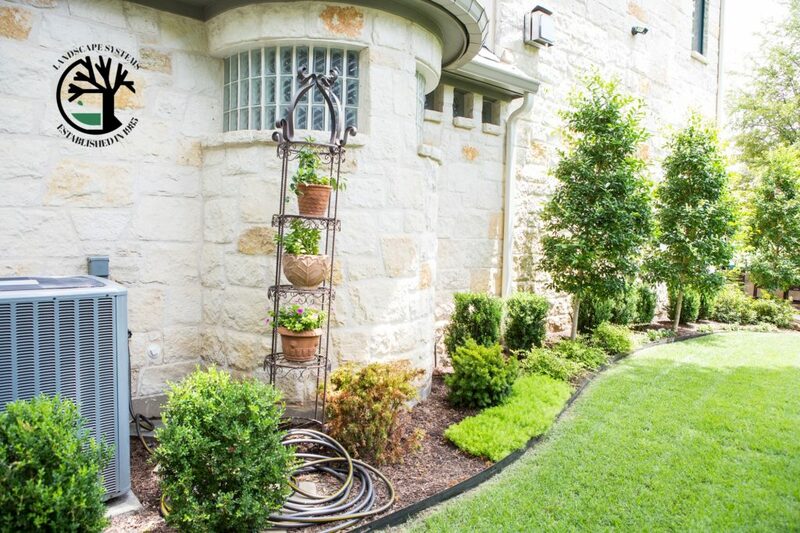 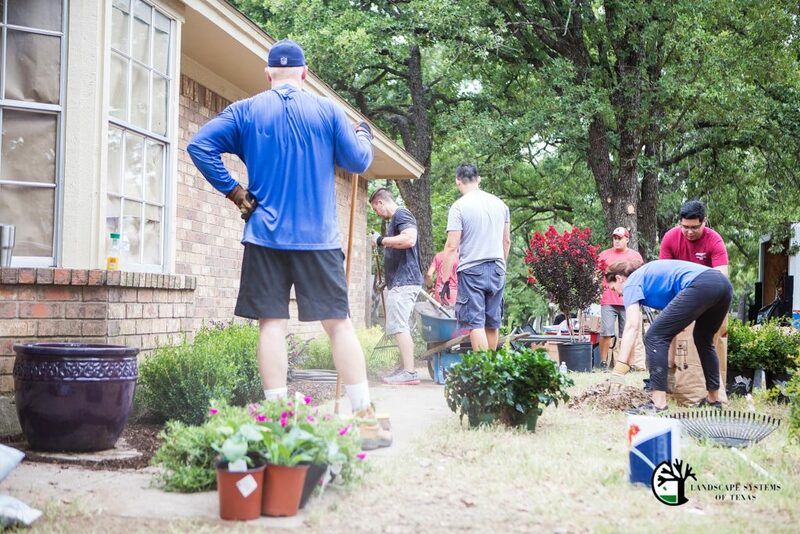 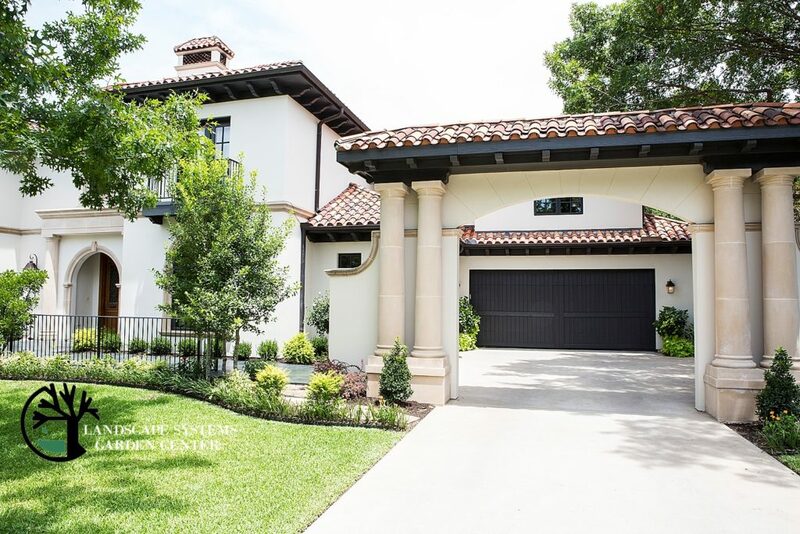 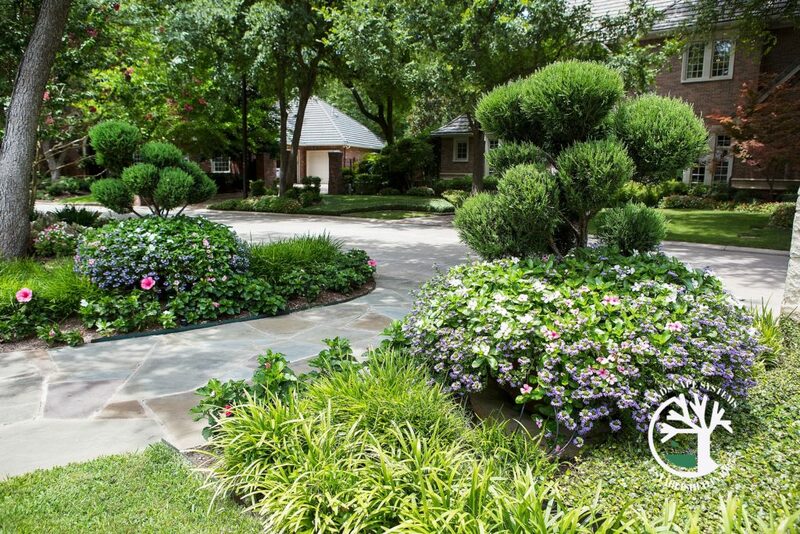 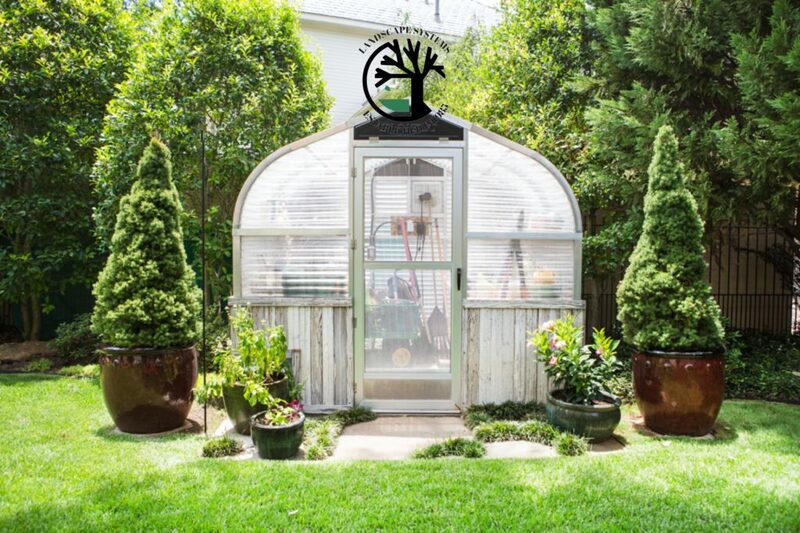 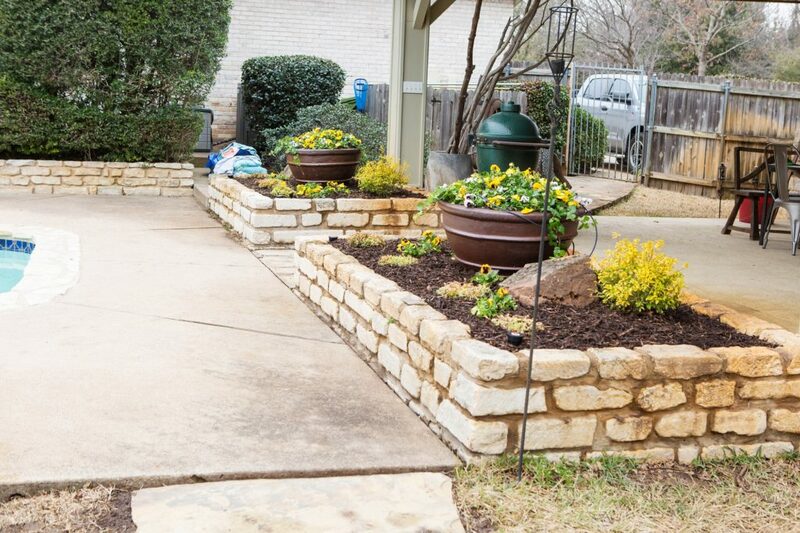 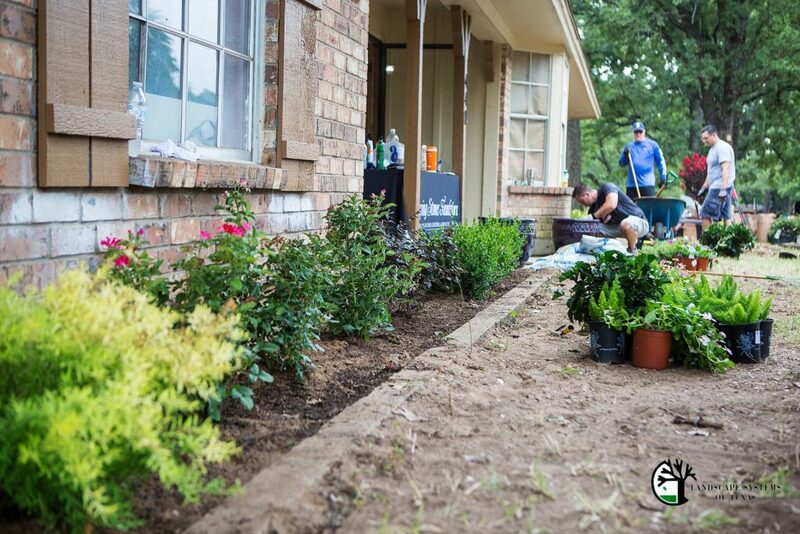 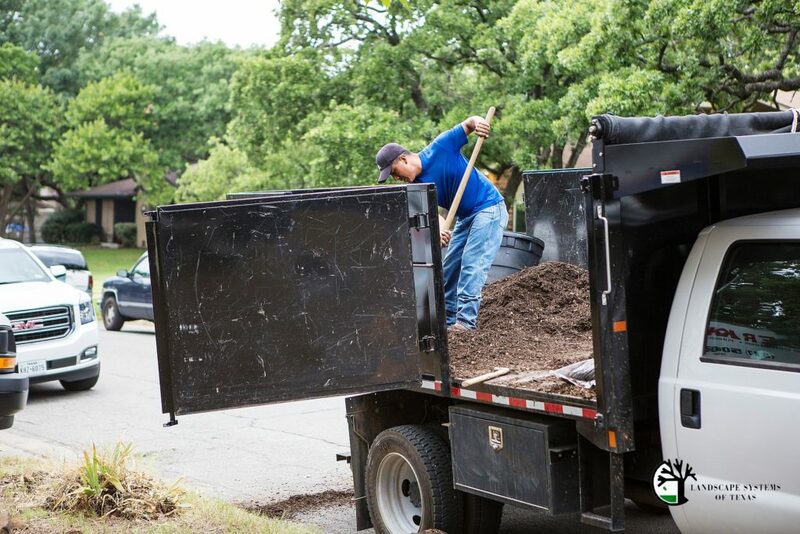 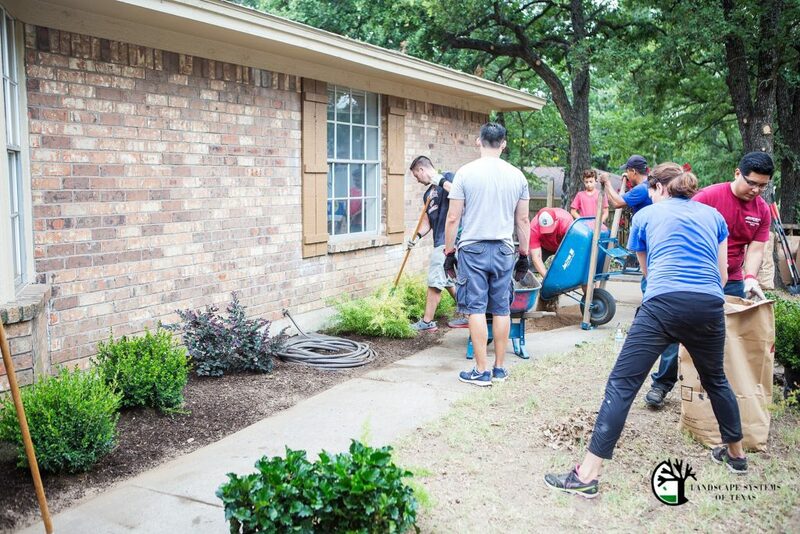 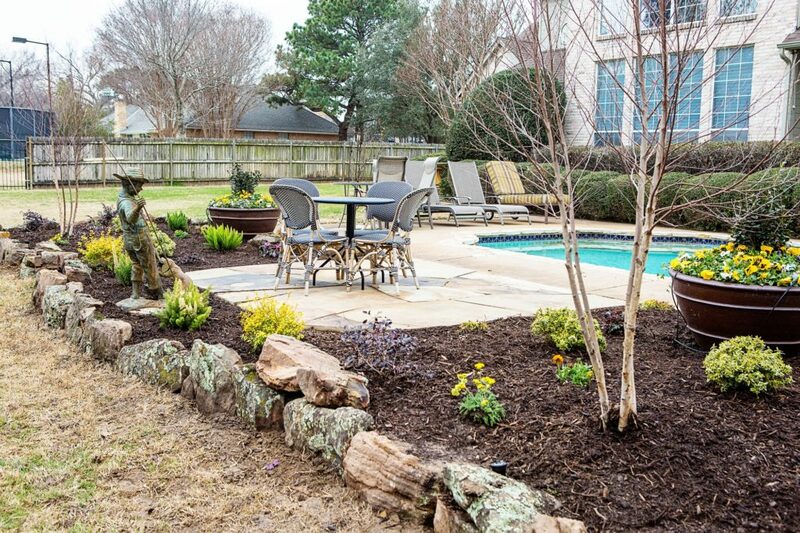 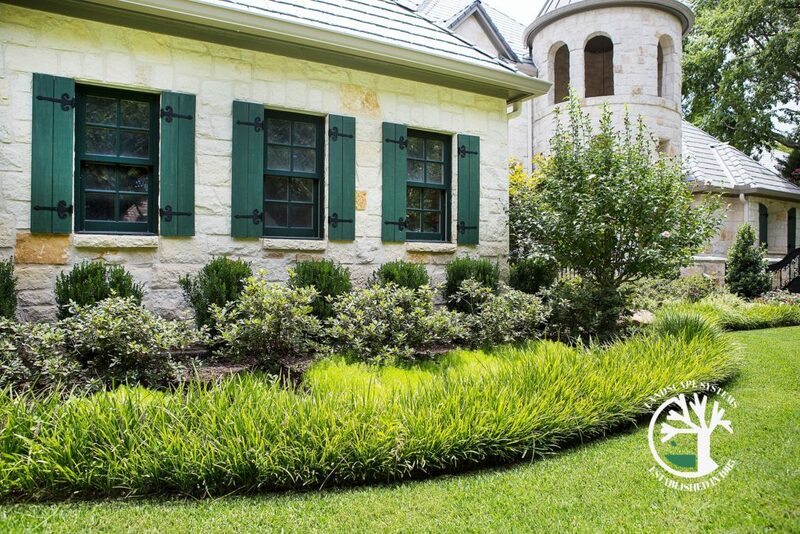 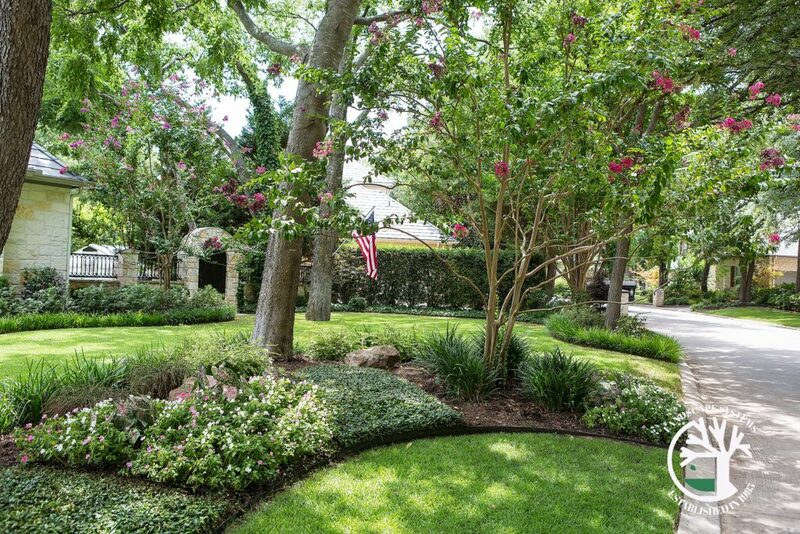 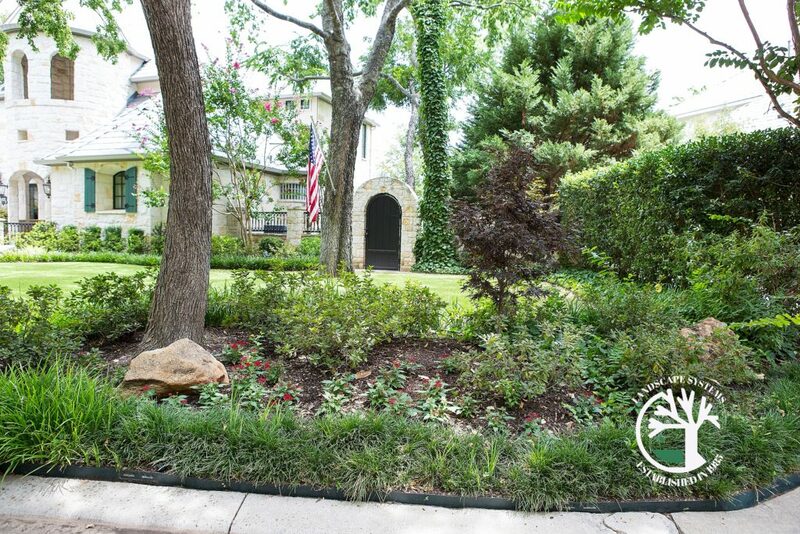 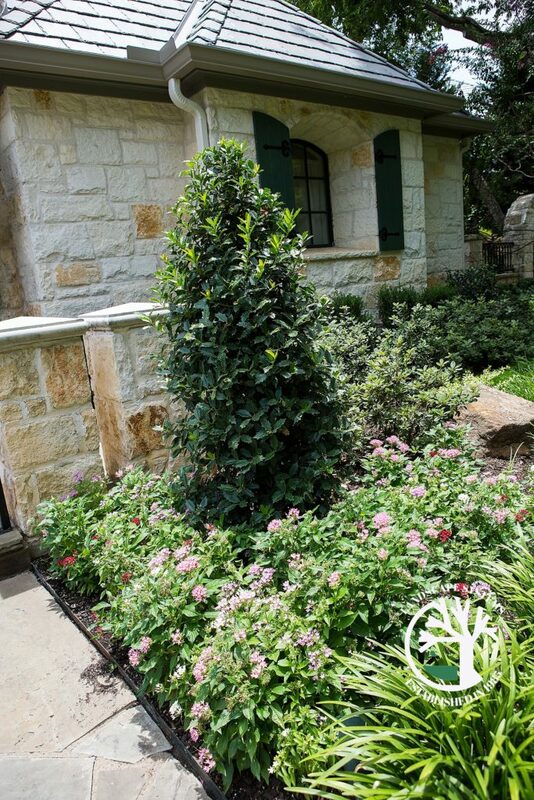 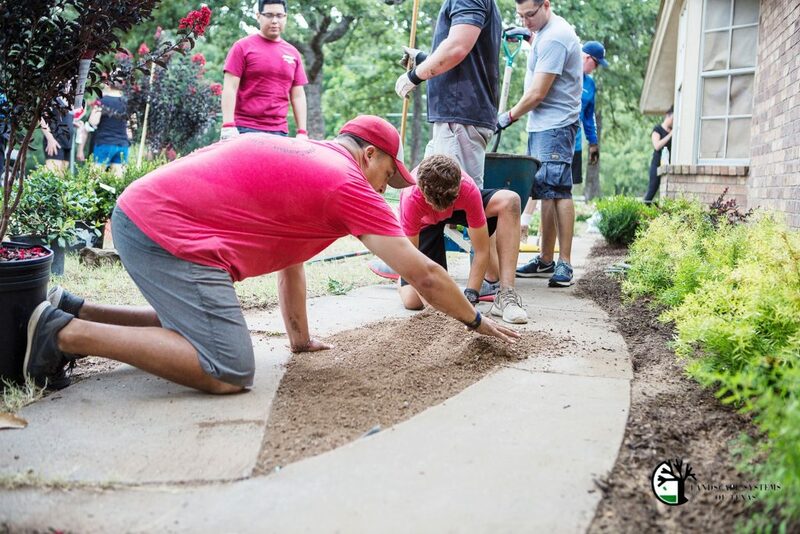 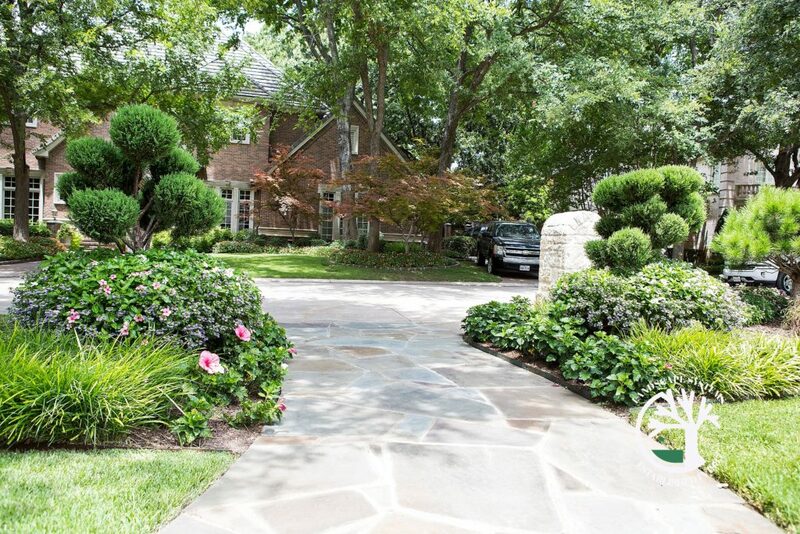 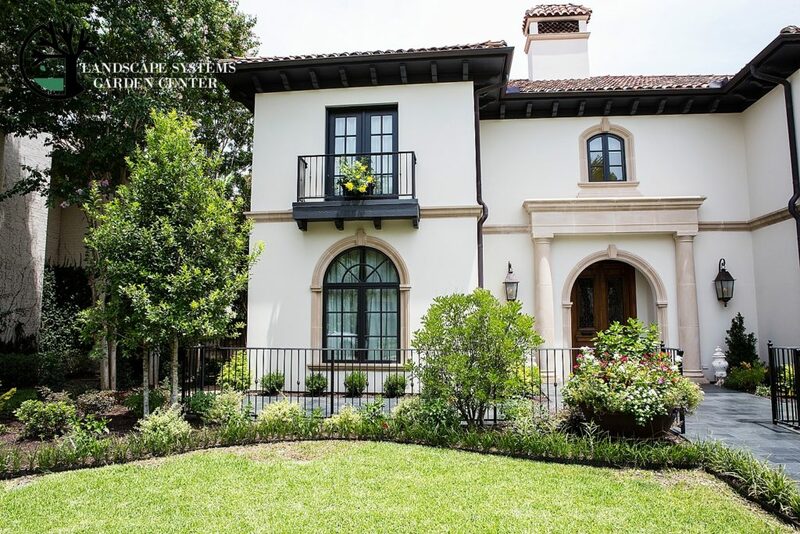 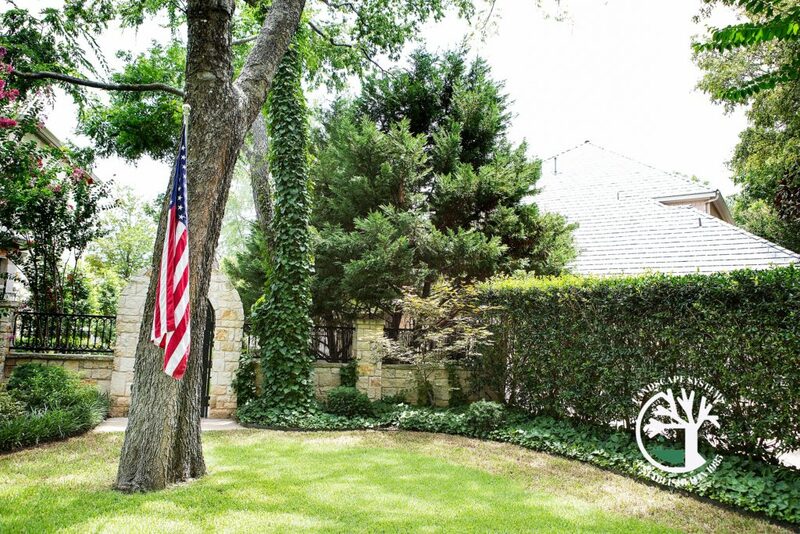 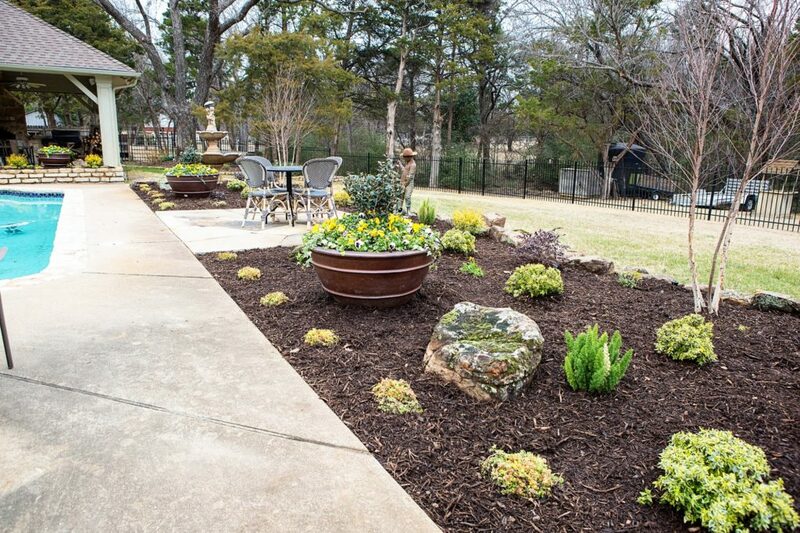 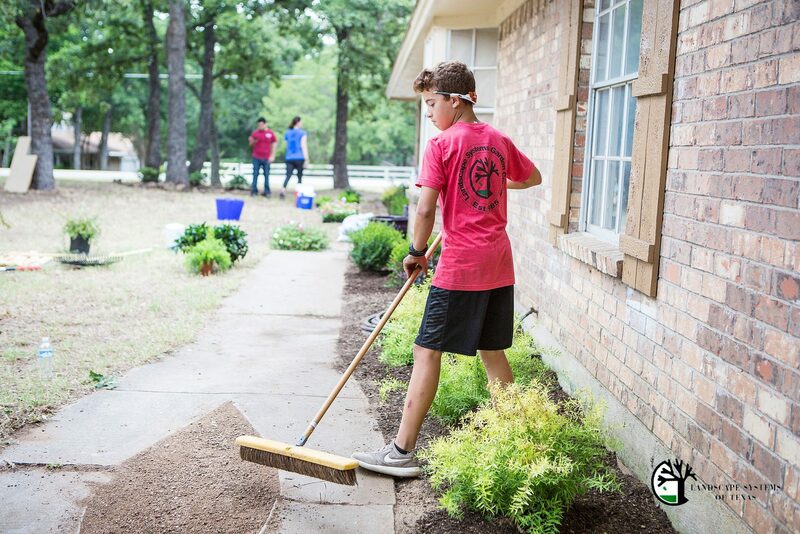 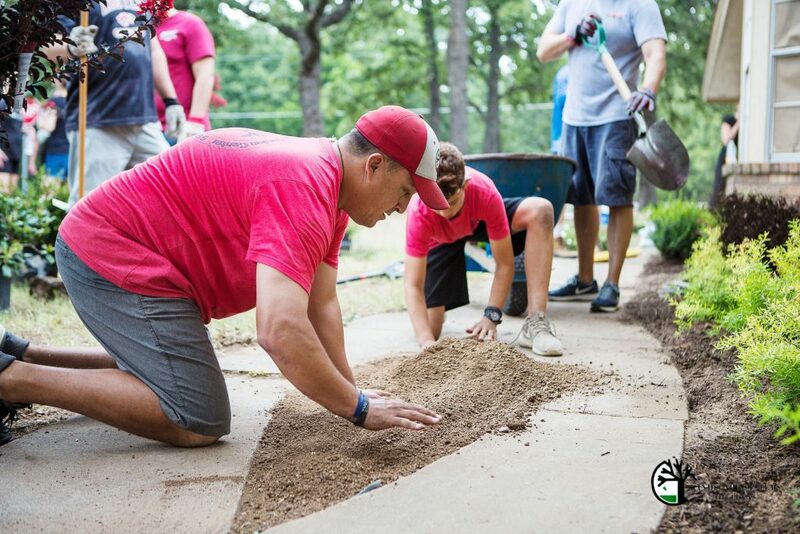 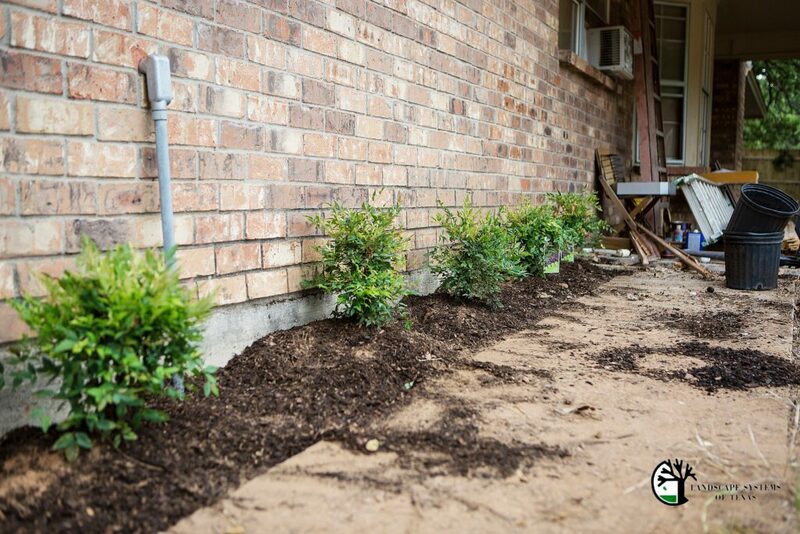 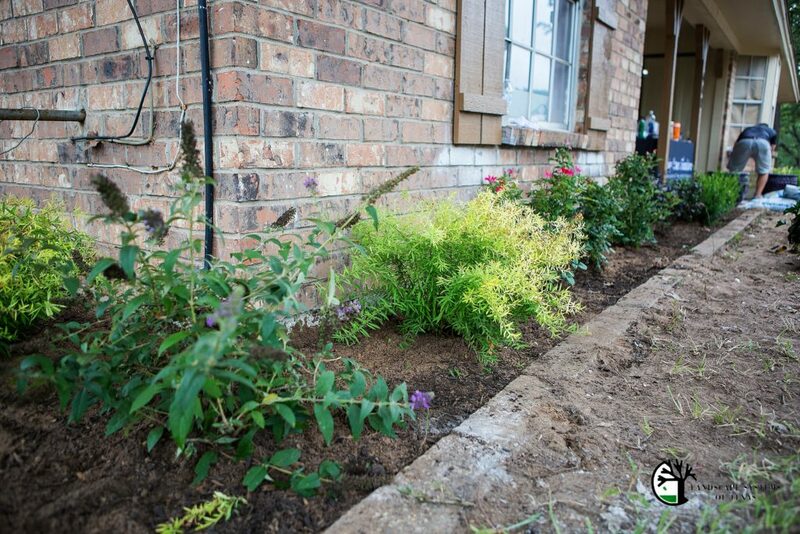 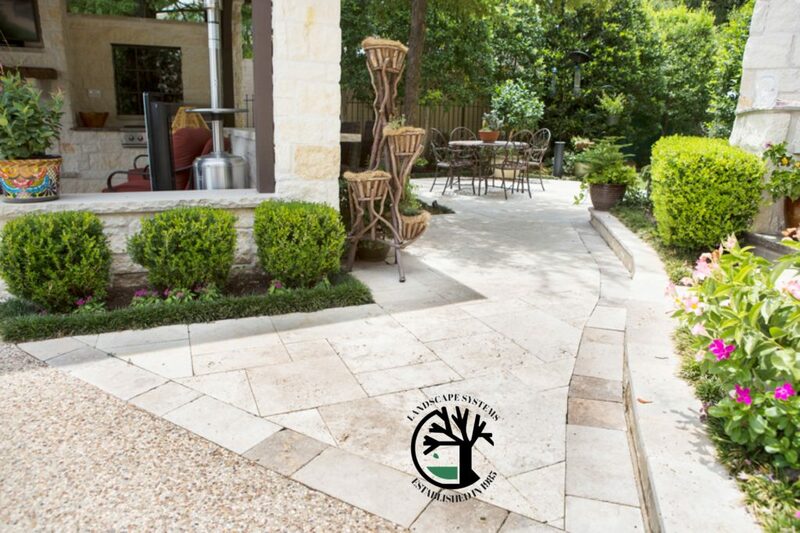 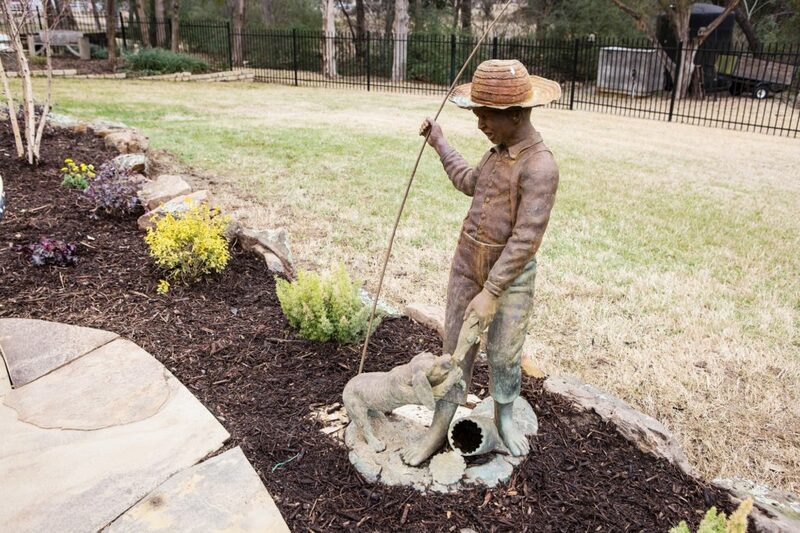 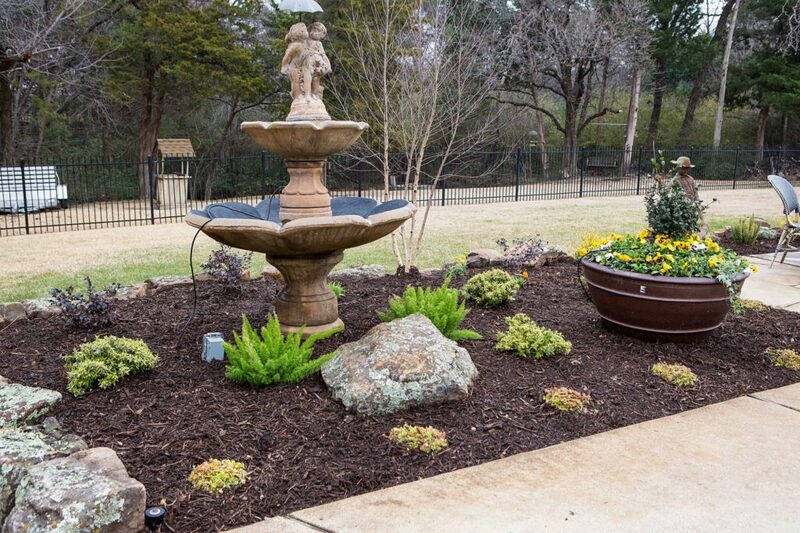 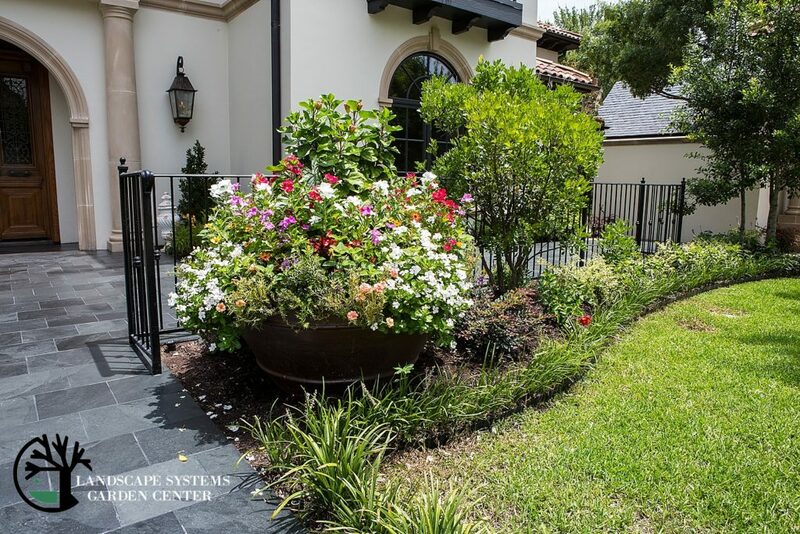 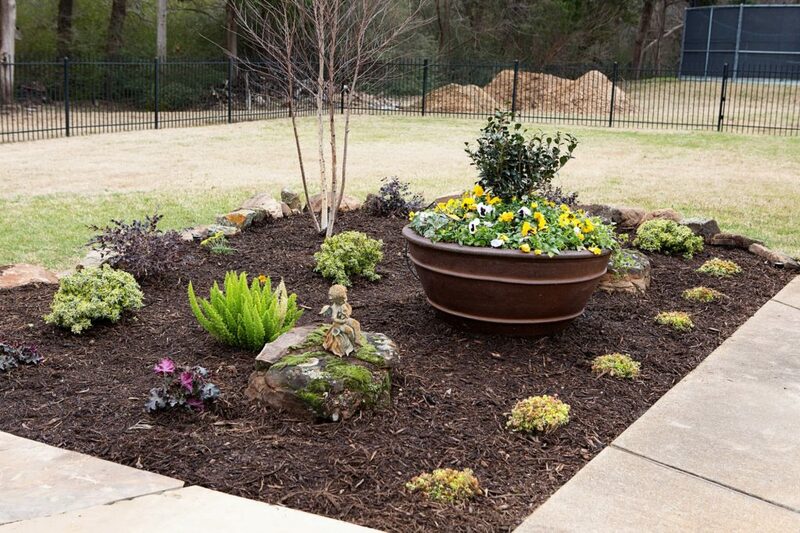 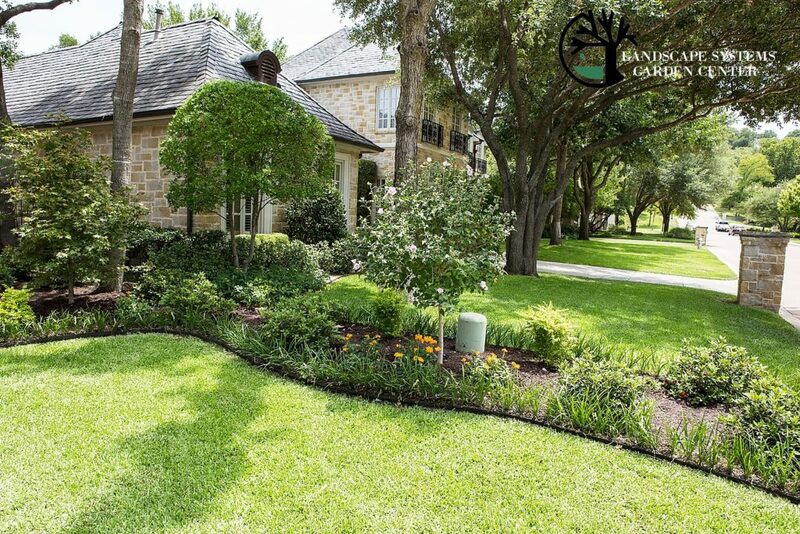 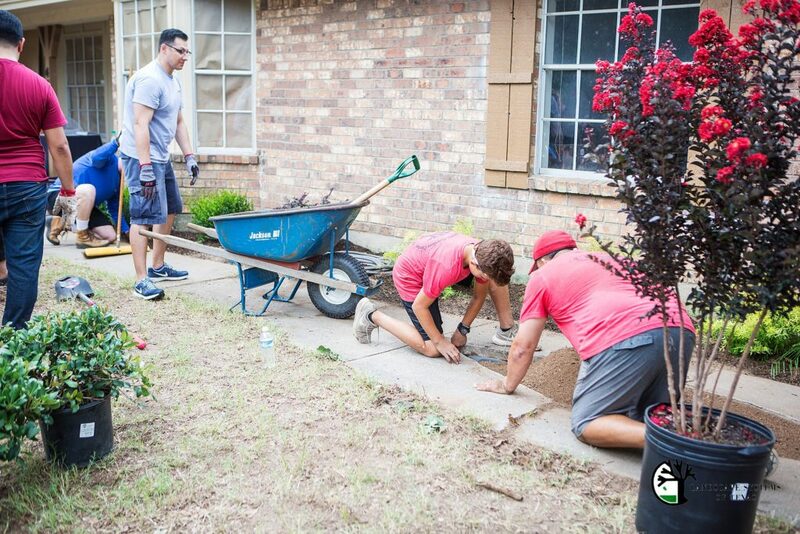 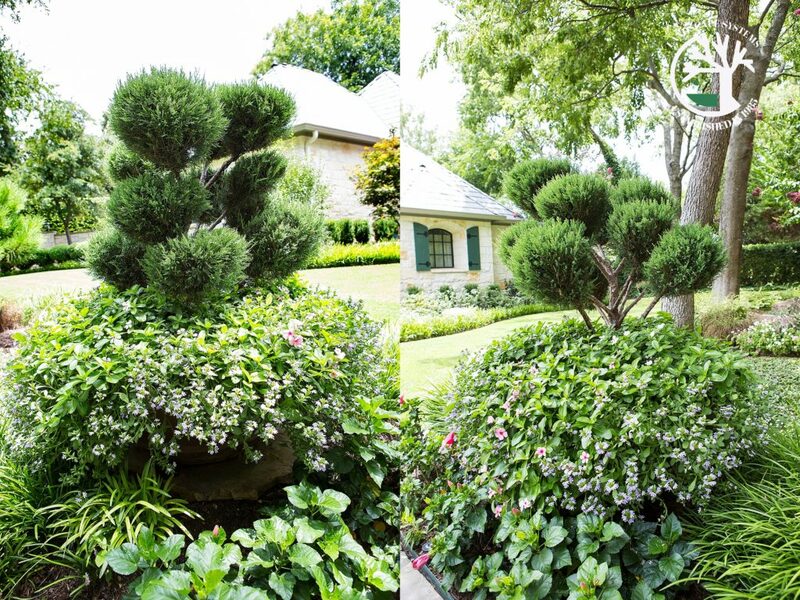 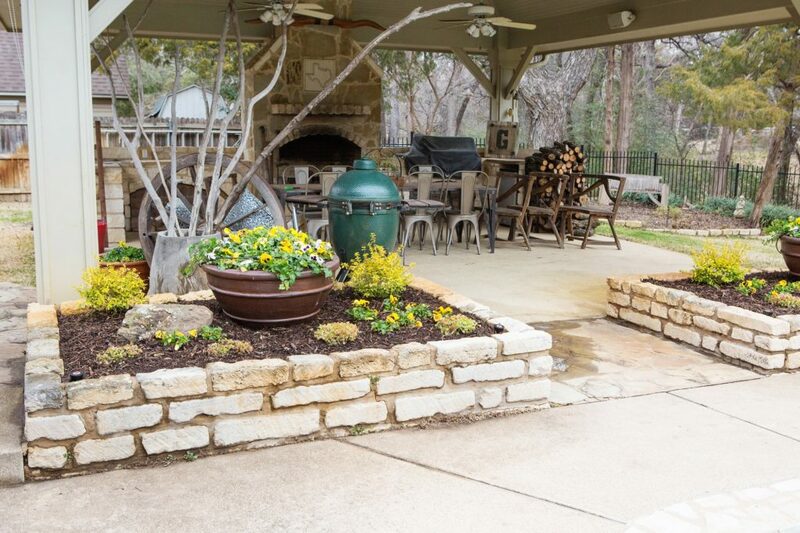 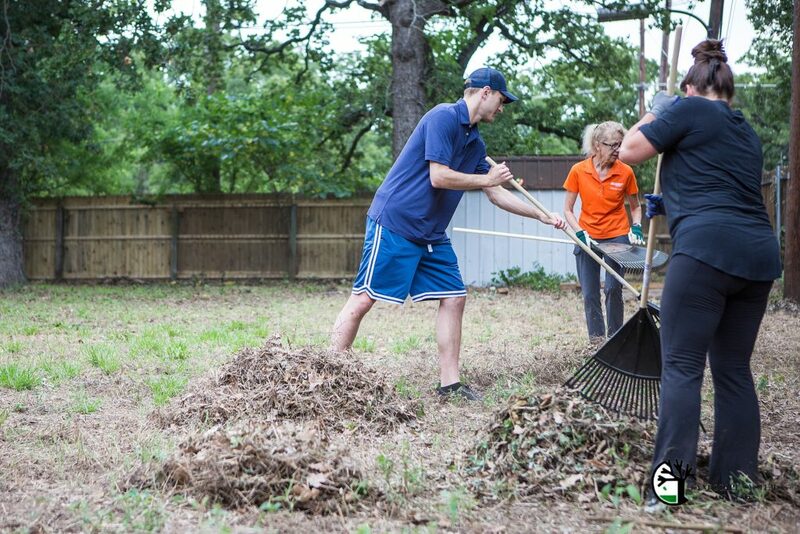 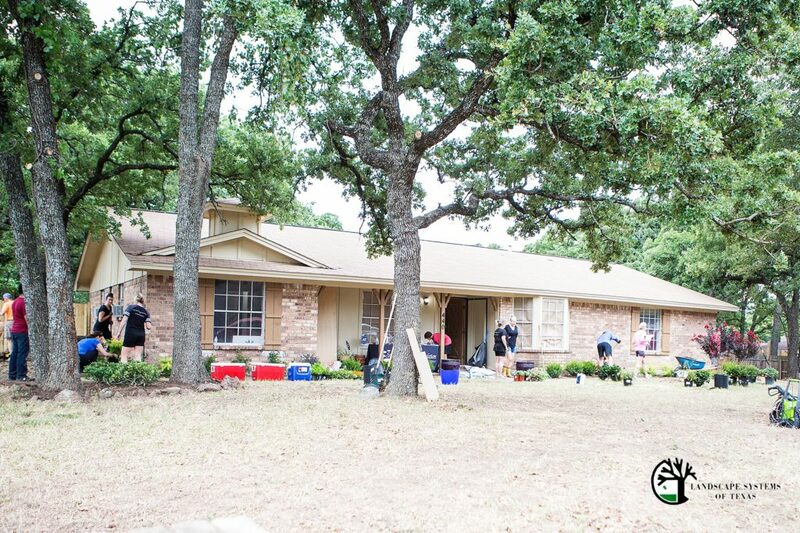 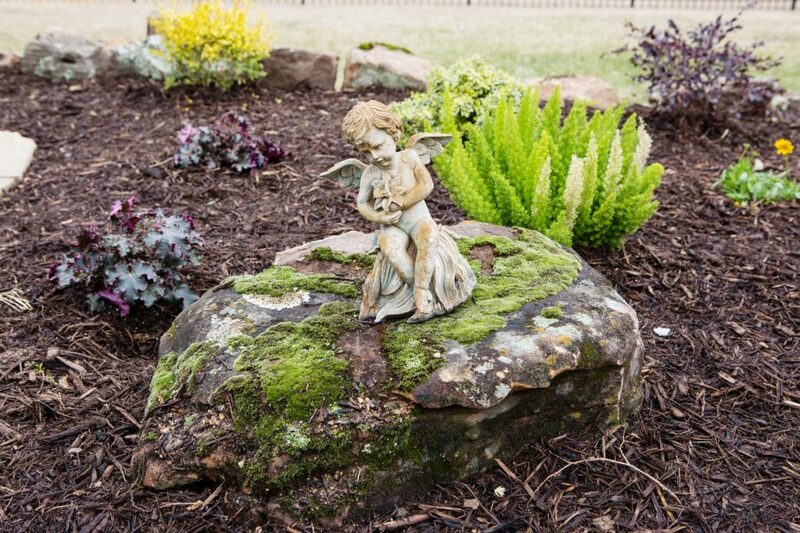 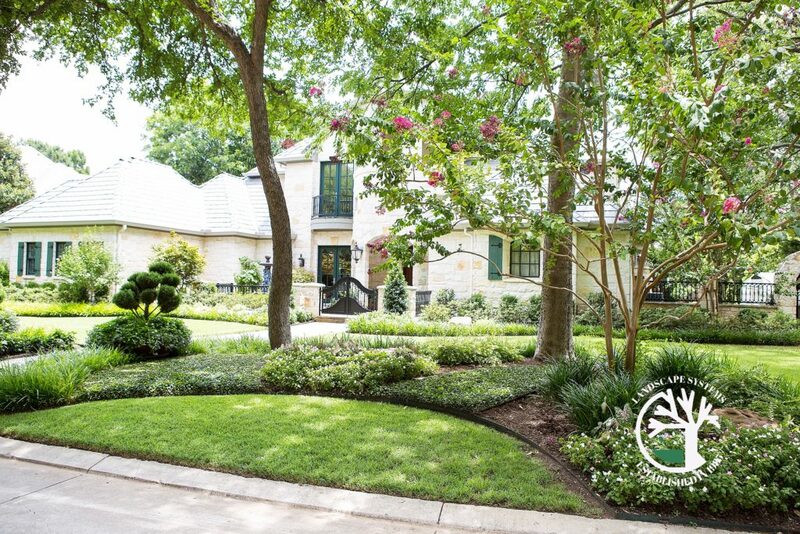 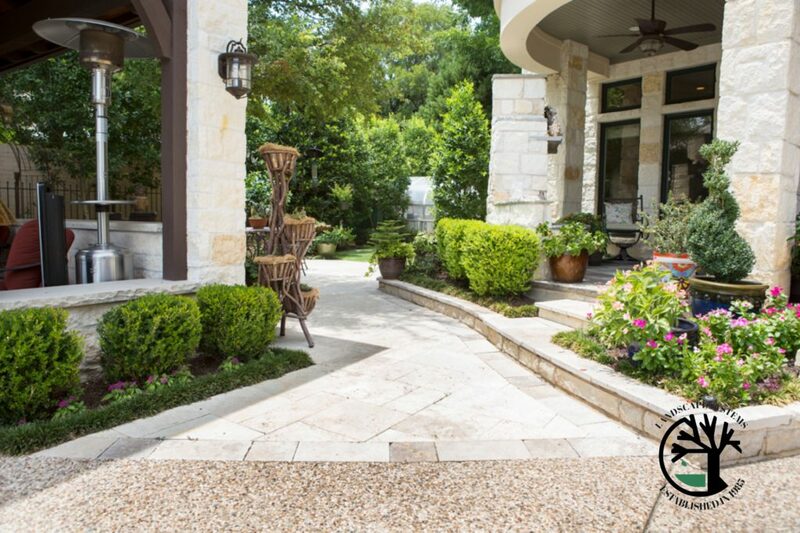 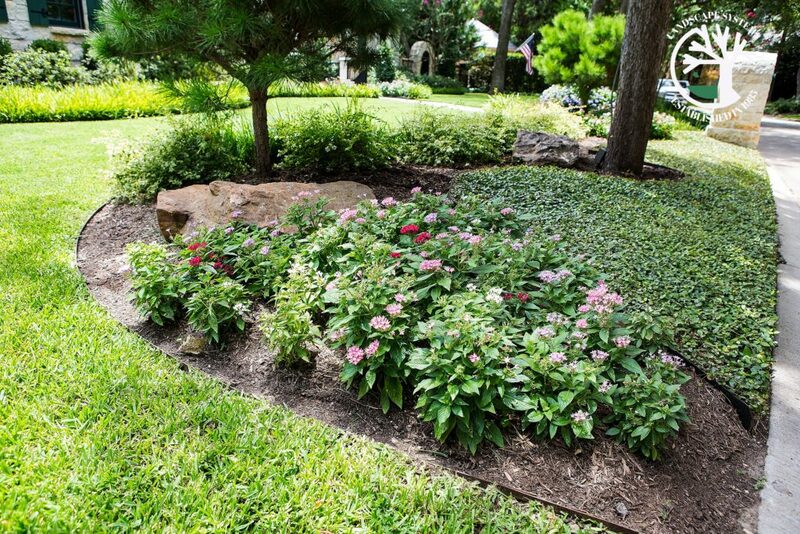 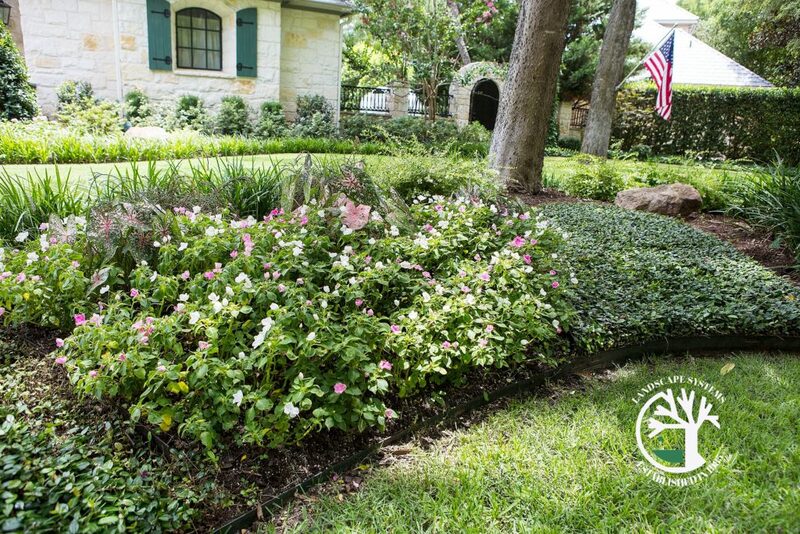 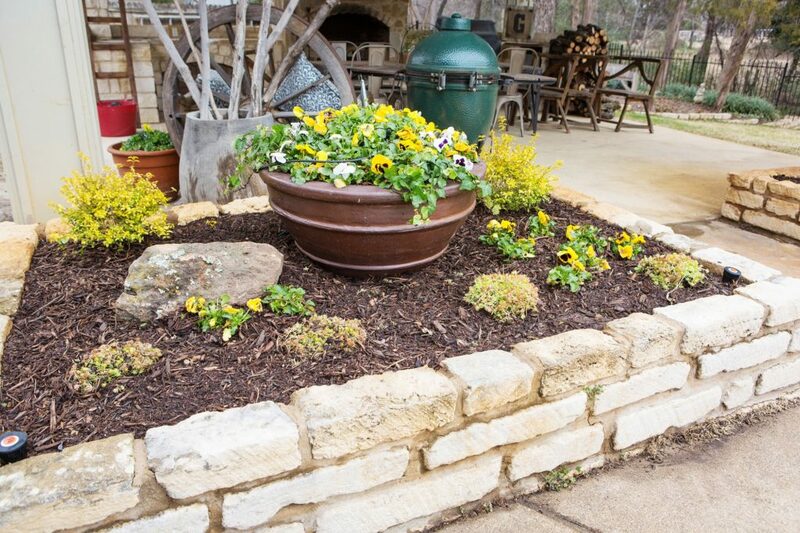 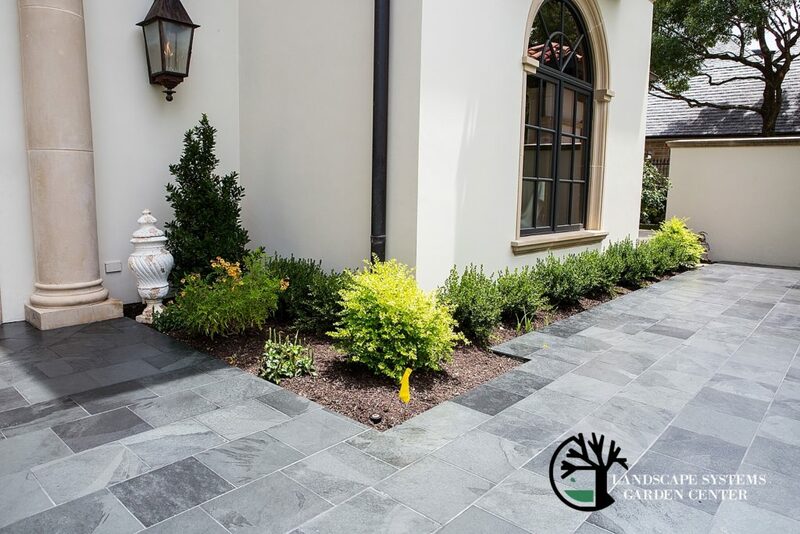 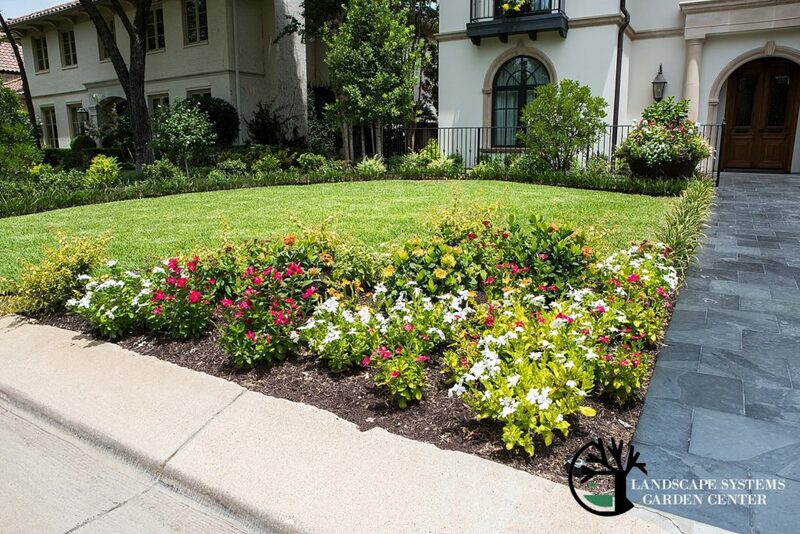 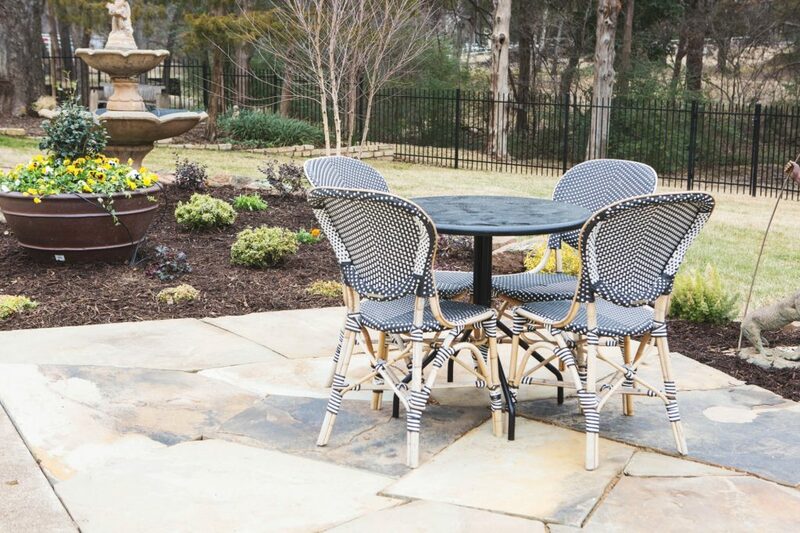 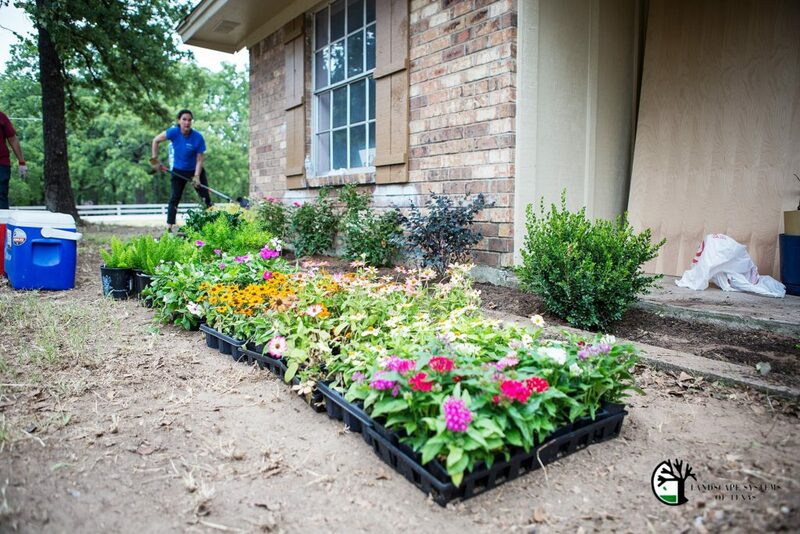 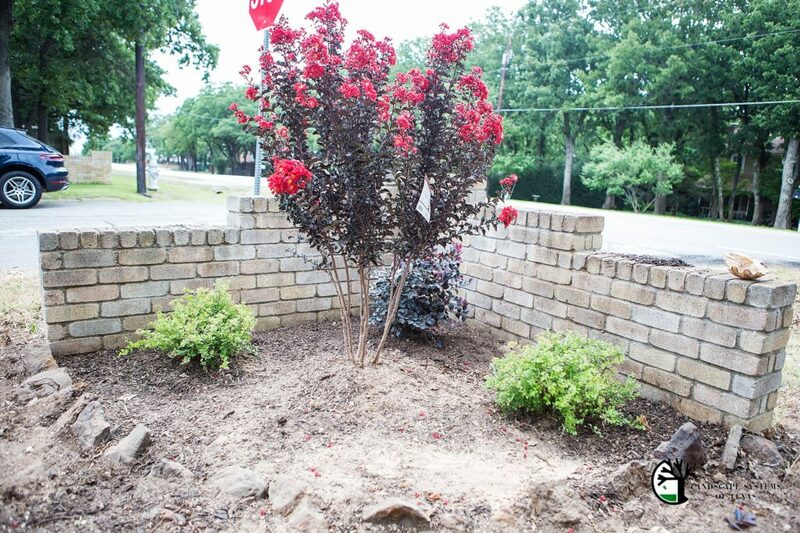 If you loved last week’s blog post about this home’s front yard landscaping remodel, then you’ll love the continuation with images from their back yard as well. 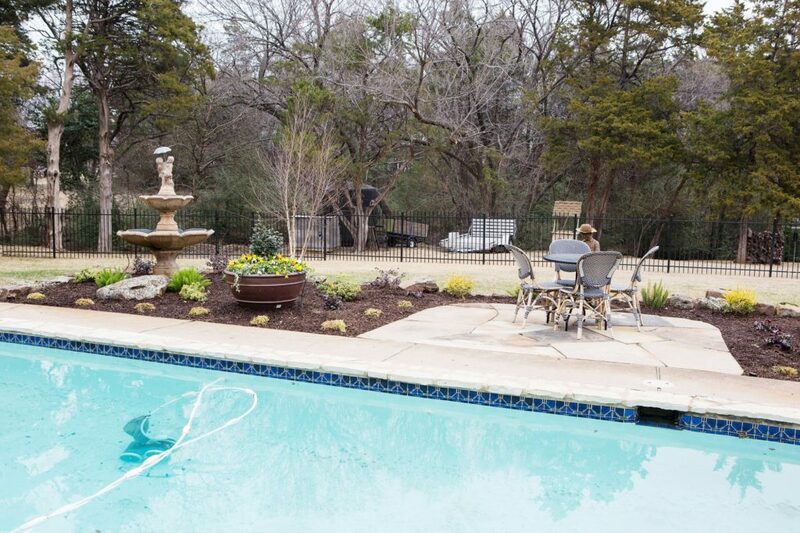 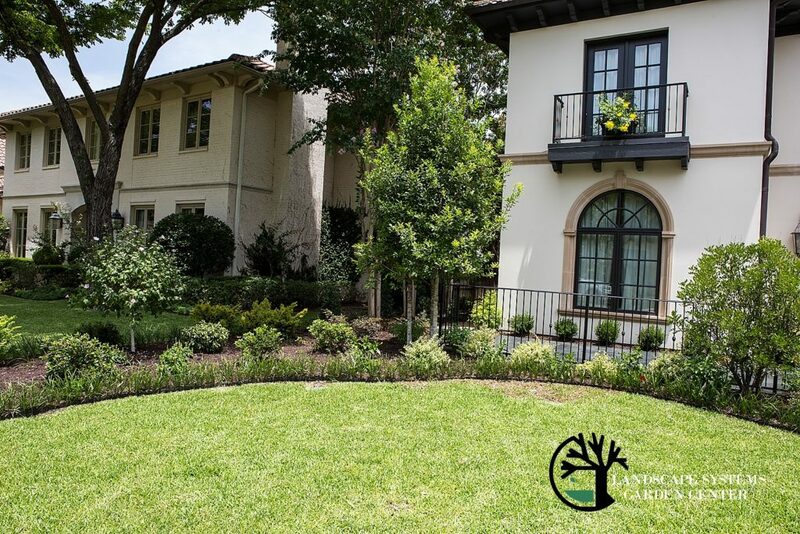 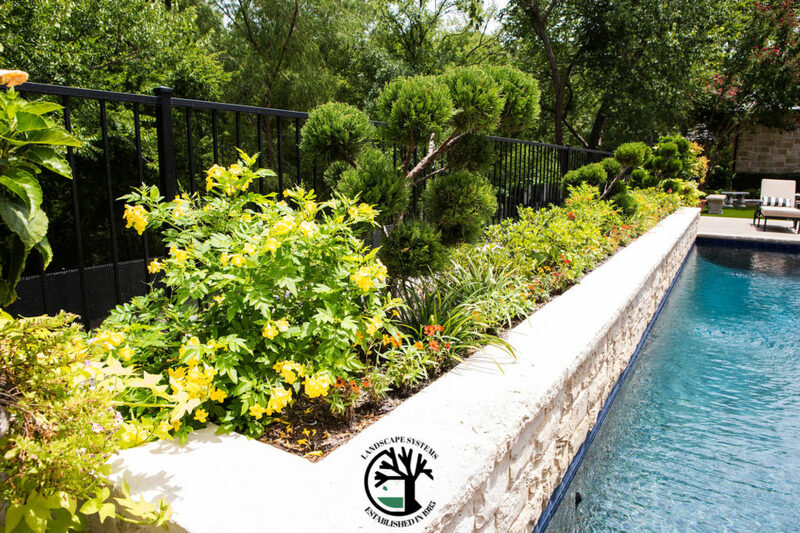 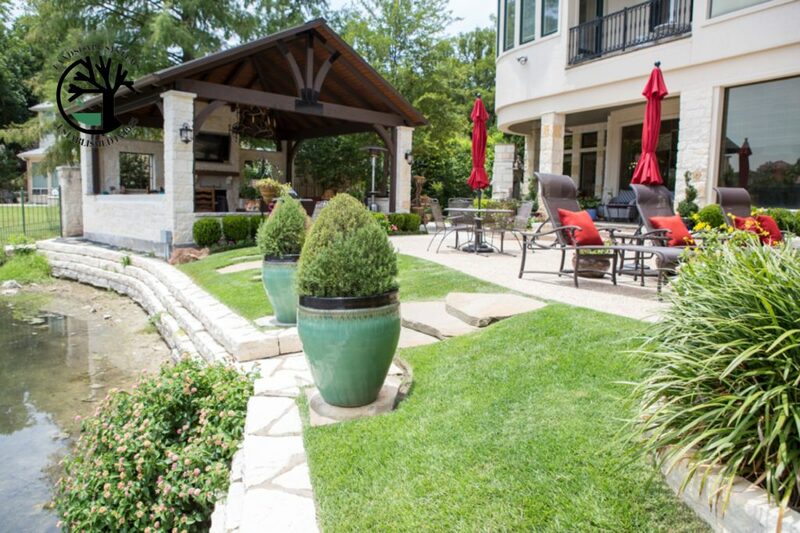 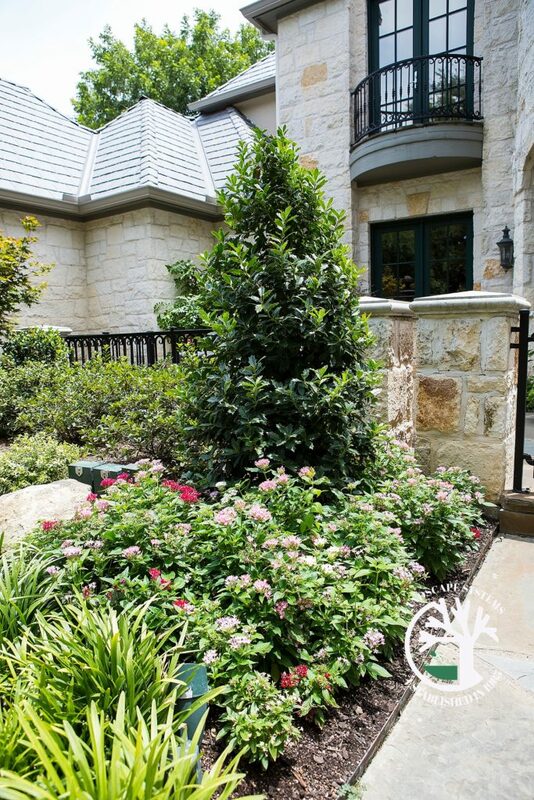 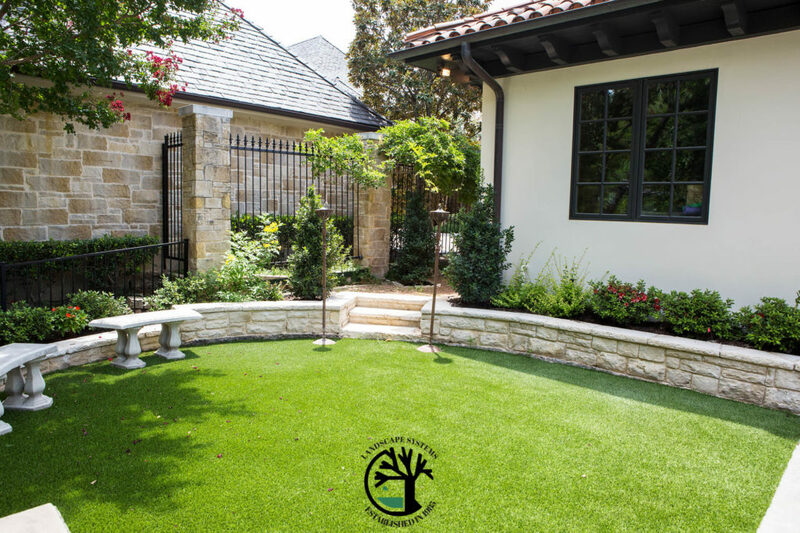 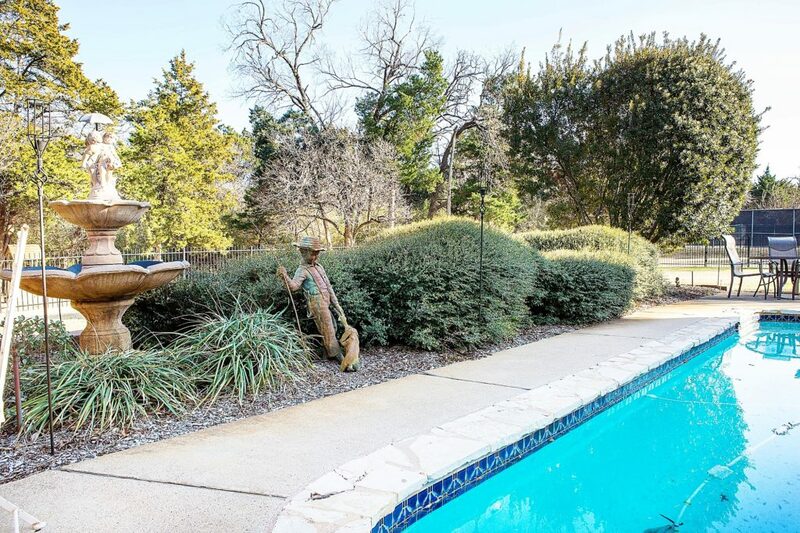 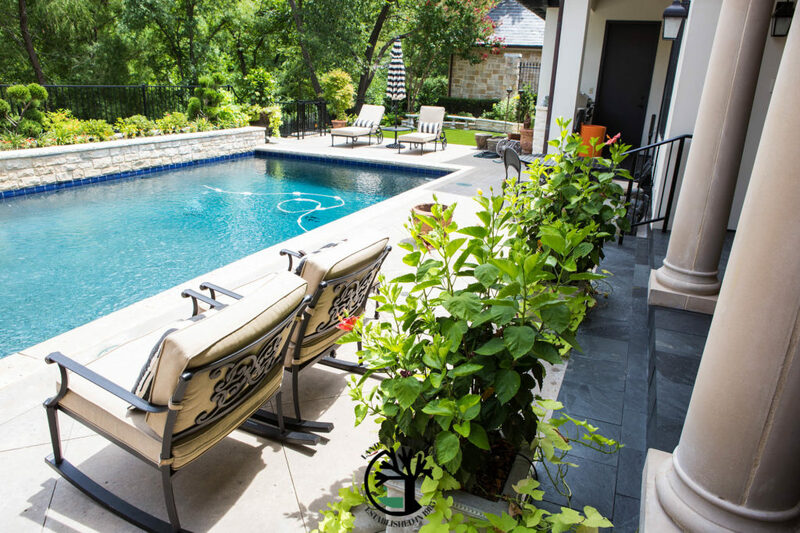 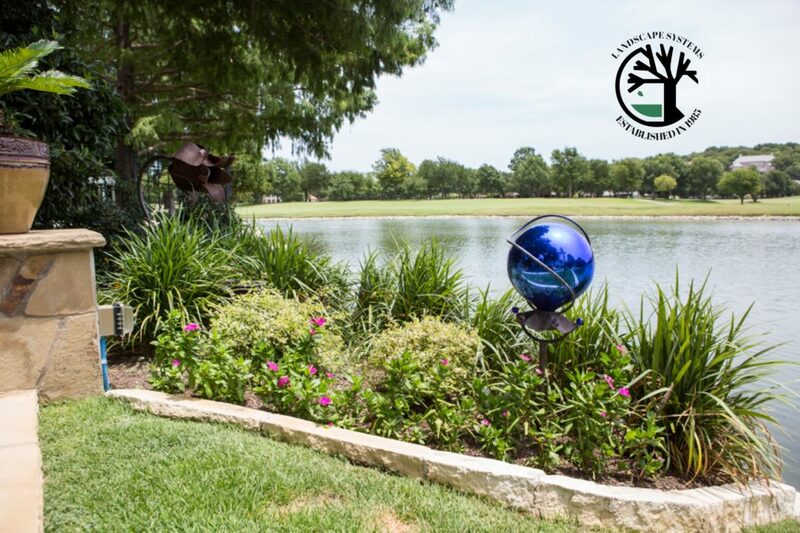 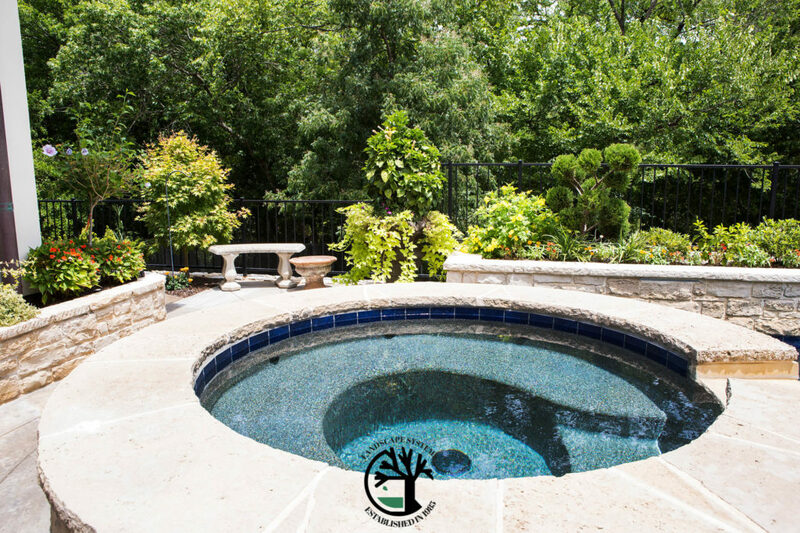 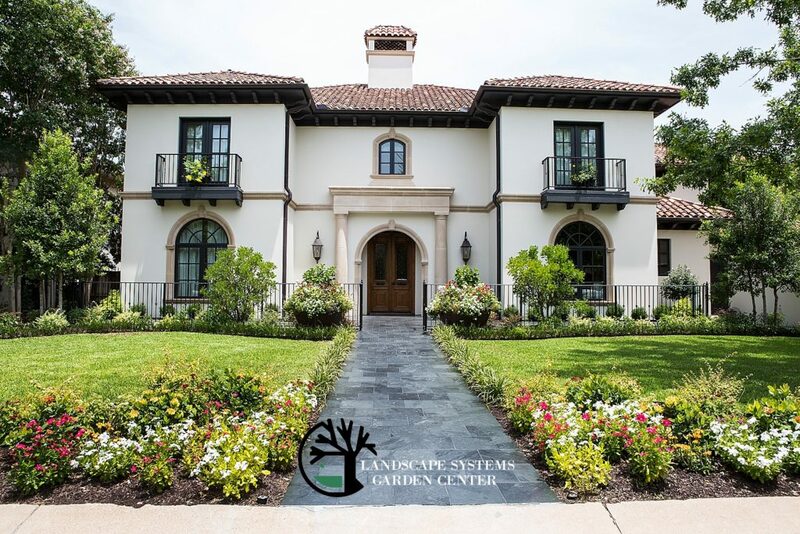 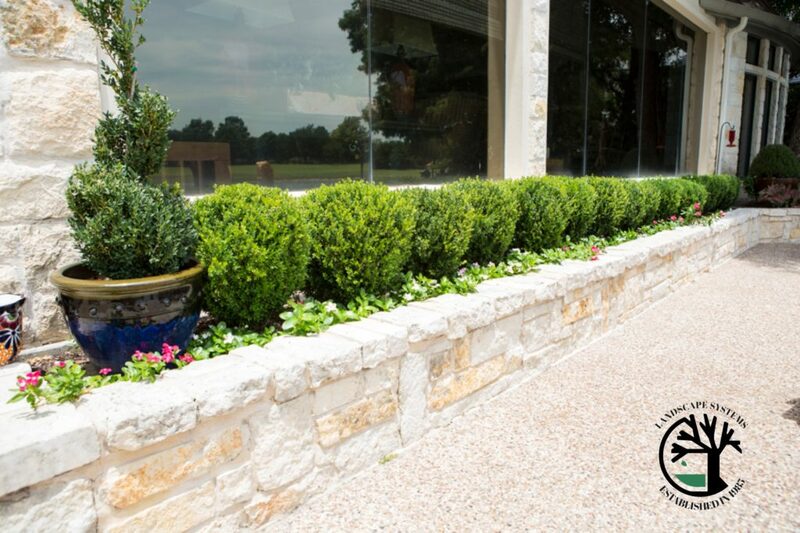 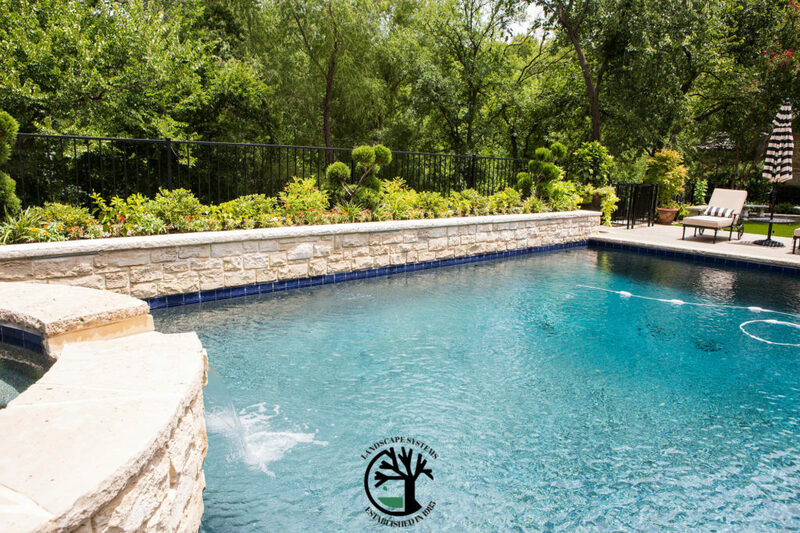 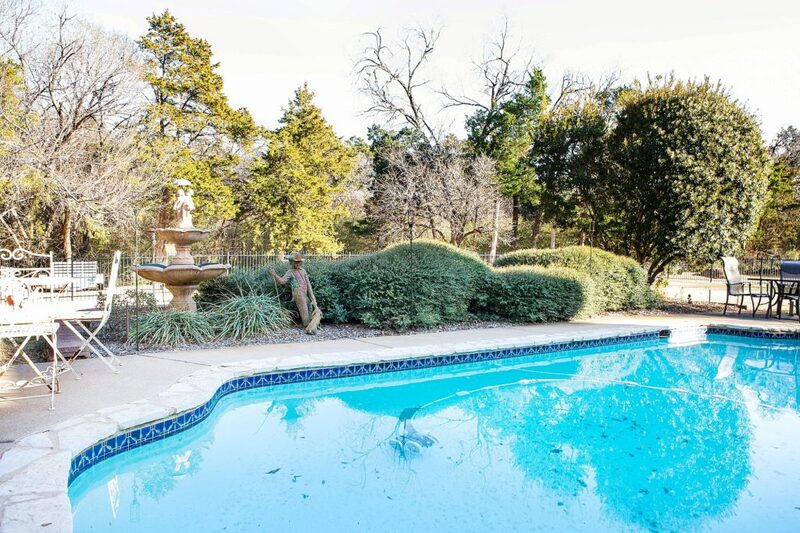 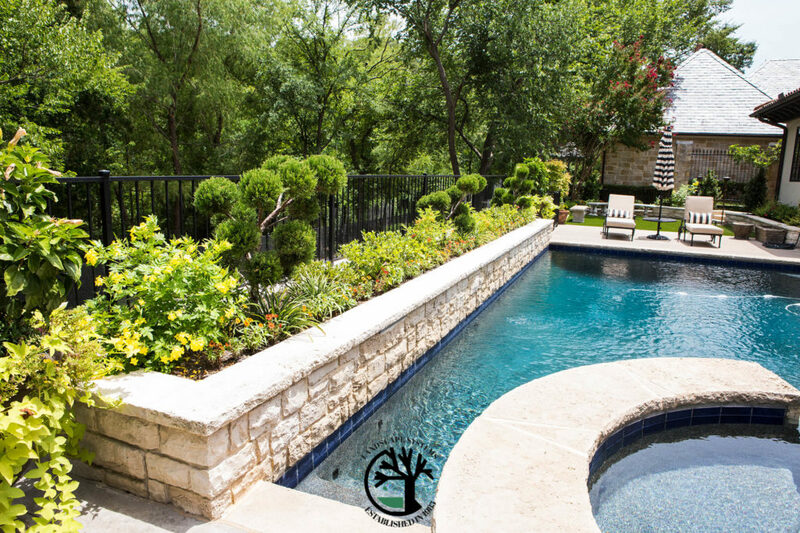 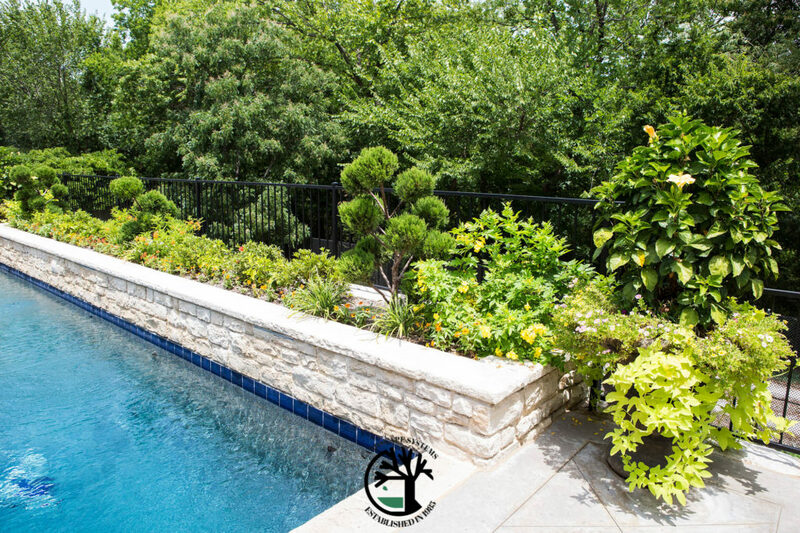 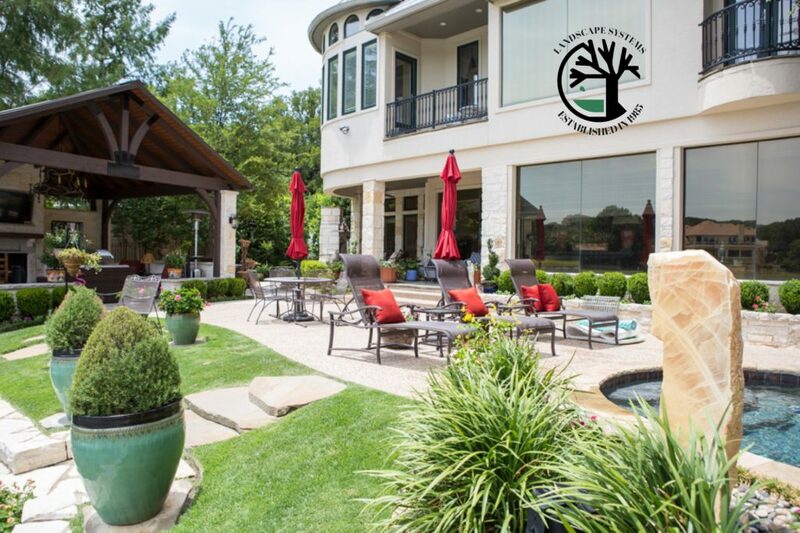 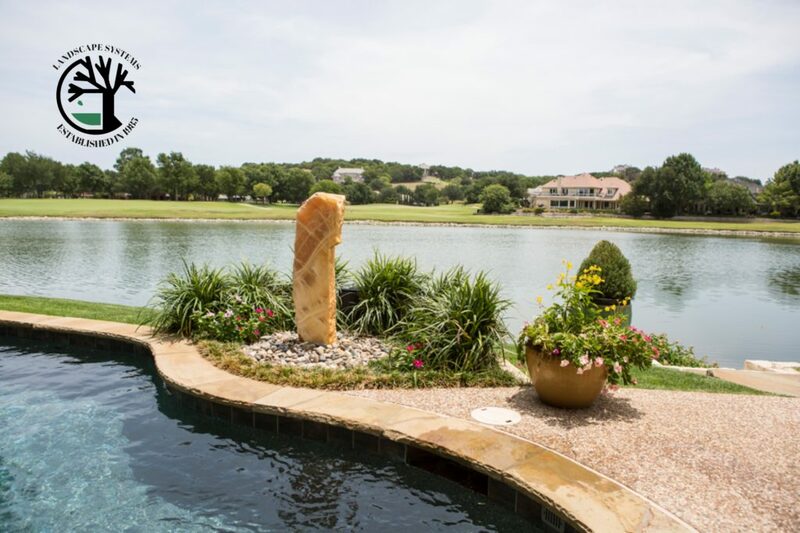 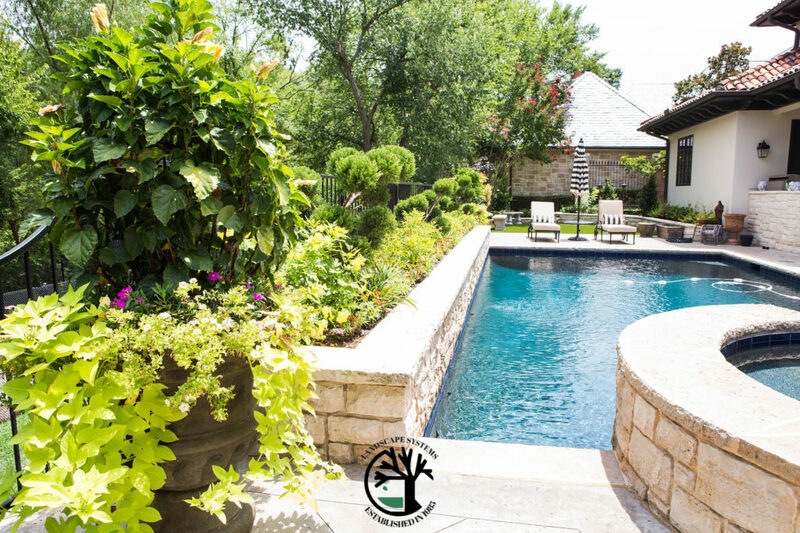 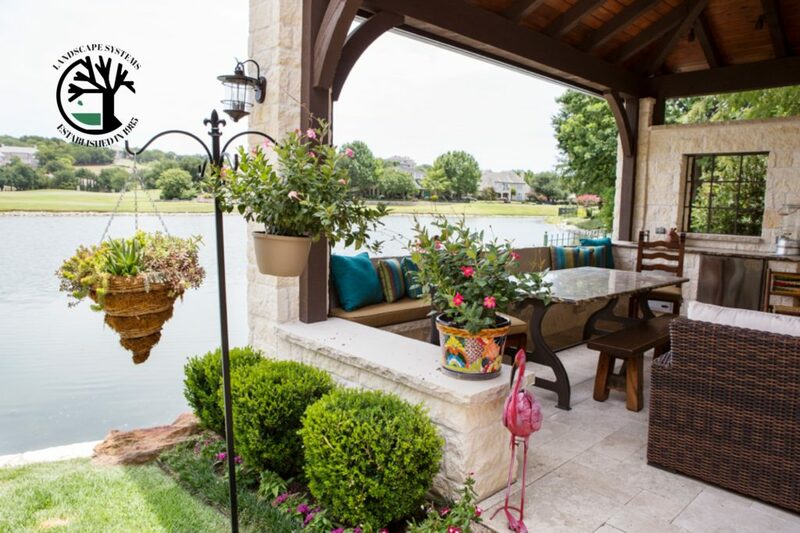 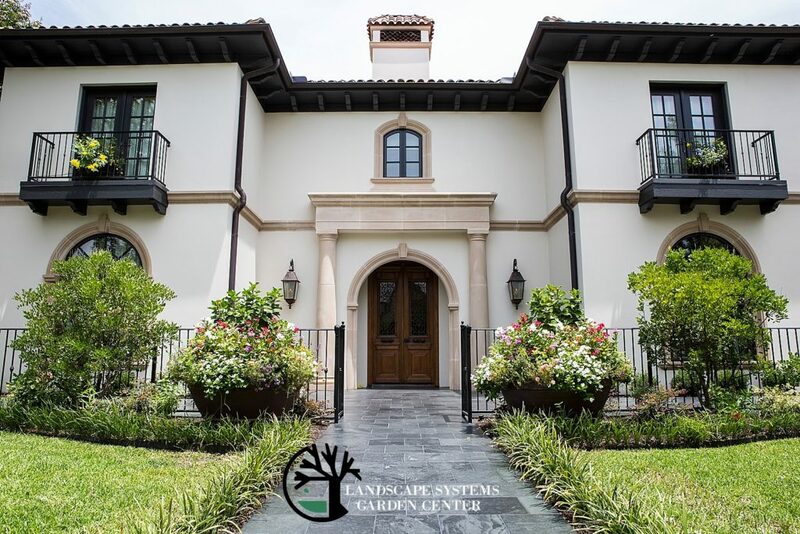 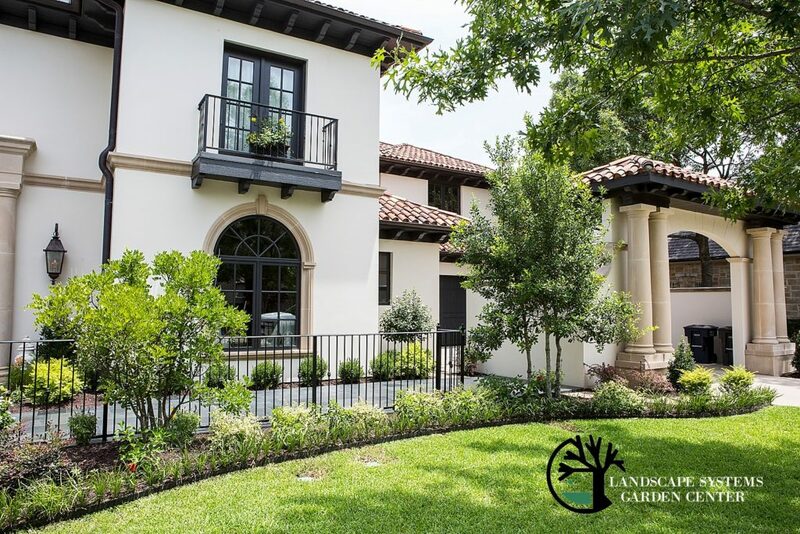 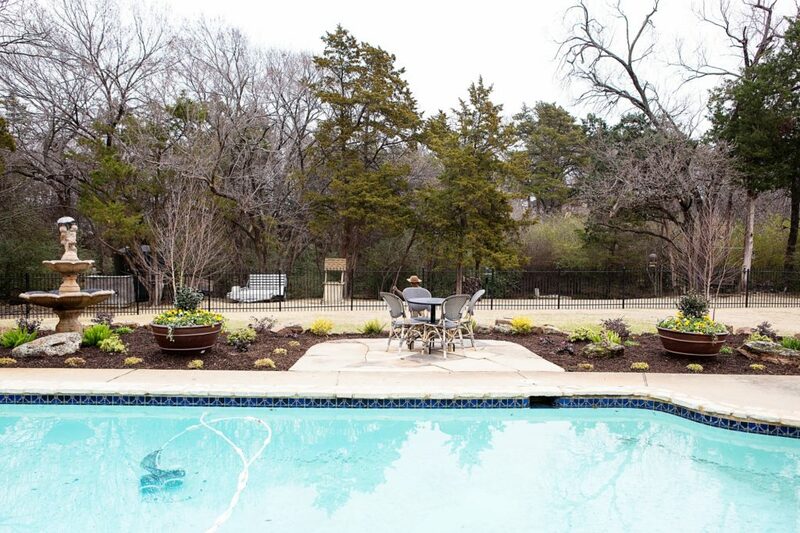 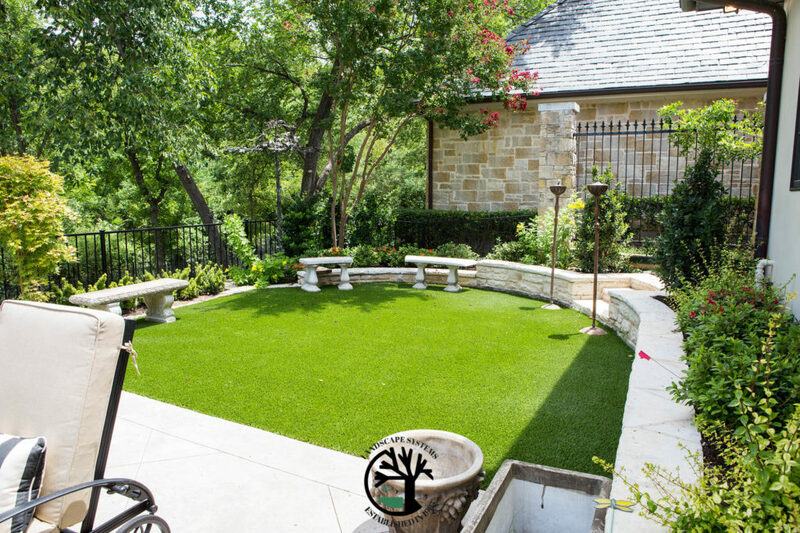 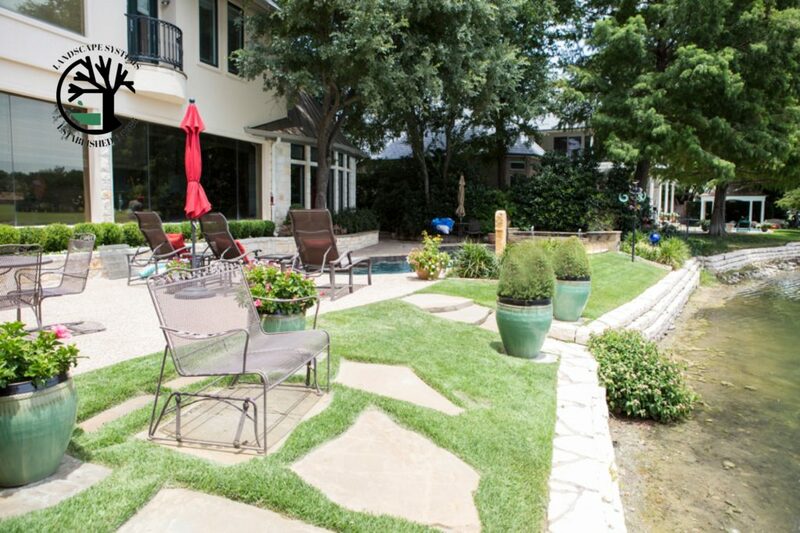 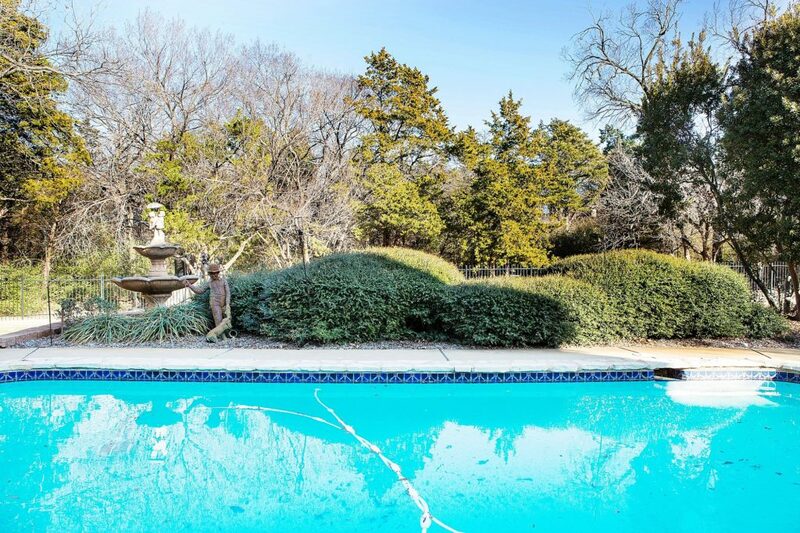 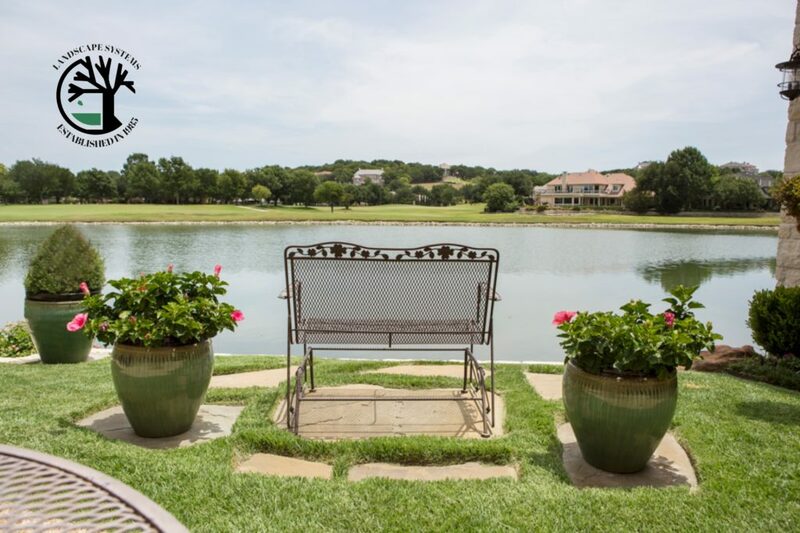 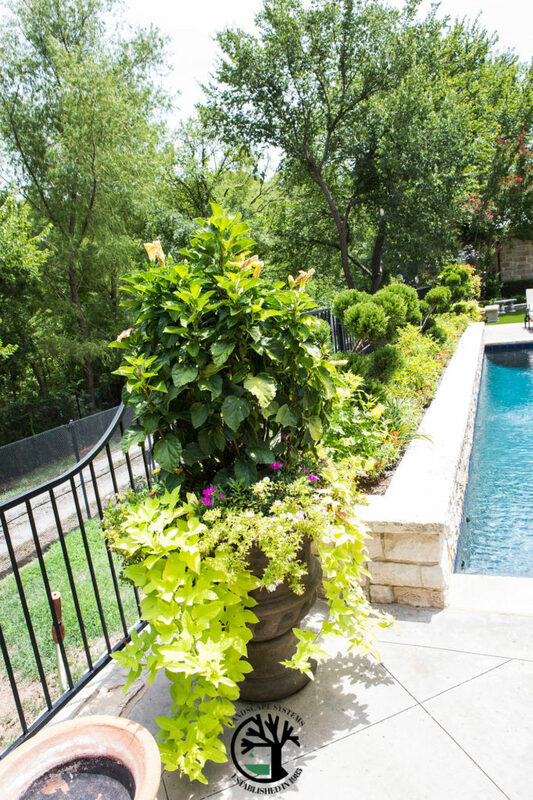 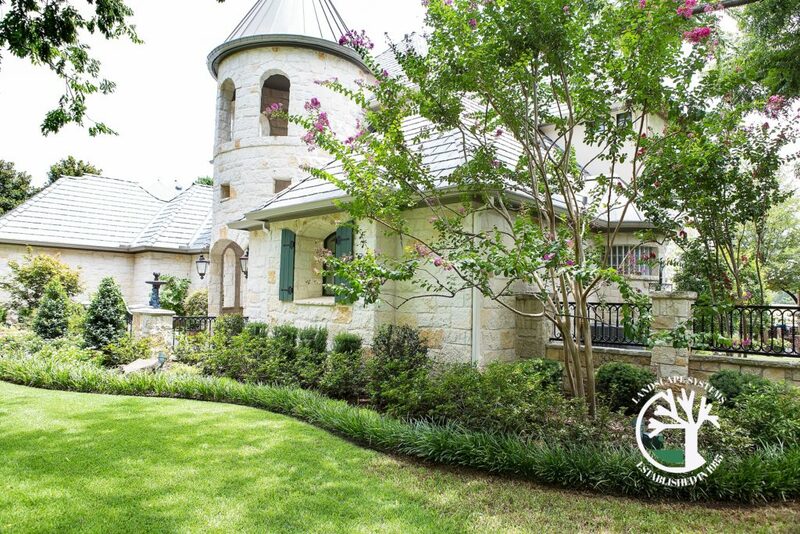 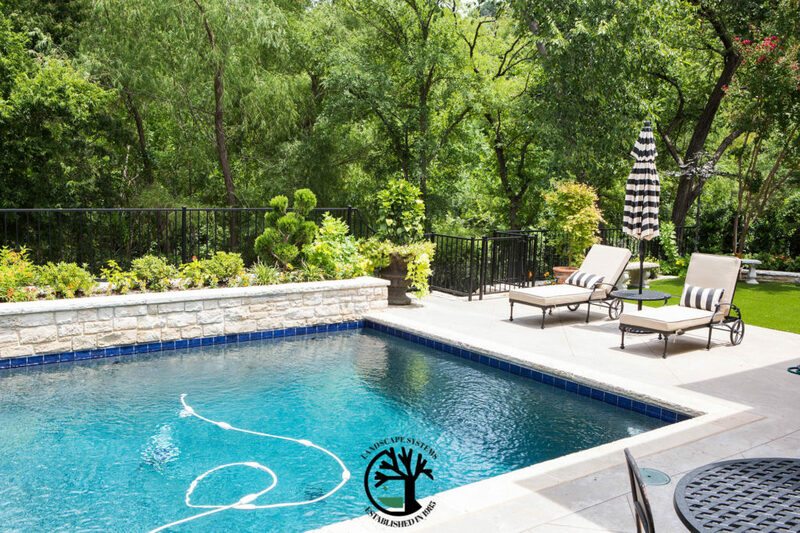 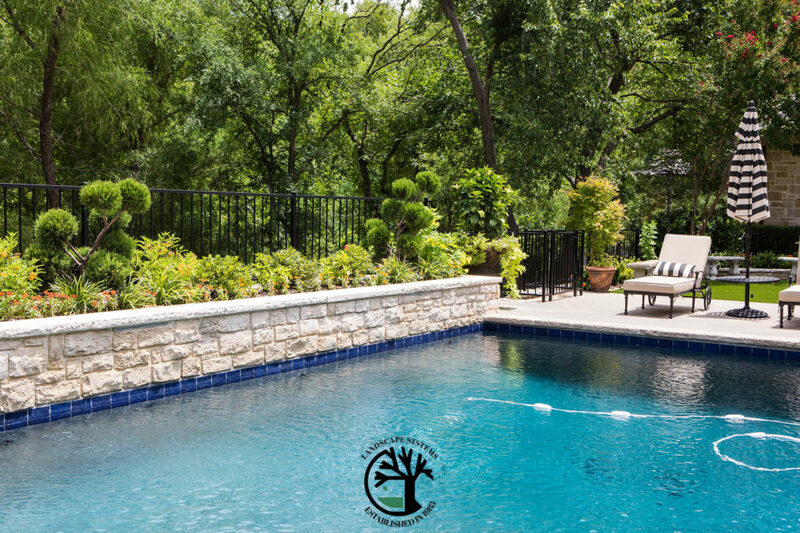 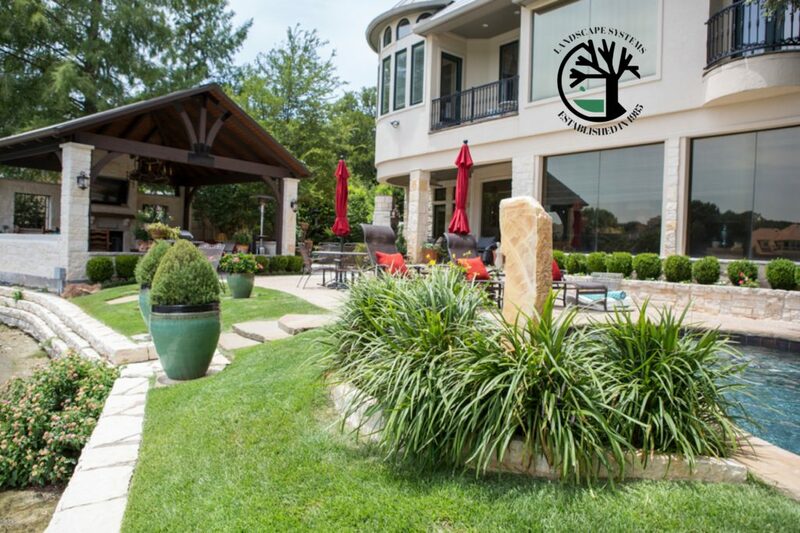 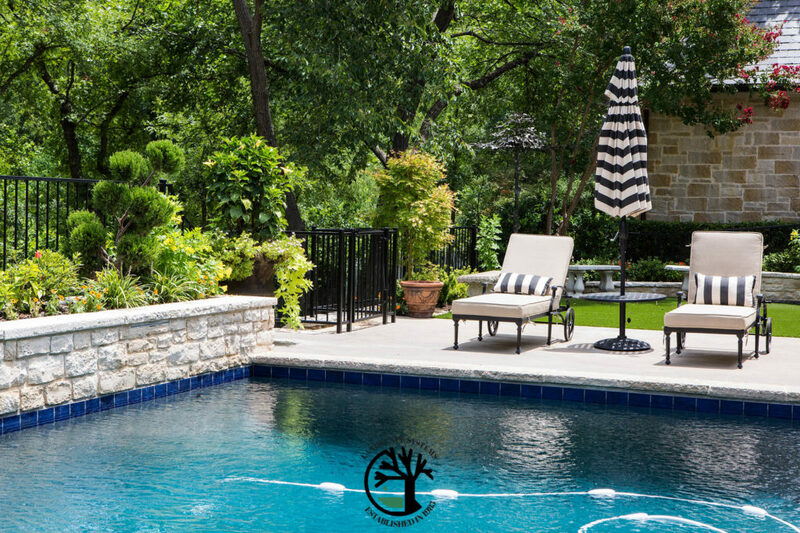 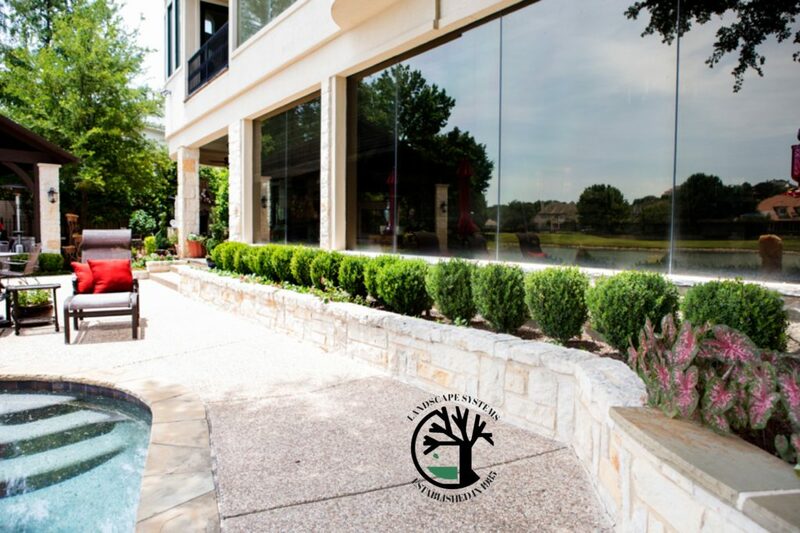 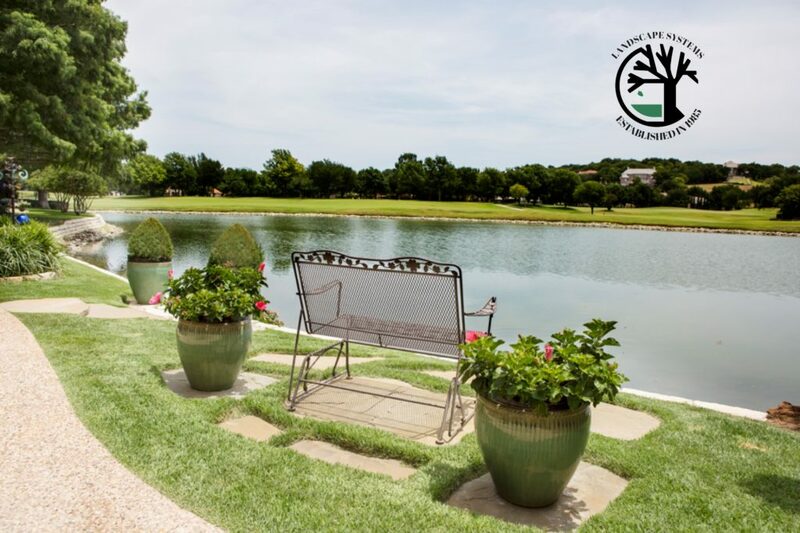 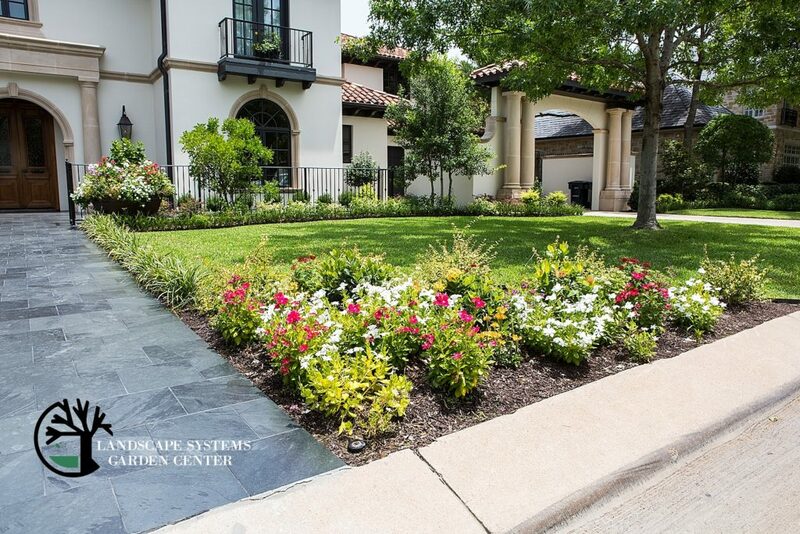 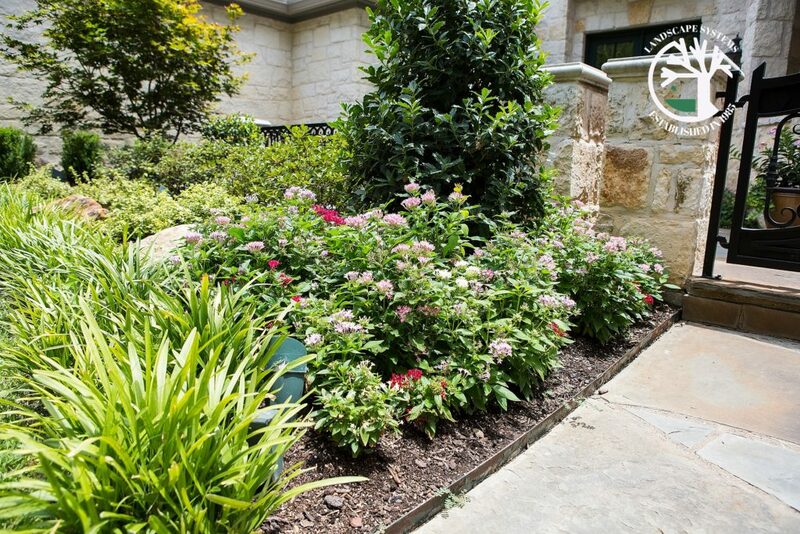 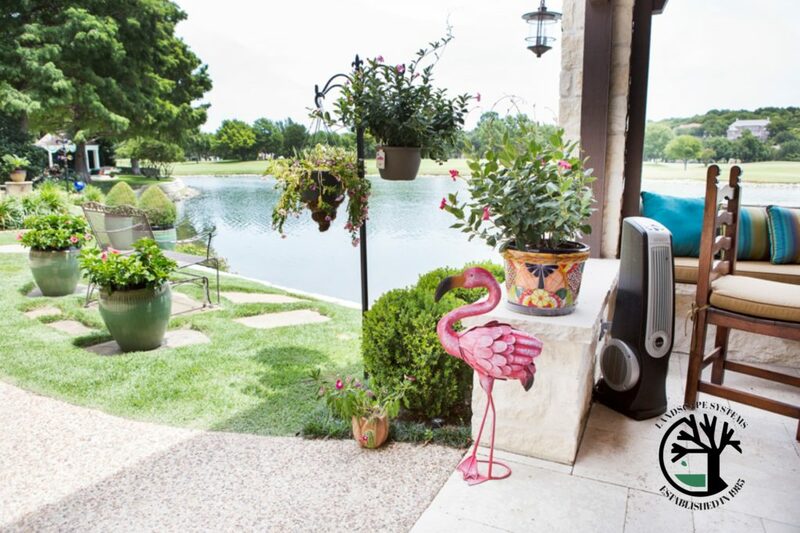 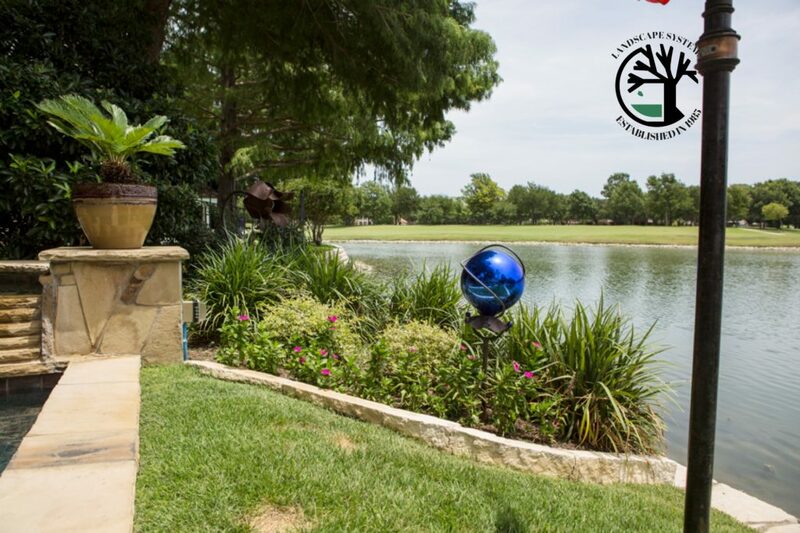 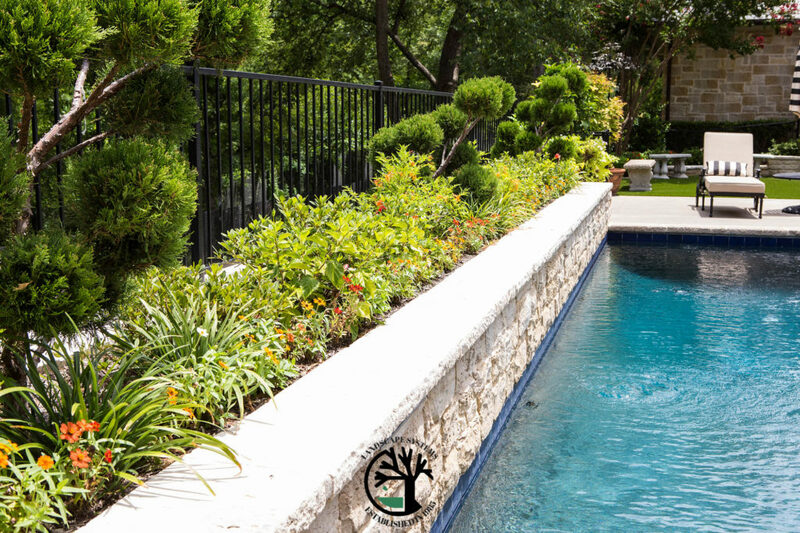 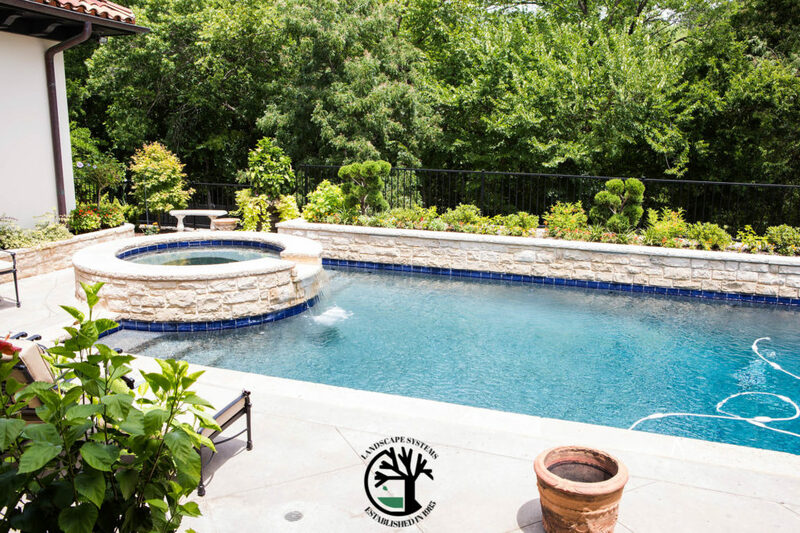 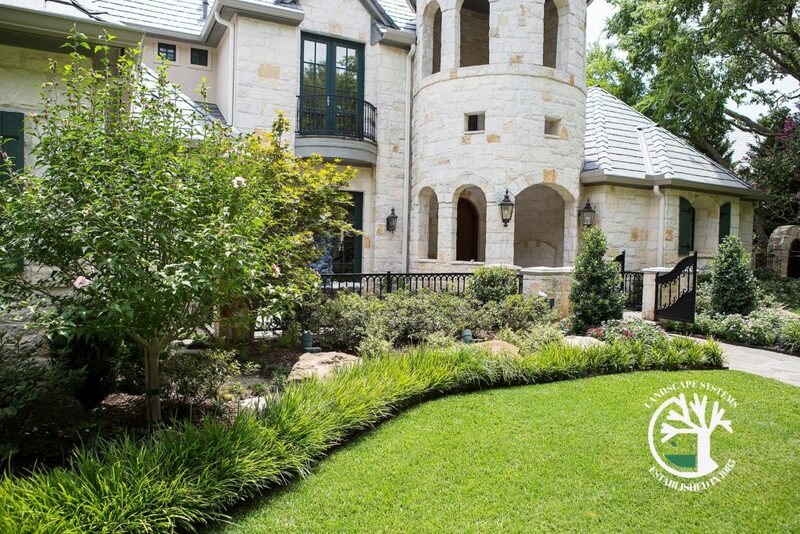 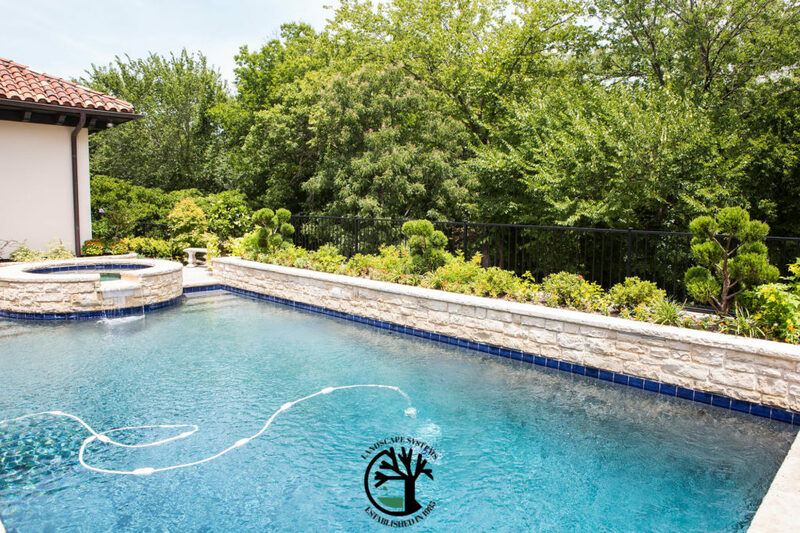 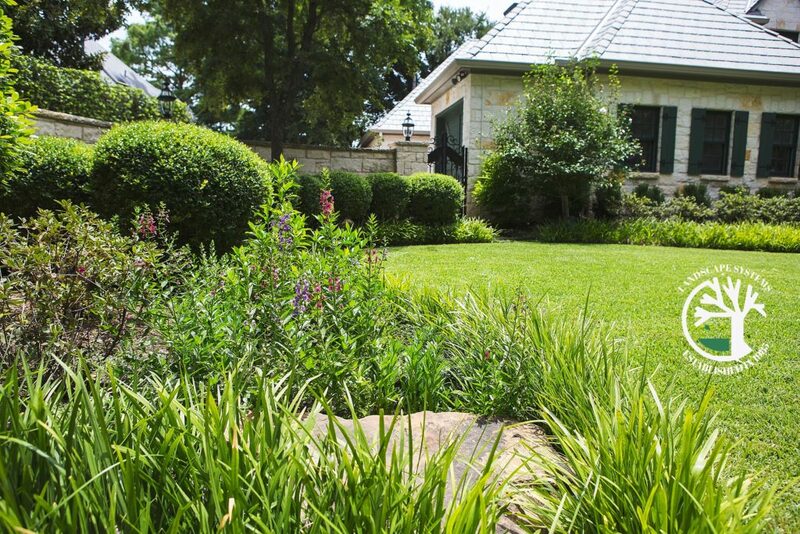 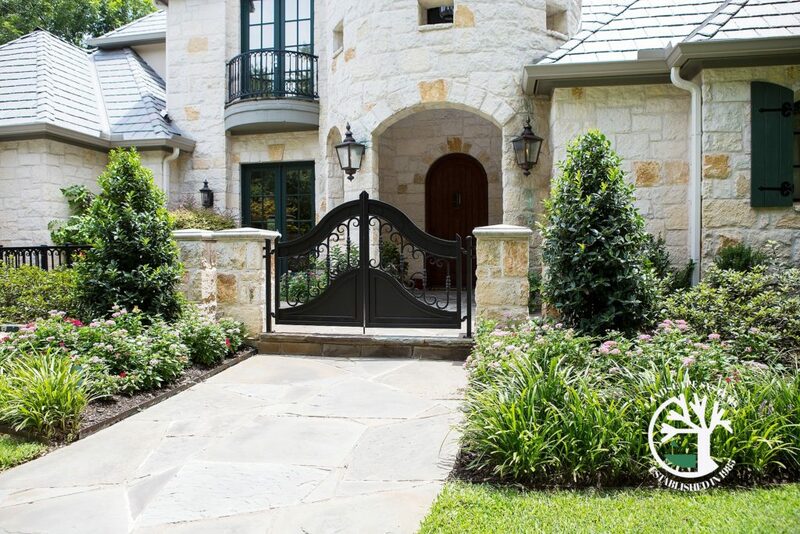 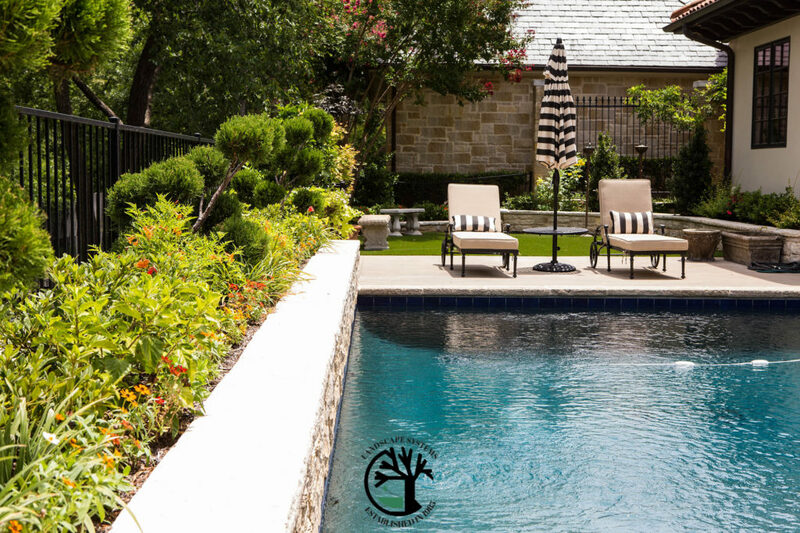 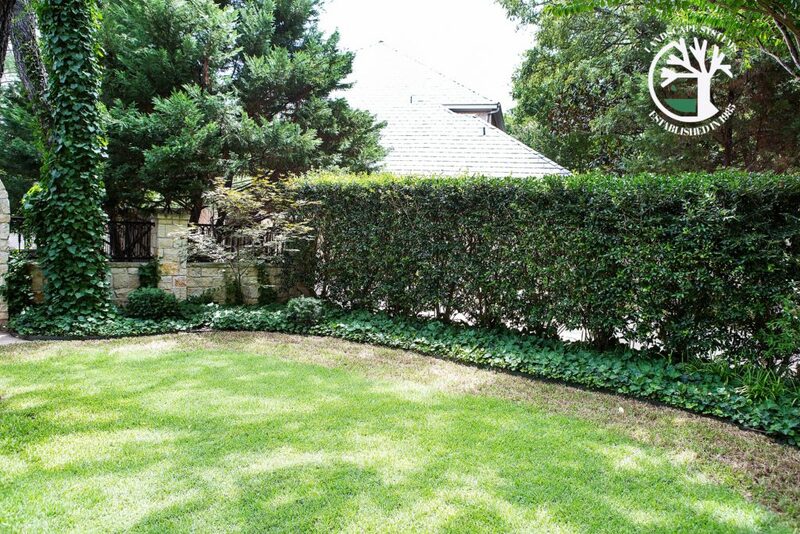 The property sits up high overlooking a green belt so their backyard view was already a great one, but they wanted to take it to the next level with stunning pool landscaping and a small green space area to create their own backyard oasis. 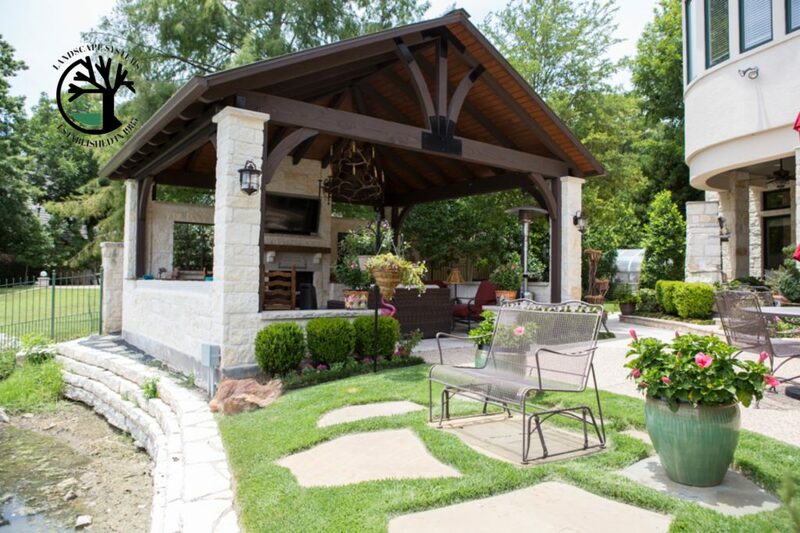 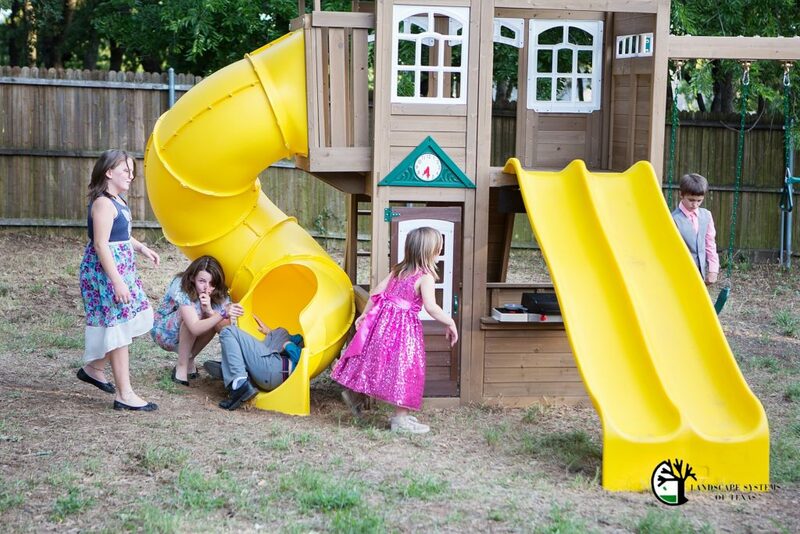 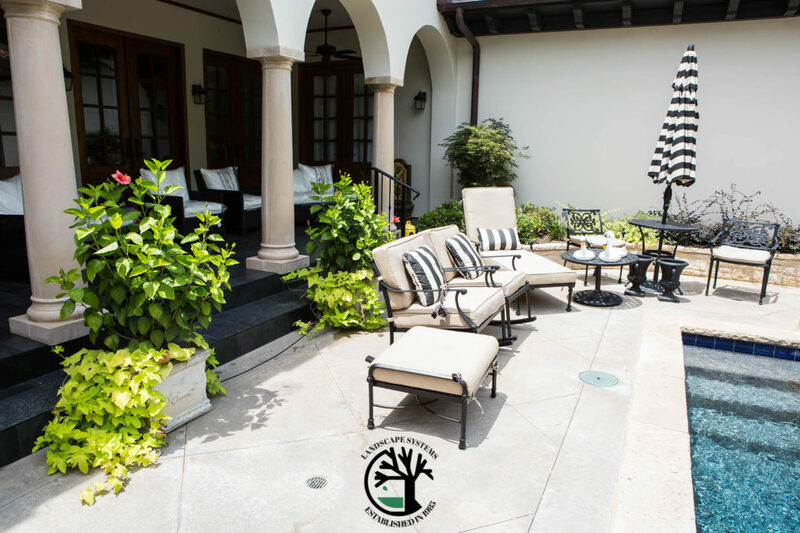 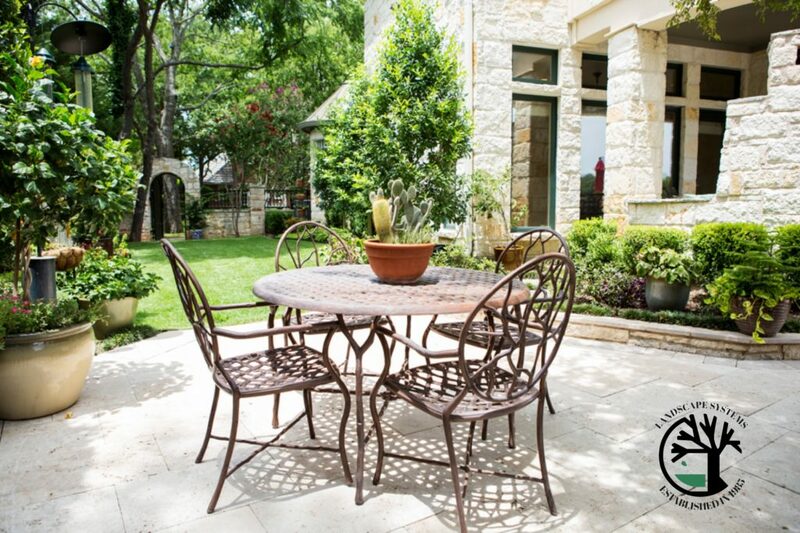 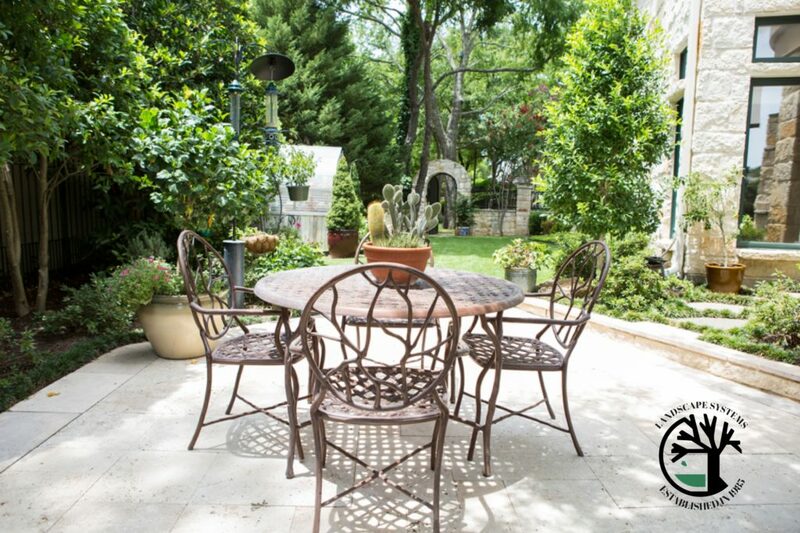 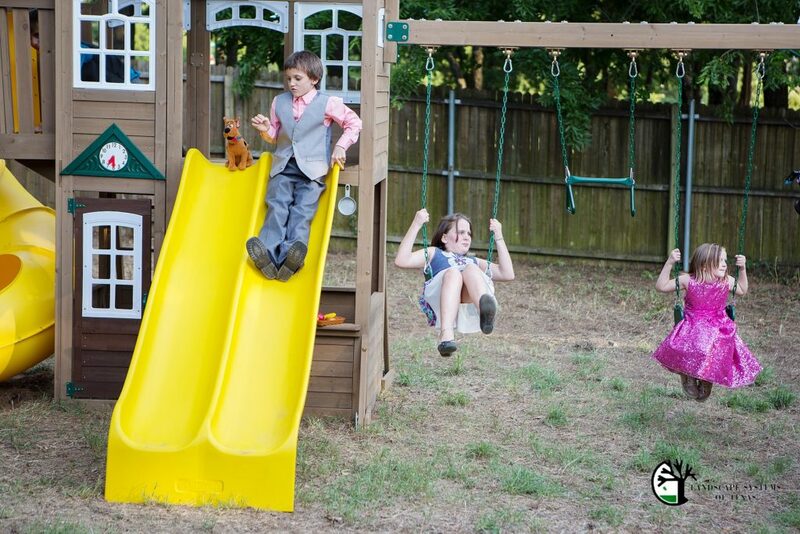 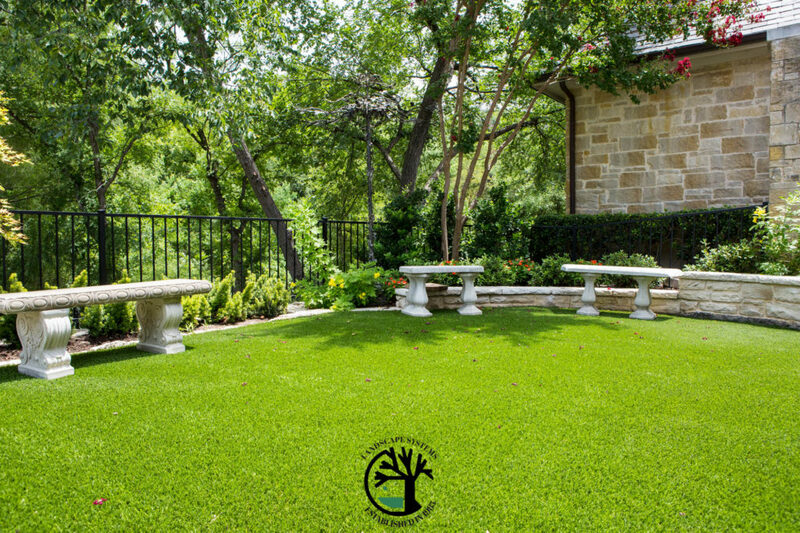 With plenty of seating scattered throughout and lush greens at all heights this back yard quickly became one of our favorites. 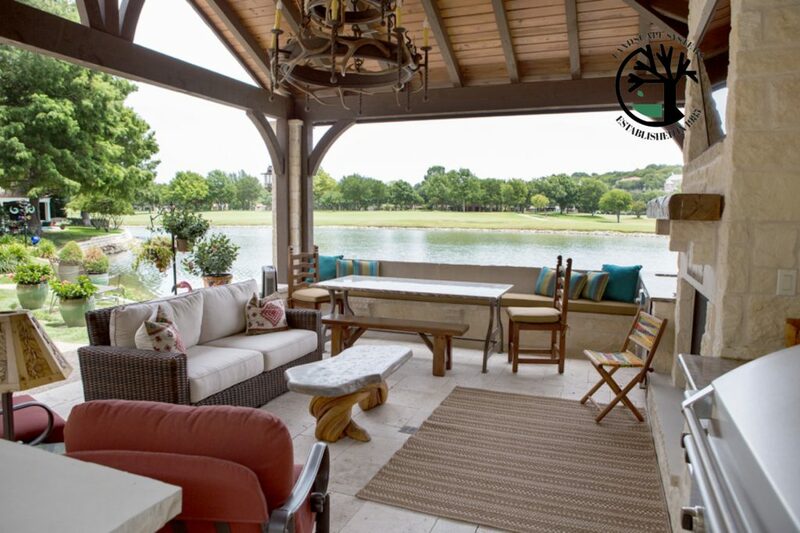 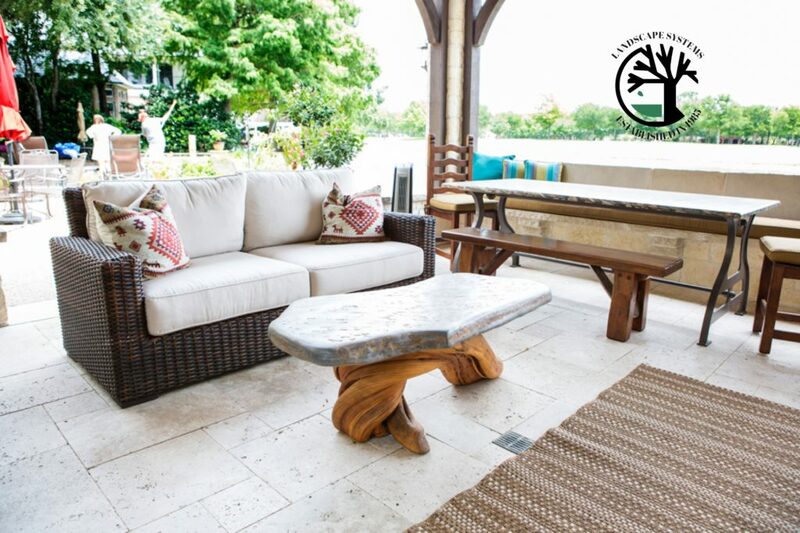 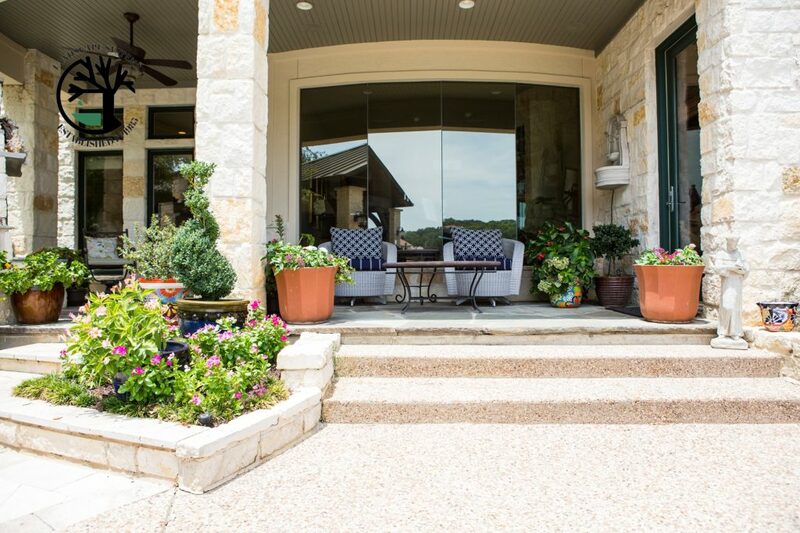 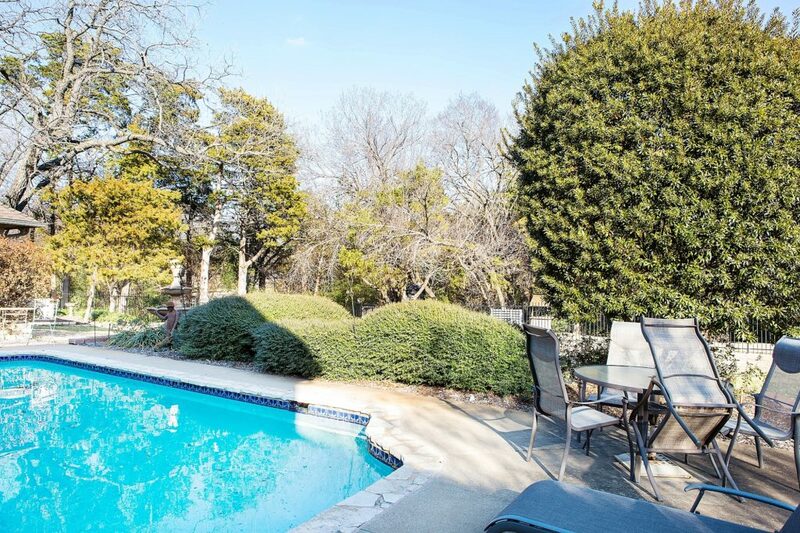 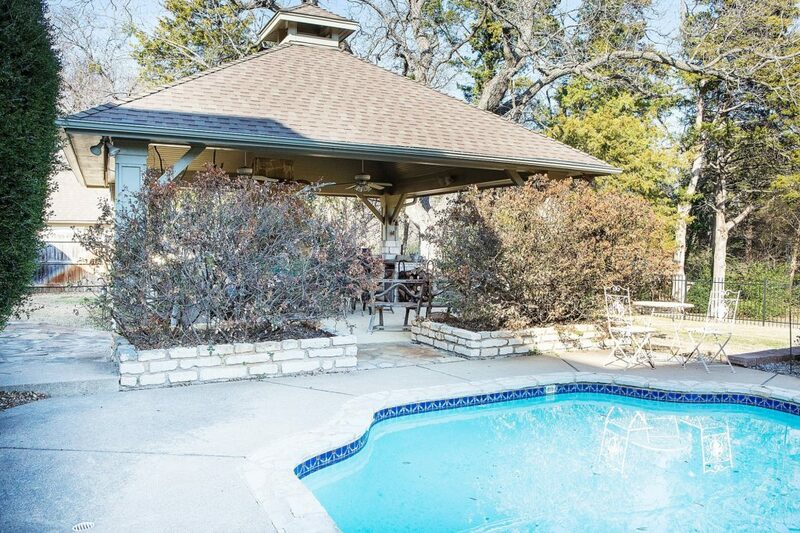 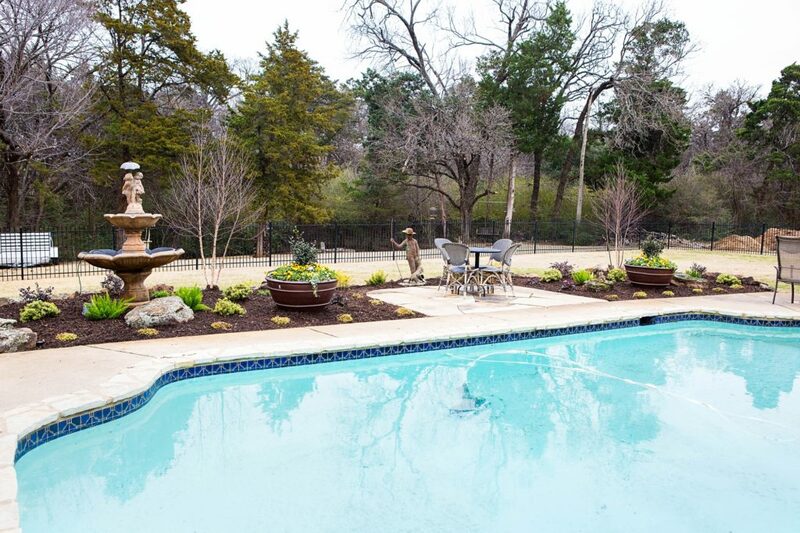 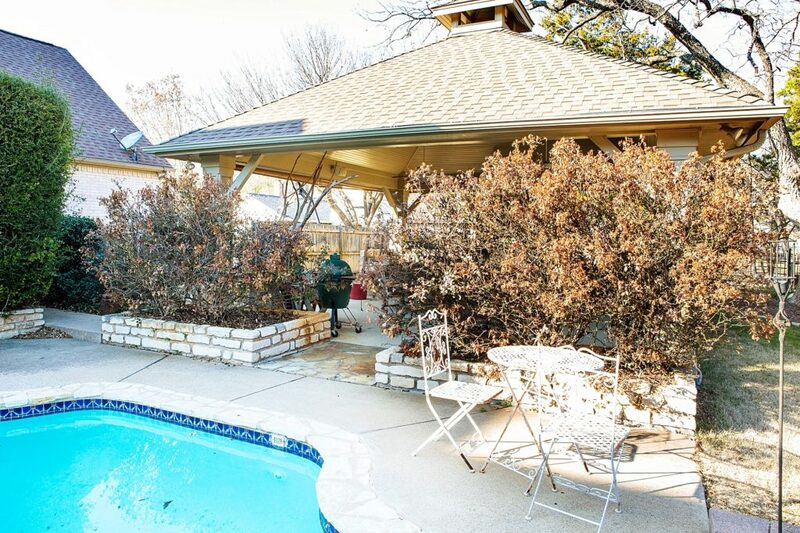 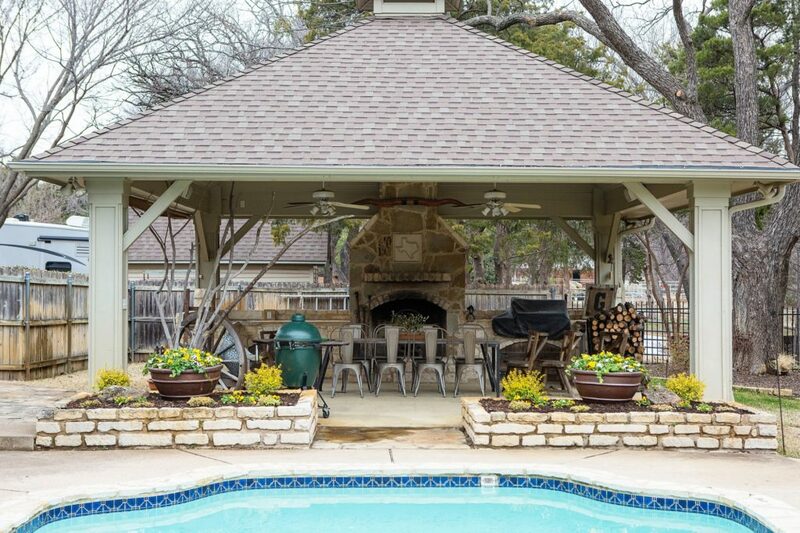 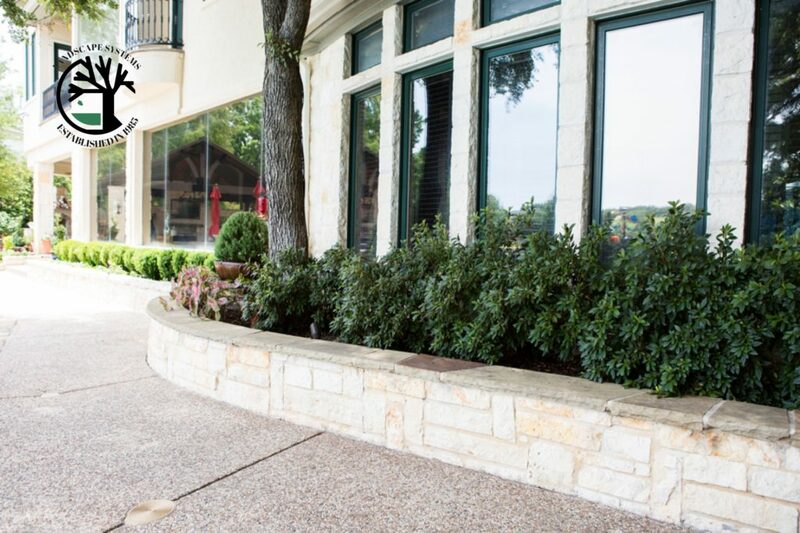 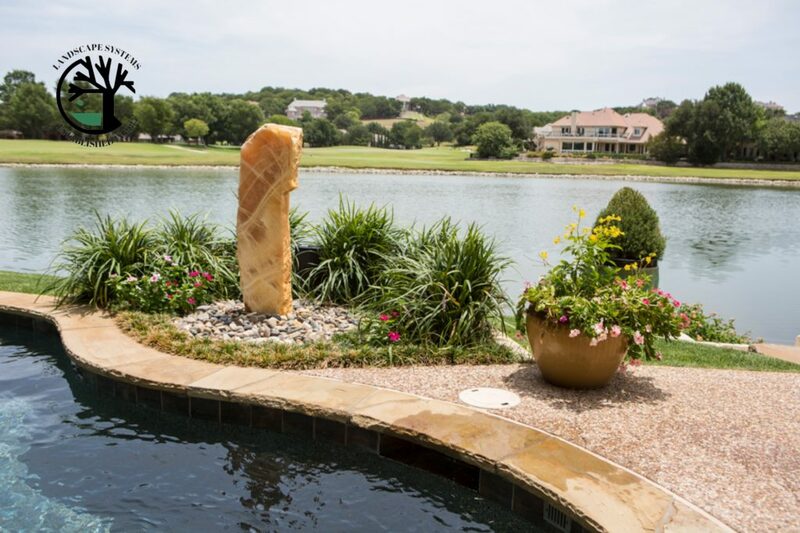 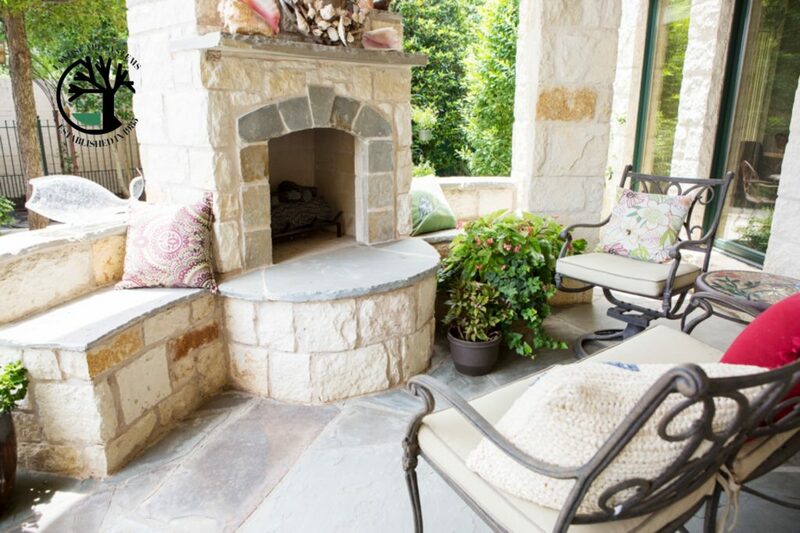 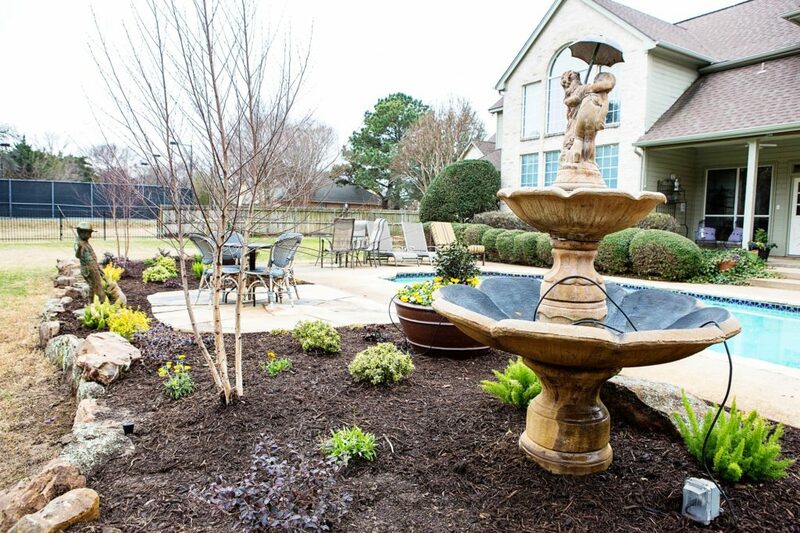 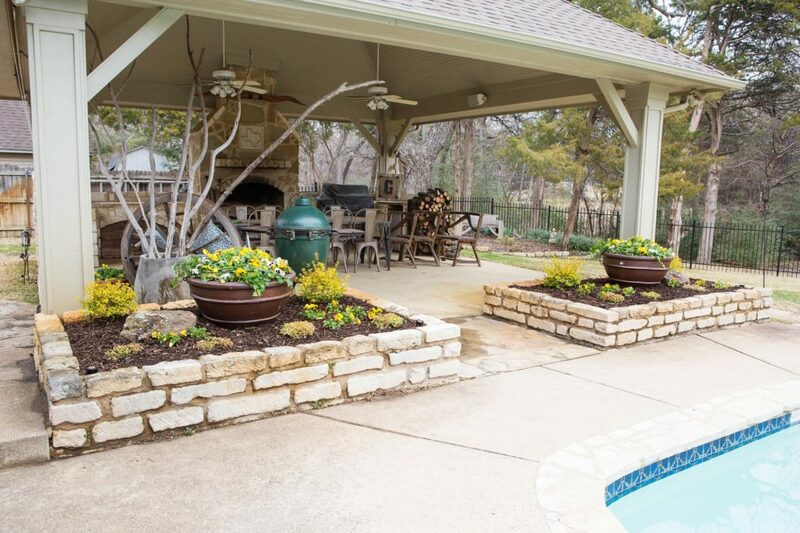 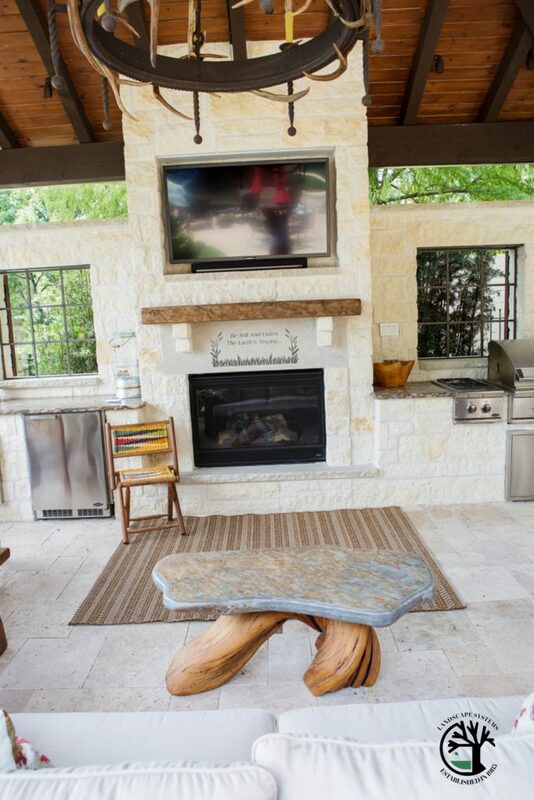 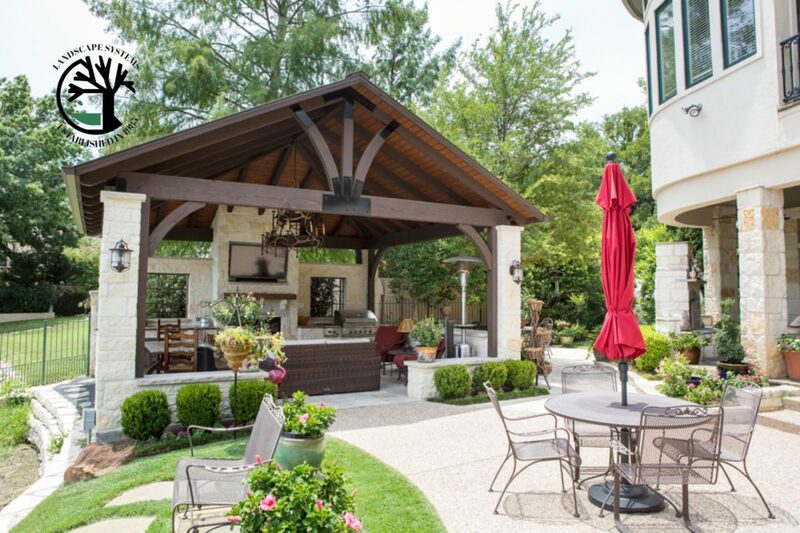 We envision leisurely days spent out there enjoying a glass of wine and relaxing! 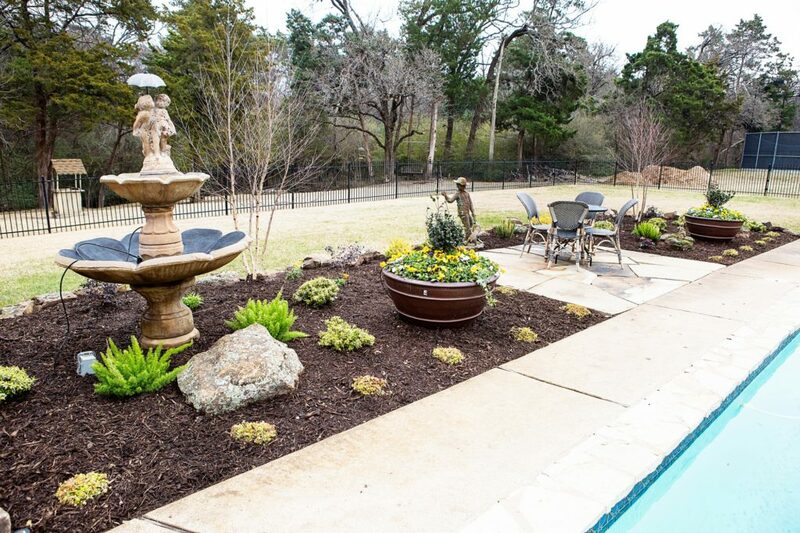 The main bed that lines the pool is made up of pom pom junipers, liriope plants, zinnias, and esperanza. 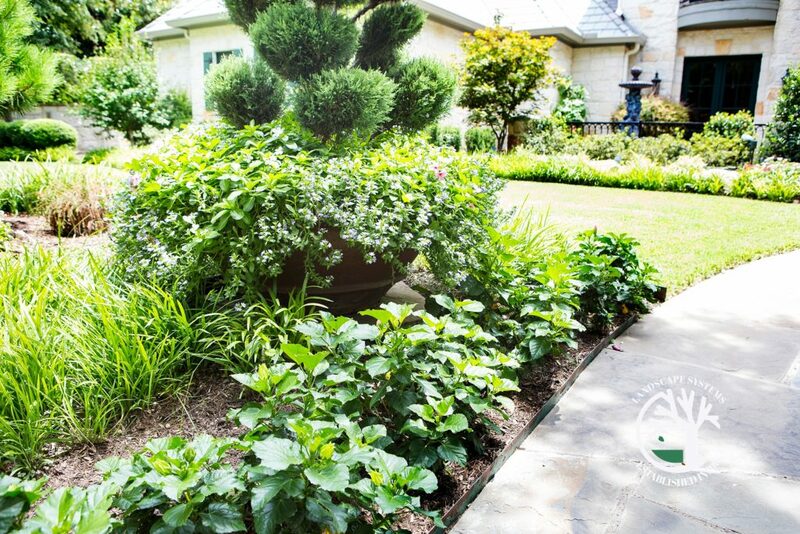 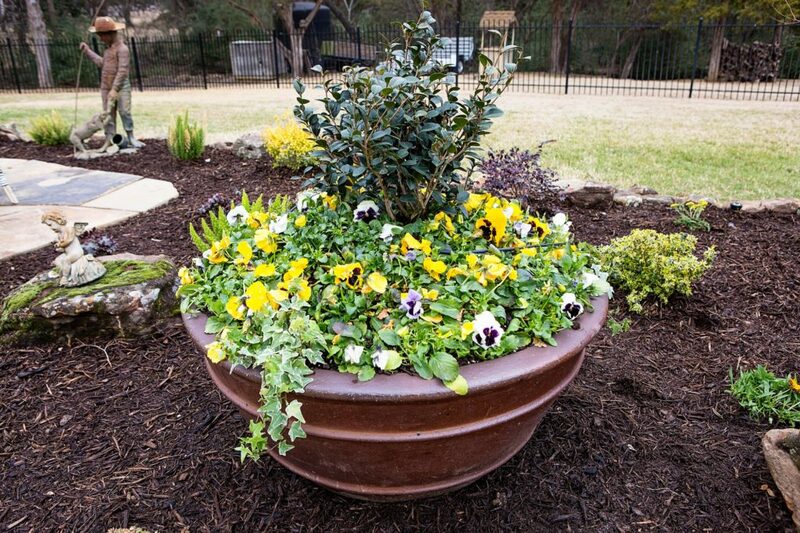 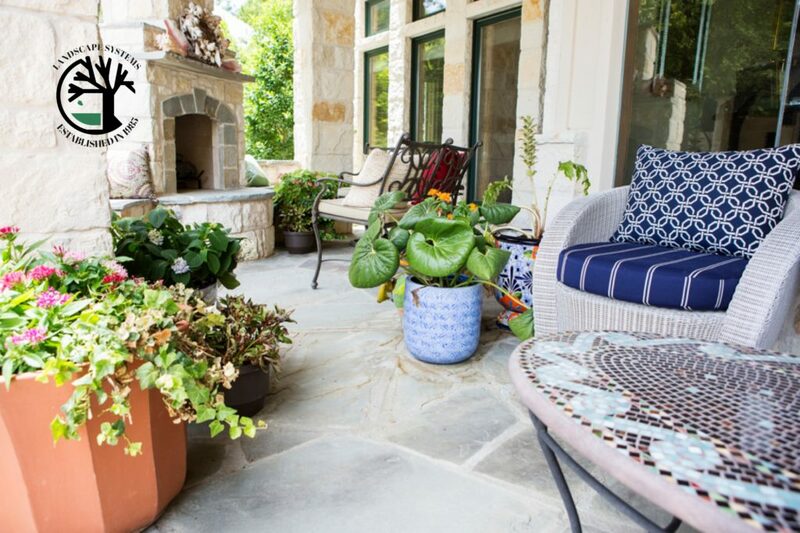 The tall pots that sit on either side of the built in bed are filled with hibiscus for height, periwinkle and dianthus for color, and sweet potato ivy as the spillers hanging down creating that billowy look. 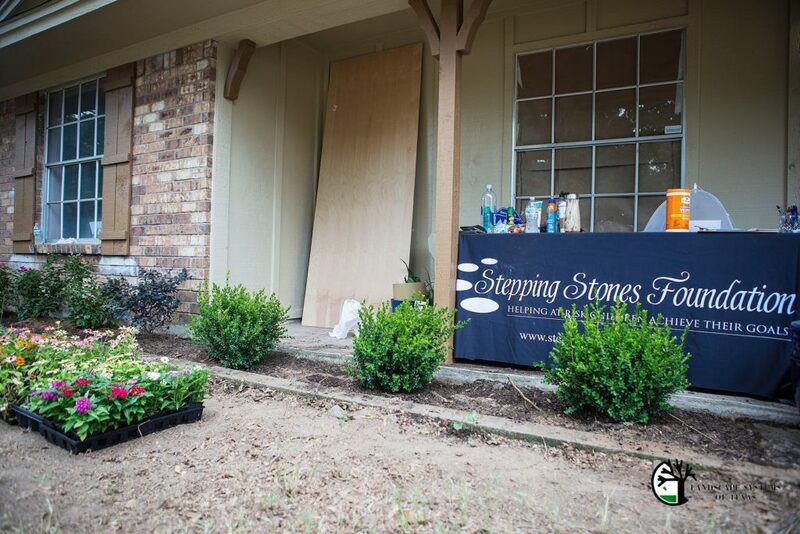 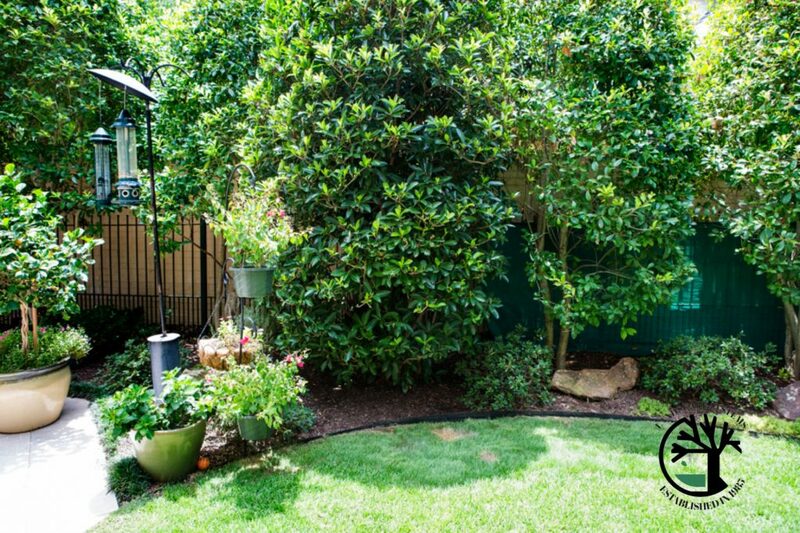 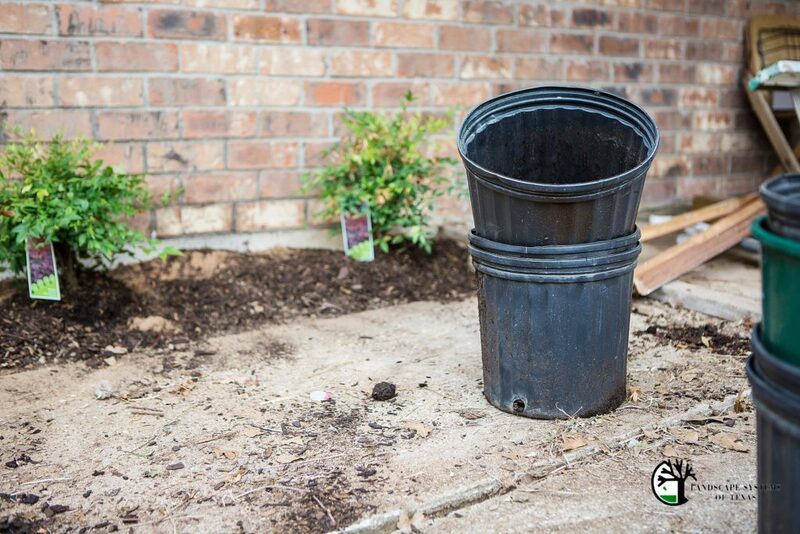 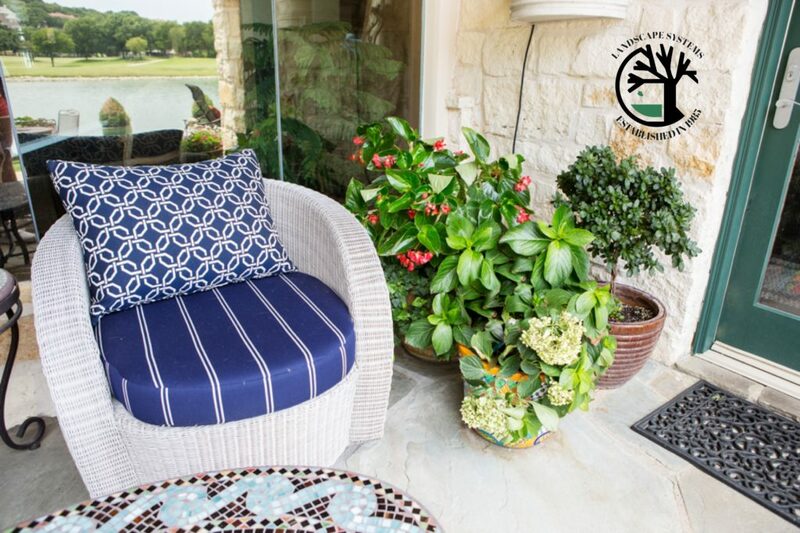 And you know no back yard landscaping is complete without bringing the plants up to the sitting area as well! 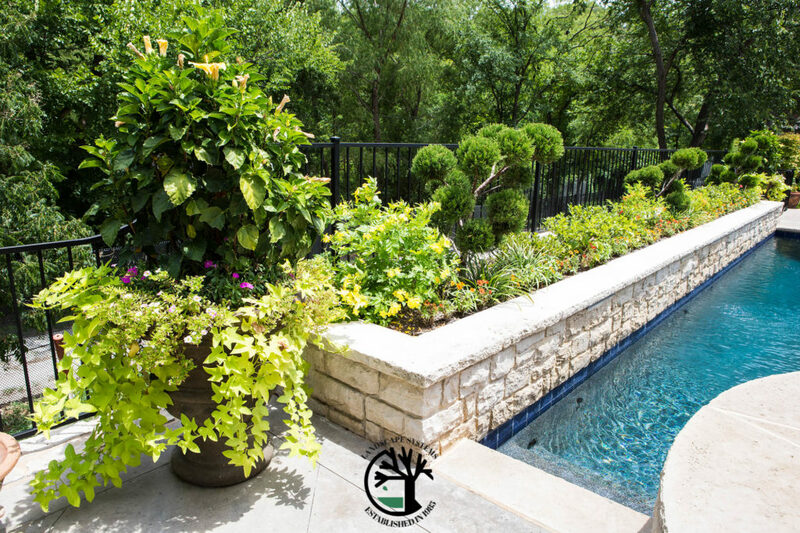 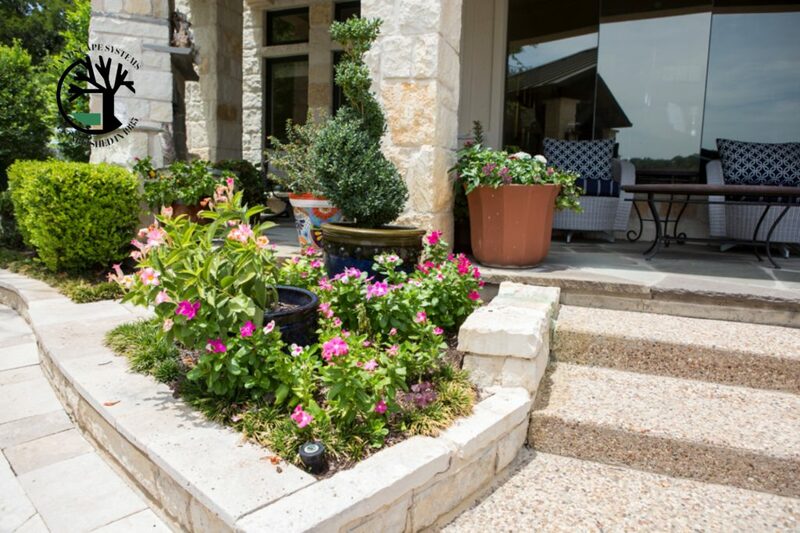 The pots that sit on the stairs are filled with hibiscus and sweet potato ivy as well for that cohesive look to mirror the pots on either side of the pool bed. 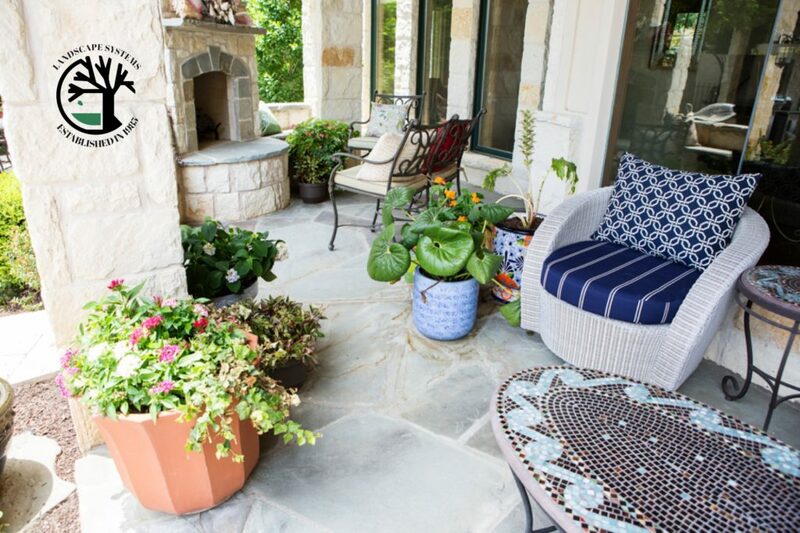 Now, no matter where you choose to sit, your views are always filled with flowers and happiness. 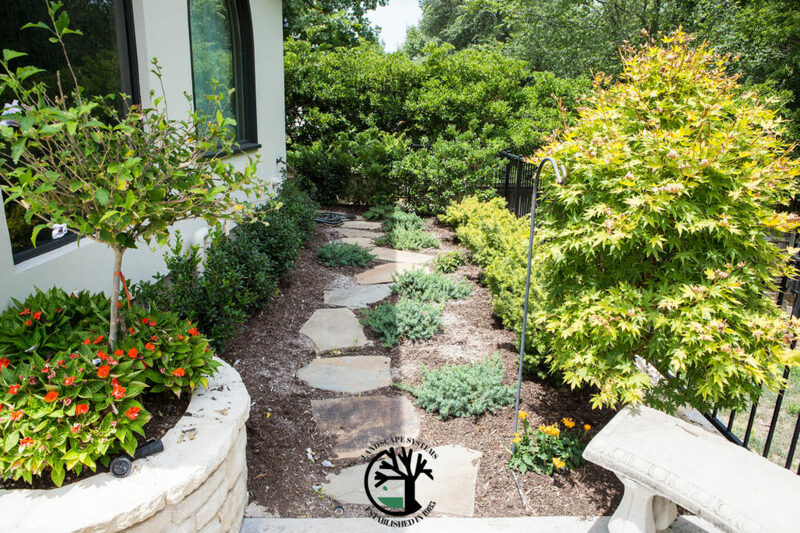 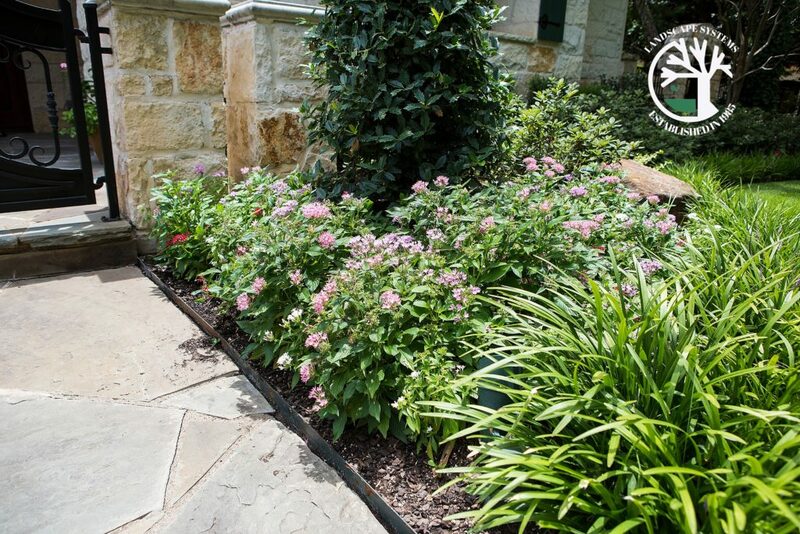 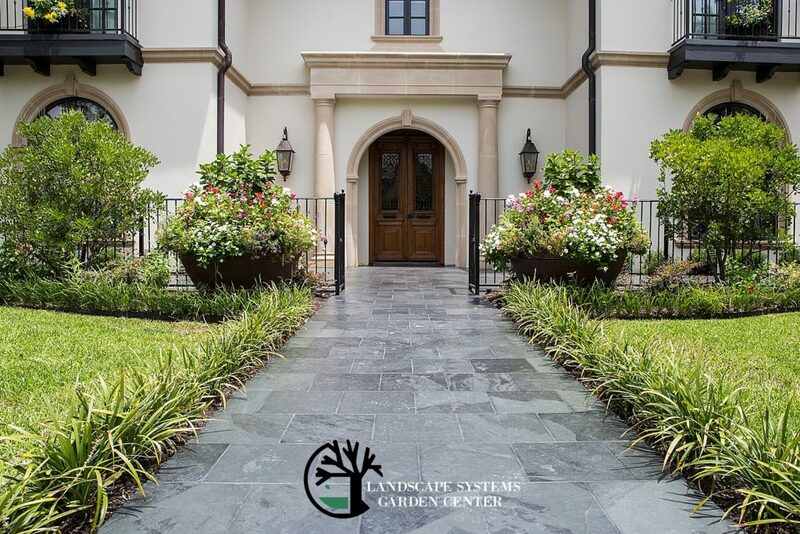 We never miss an opportunity to continue the lush plant life, so this garden path that leads to their front yard was no exception. 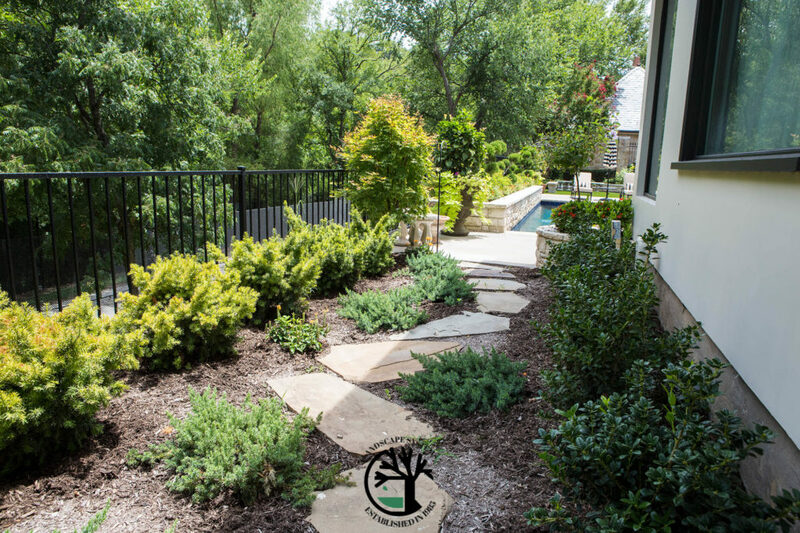 With a small flag stone walkway leading the way, we lined it with some simple gold tipped yews and birkwood holly plants. 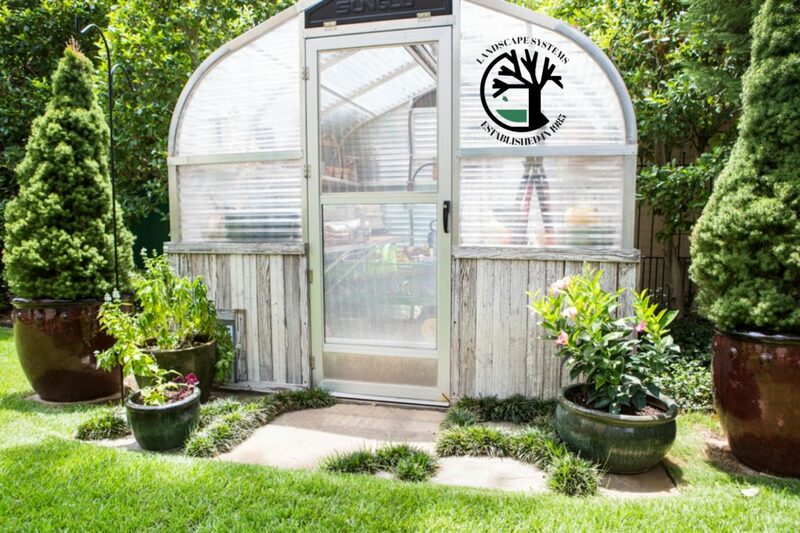 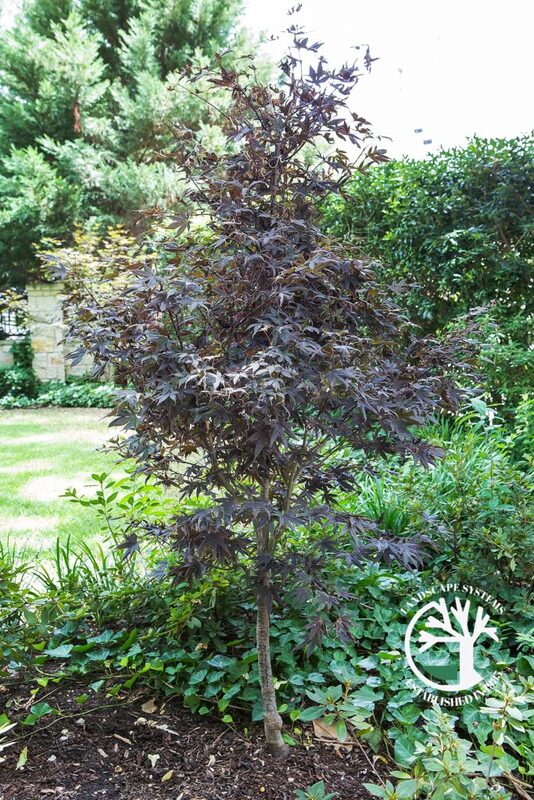 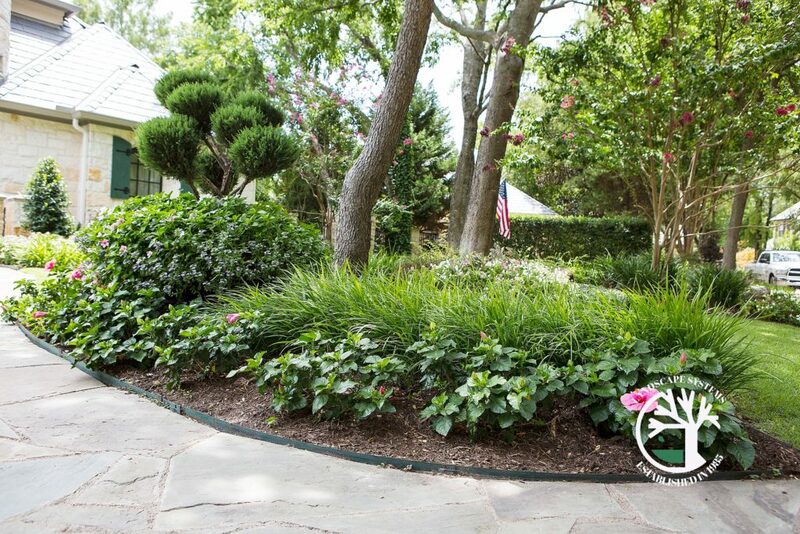 The tall tree to the right is a Japanese Maple, and the smaller tree to the left in the raised bed is an Althea tree. 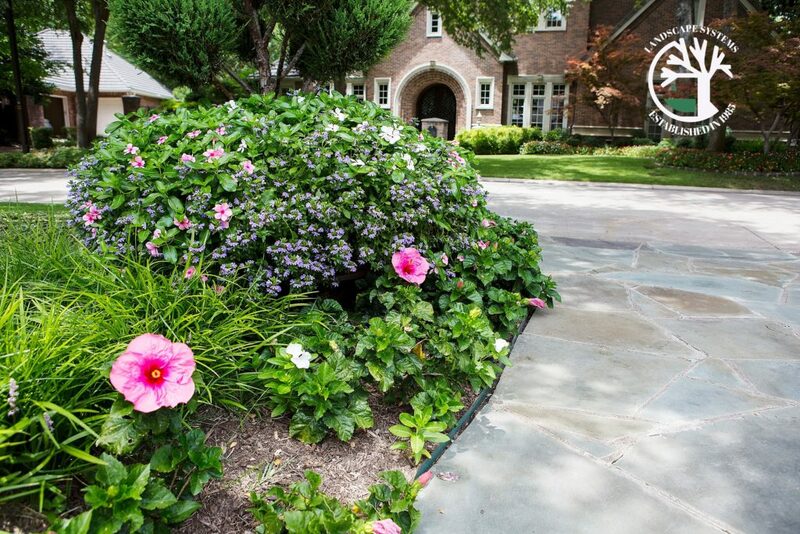 At the base of the Althea tree are beautiful orange new guinea impatiens. 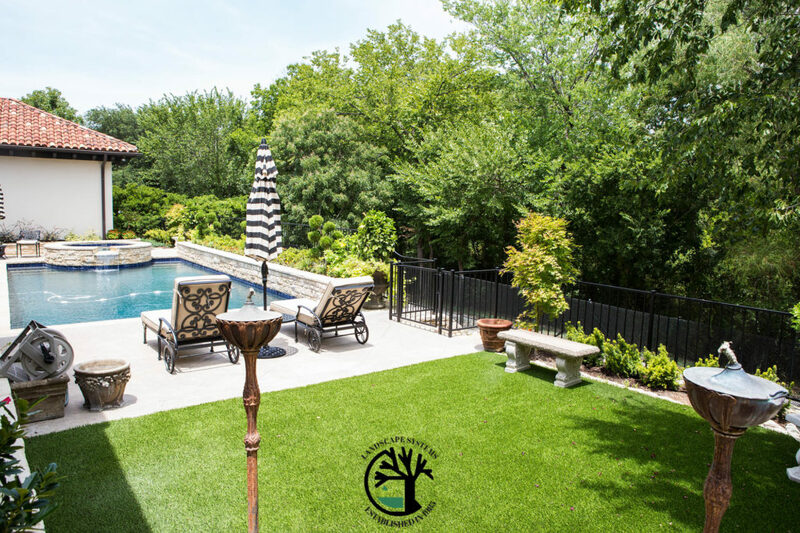 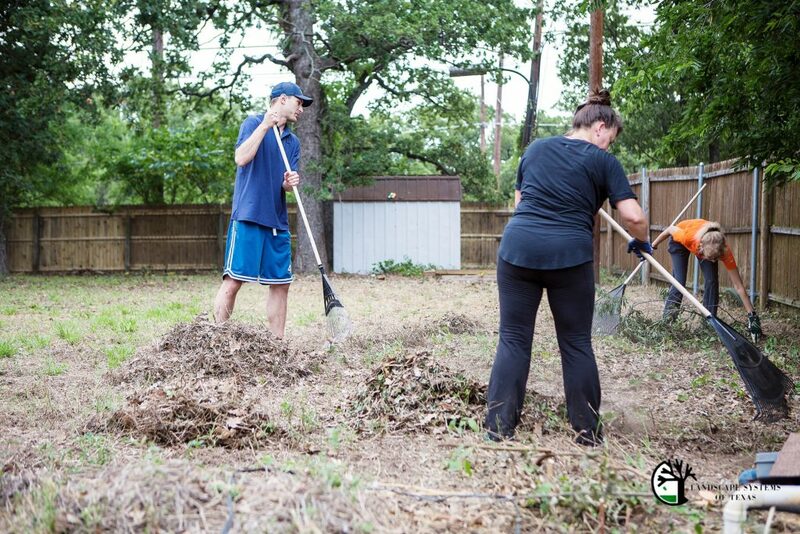 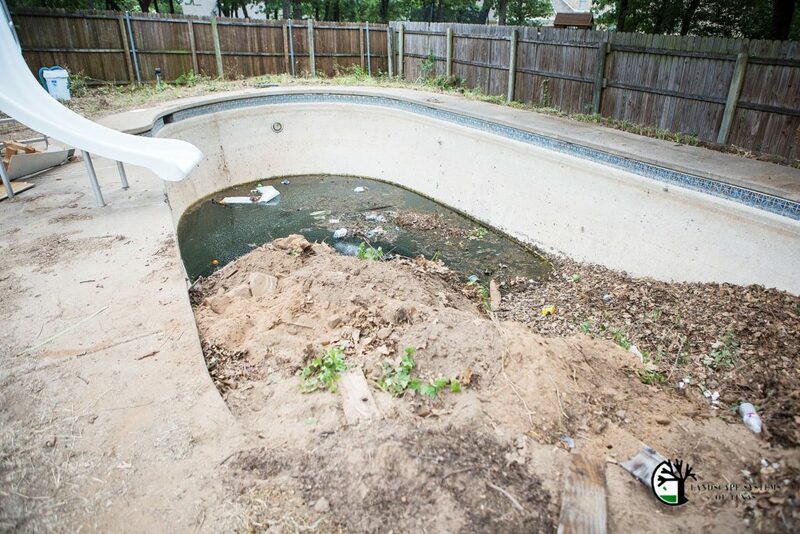 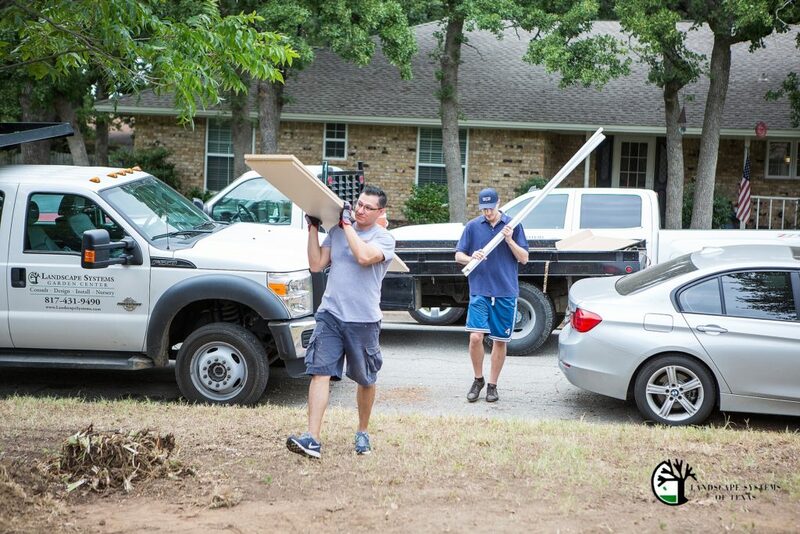 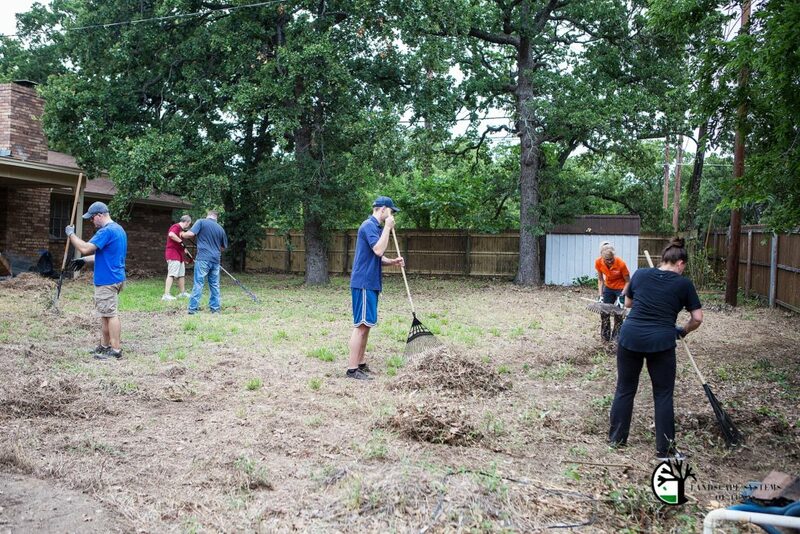 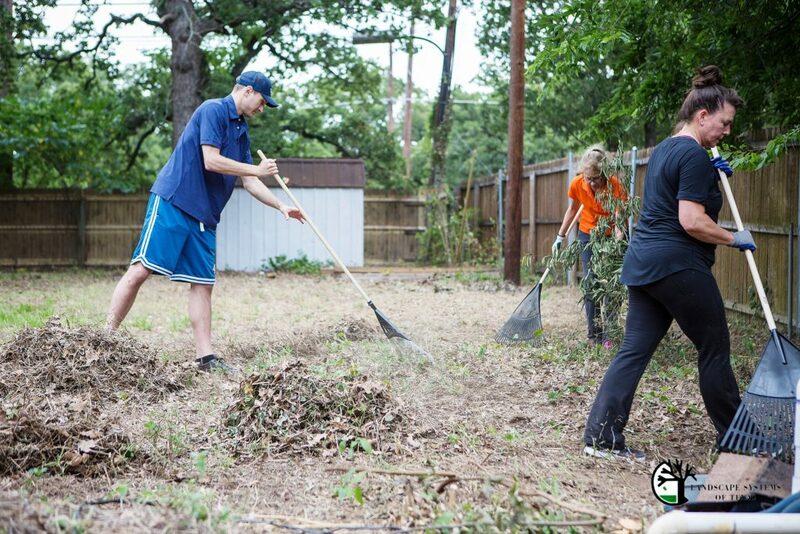 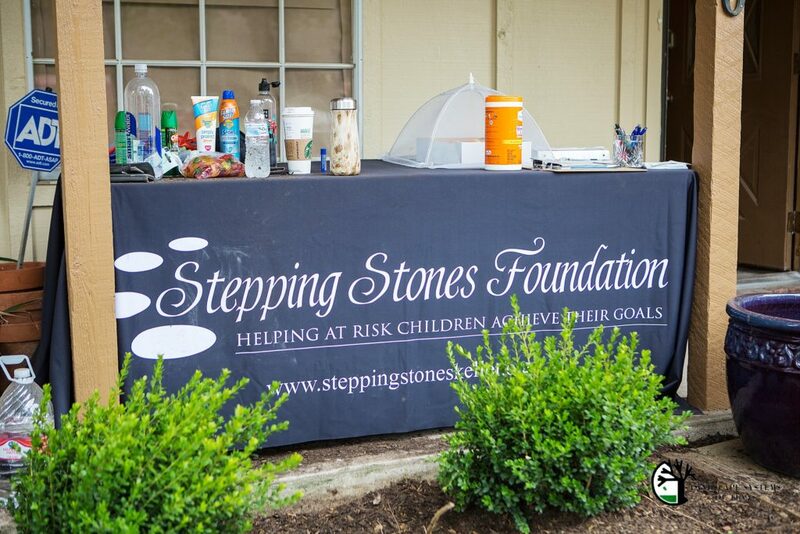 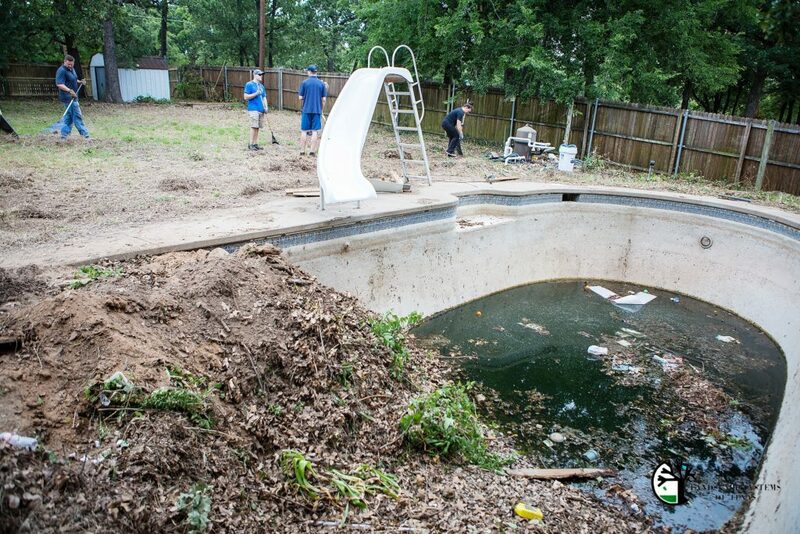 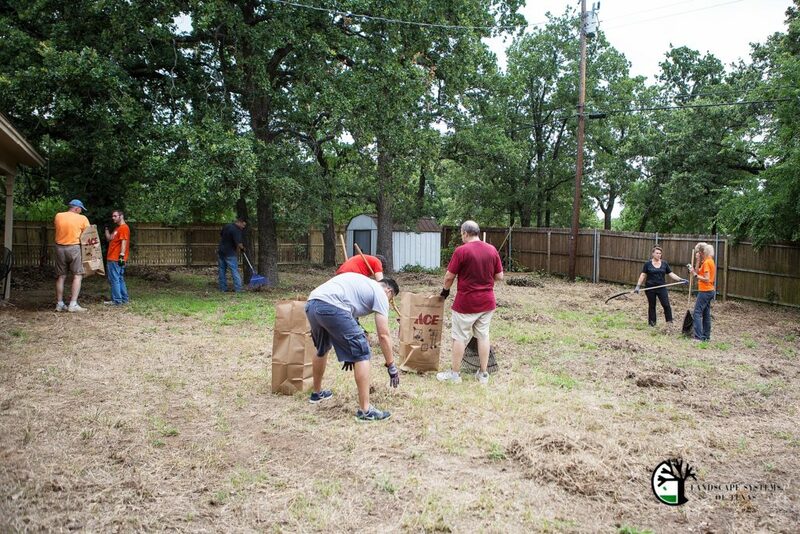 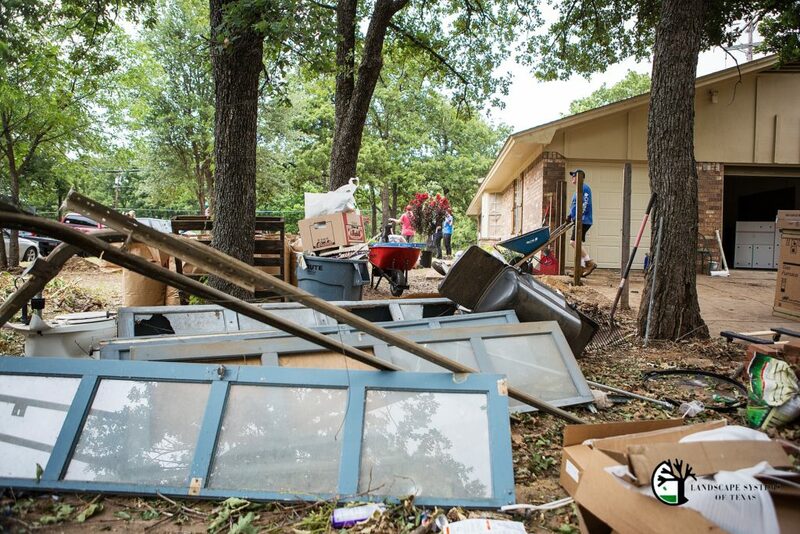 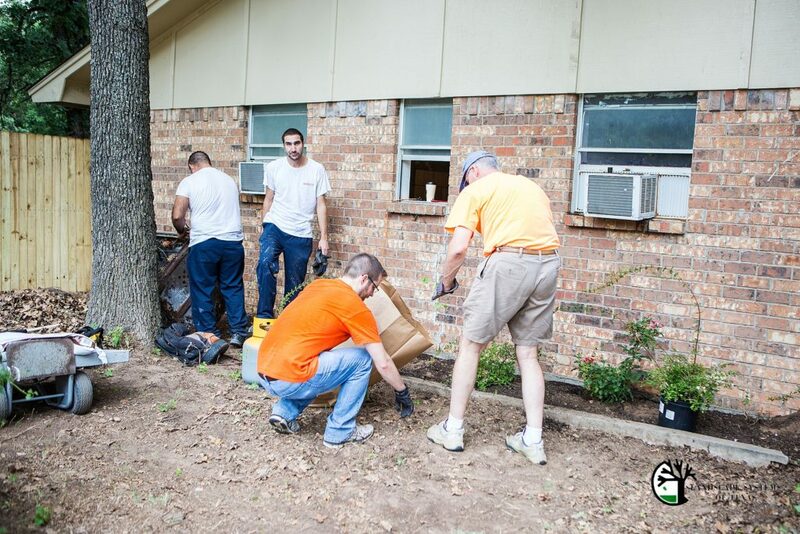 Since the pool and patio take up the majority of their back yard we wanted them to still have some green space that was easy to maintain. 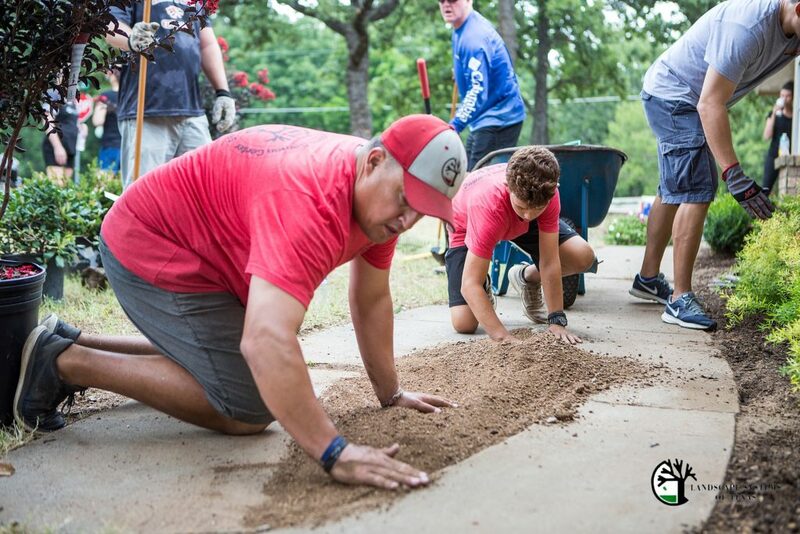 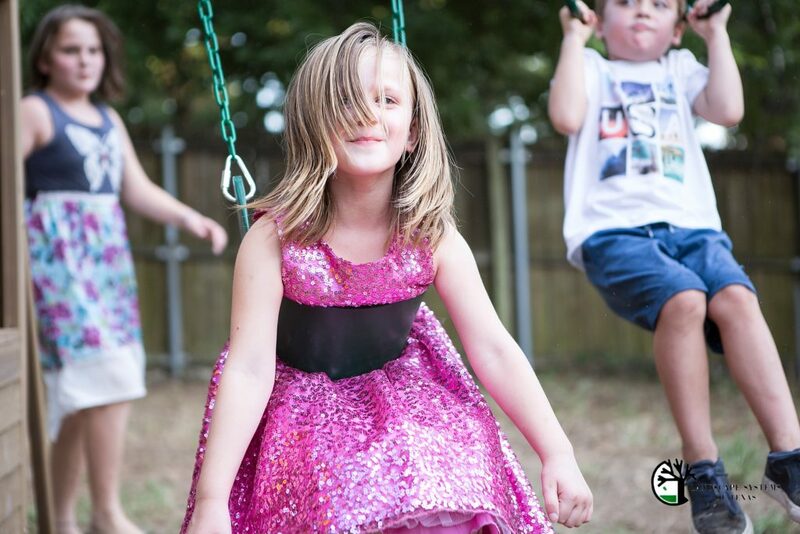 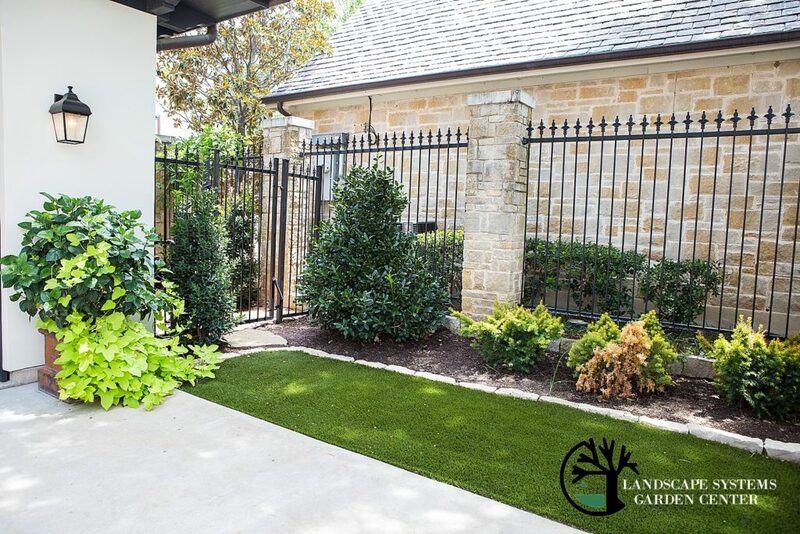 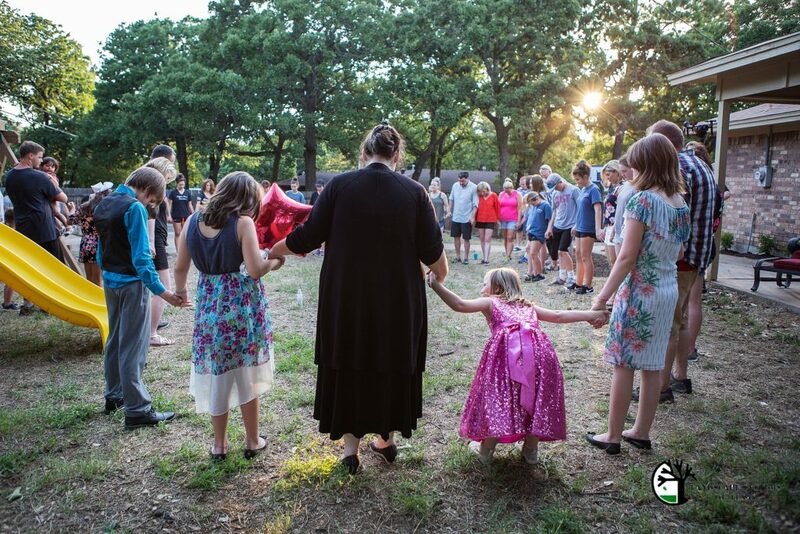 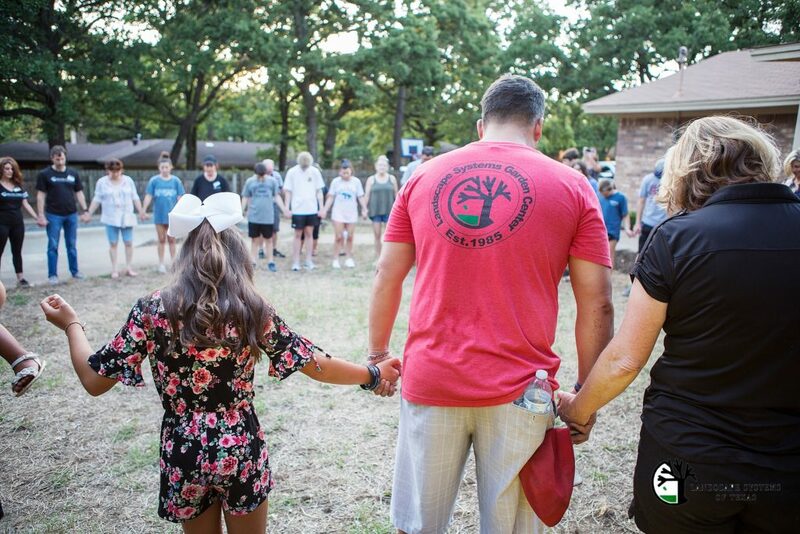 We installed synthetic turf so it extended the lush greens without the upkeep of having to mow, and it will look gorgeous and healthy year round. 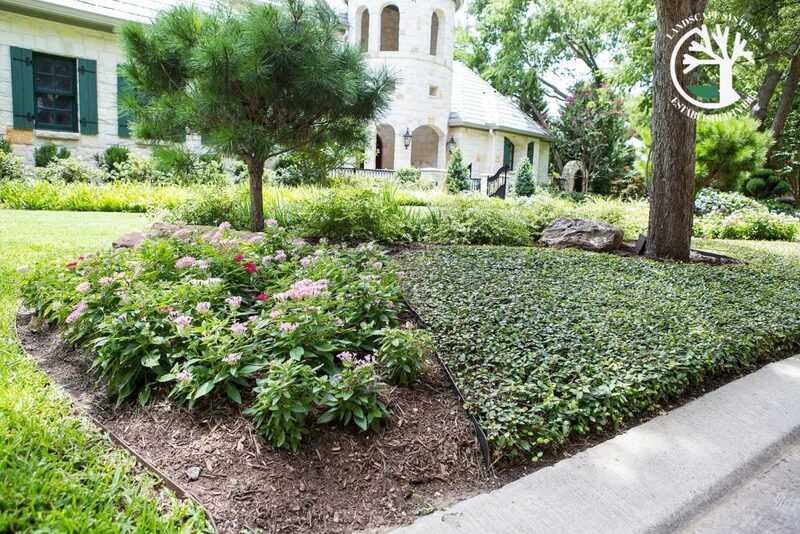 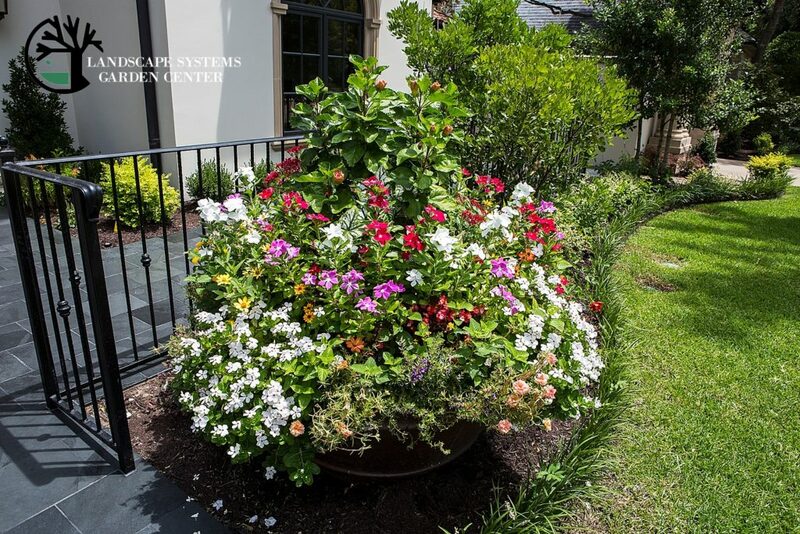 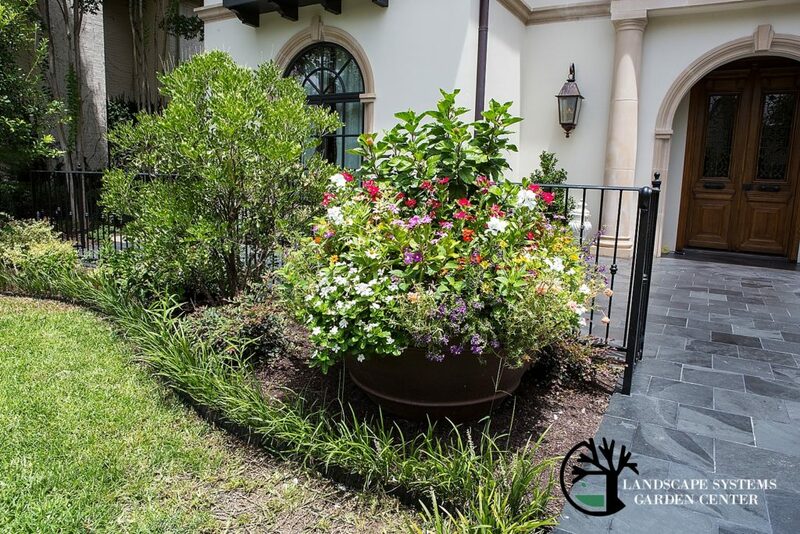 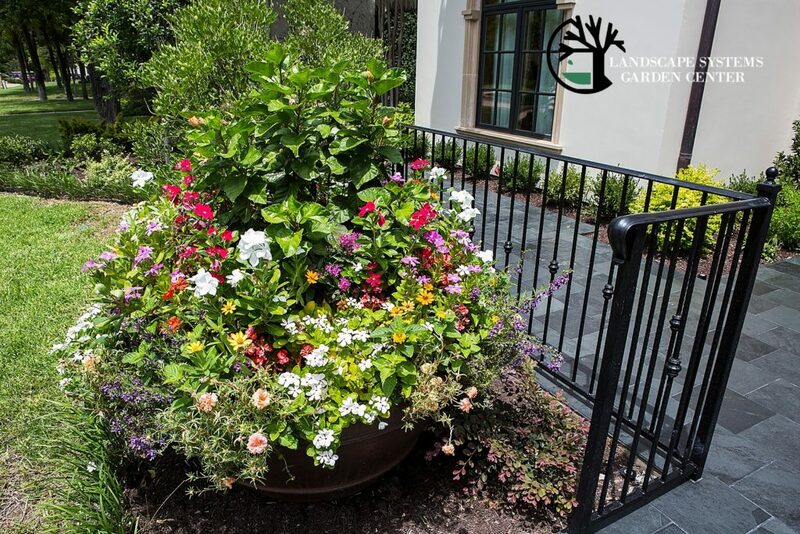 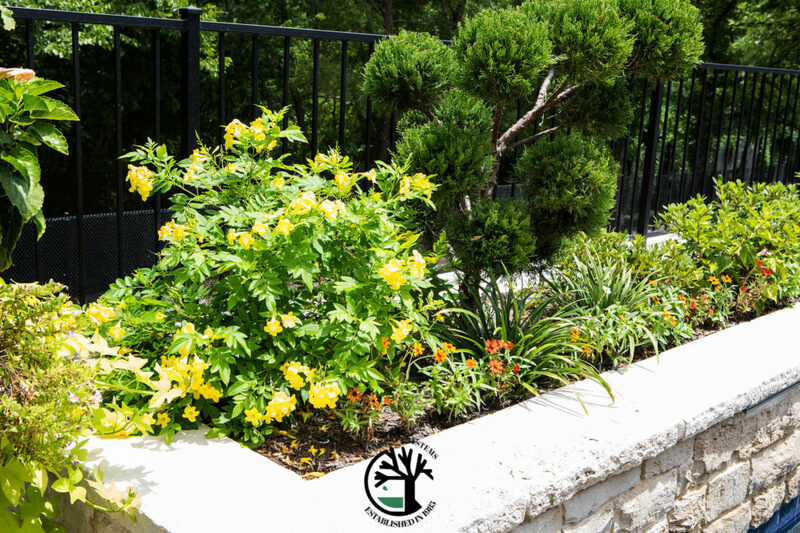 We filled the raised beds that surround this space with a combination of twist of lime abelian, azaleas, and orange new guinea impatiens.